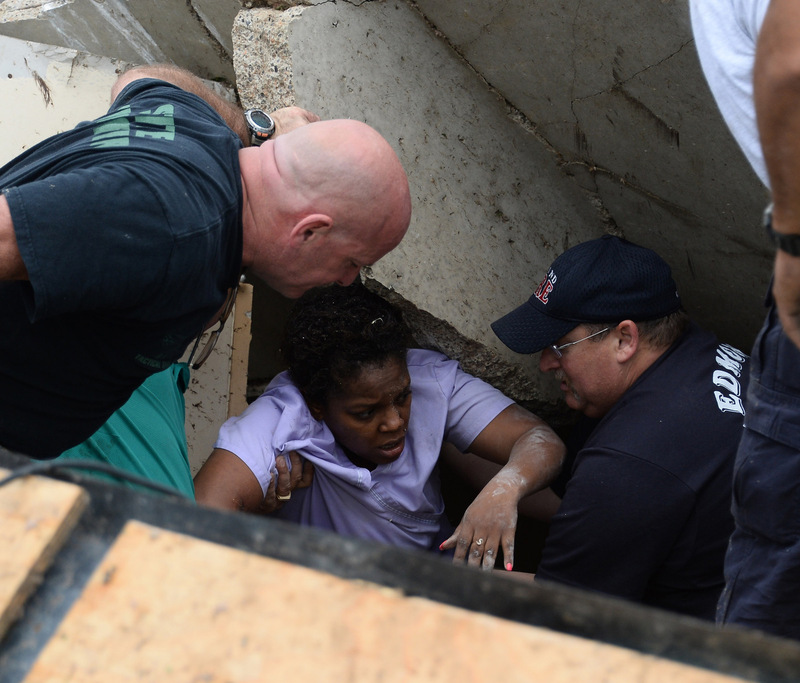 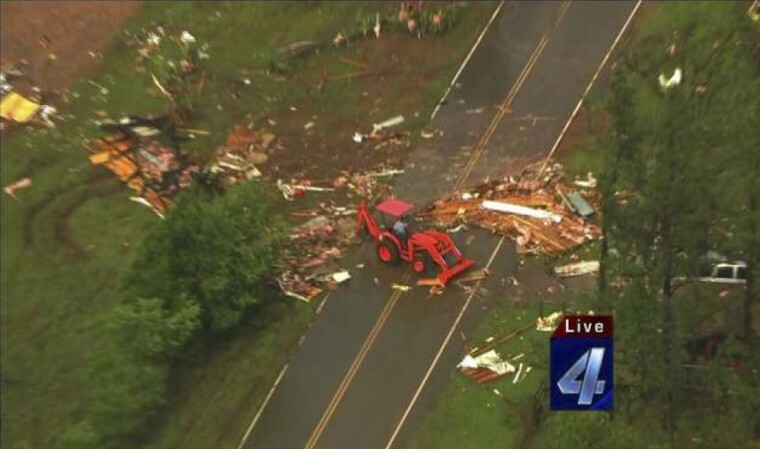 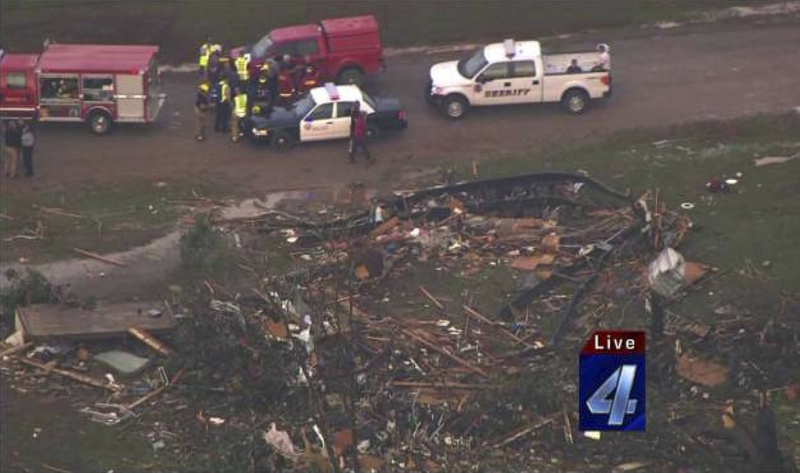 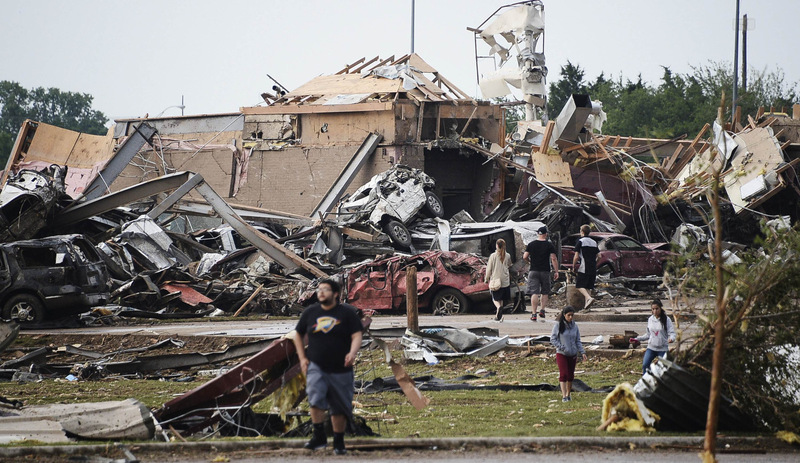 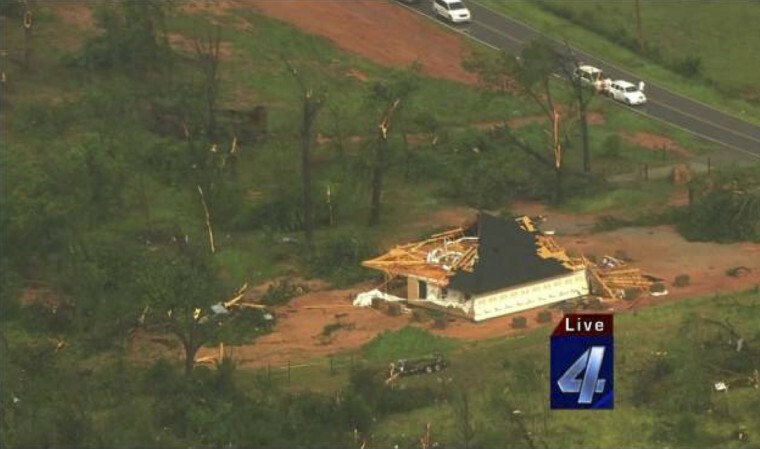 Emergency crews continued searching for survivors early Tuesday morning in an Oklahoma City suburb after a massive tornado tore through the area on Monday afternoon, killing at least 24 people and injuring hundreds more. 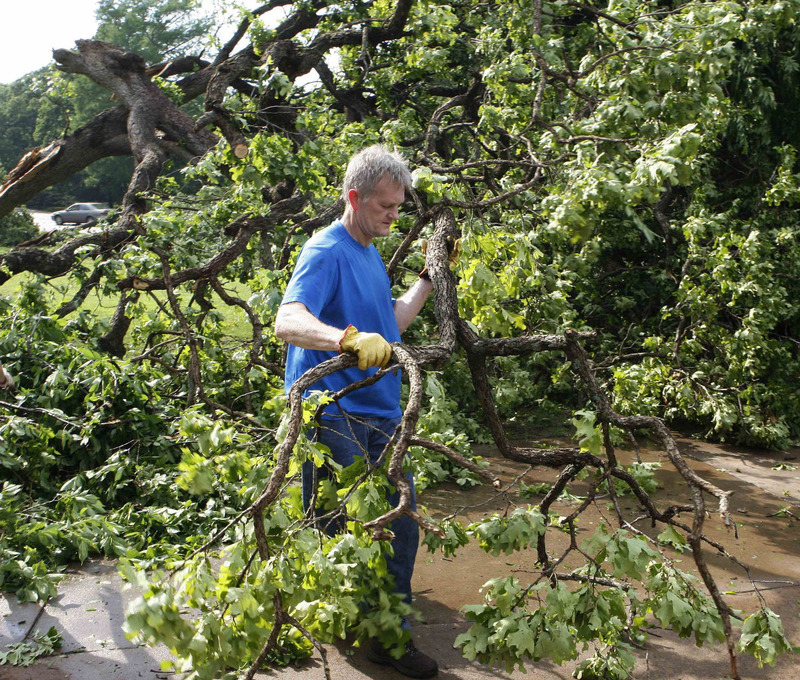 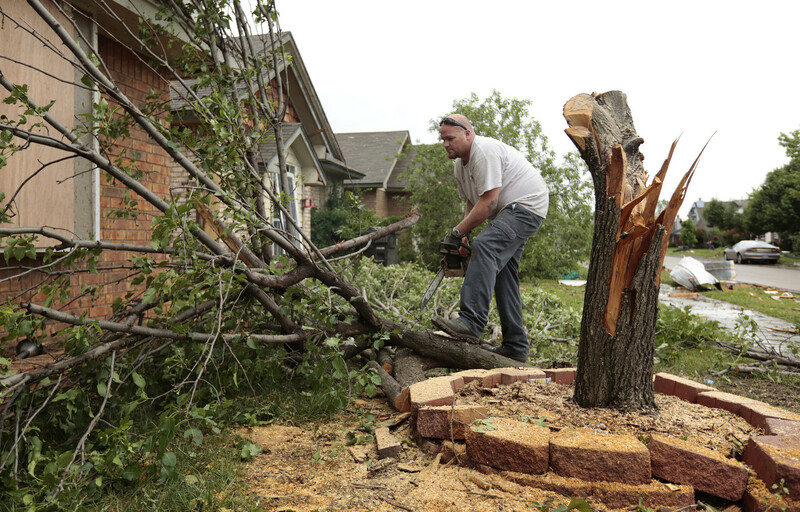 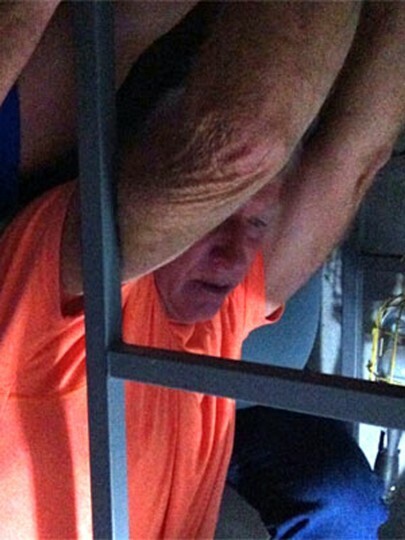 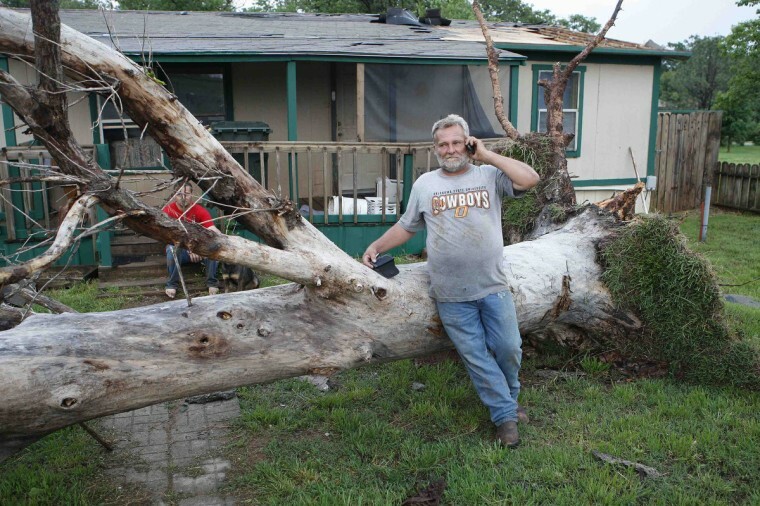 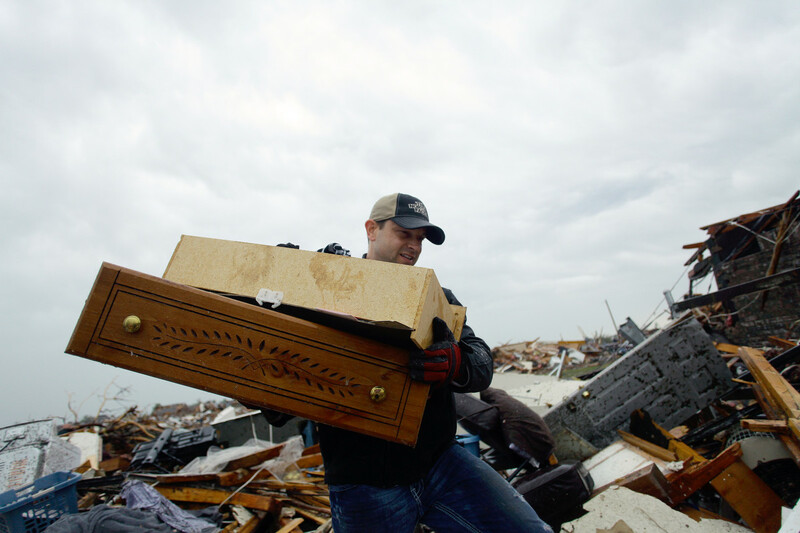 Dan Garland, of Moore, Oklahoma, holds down his cellar door during the tornado. 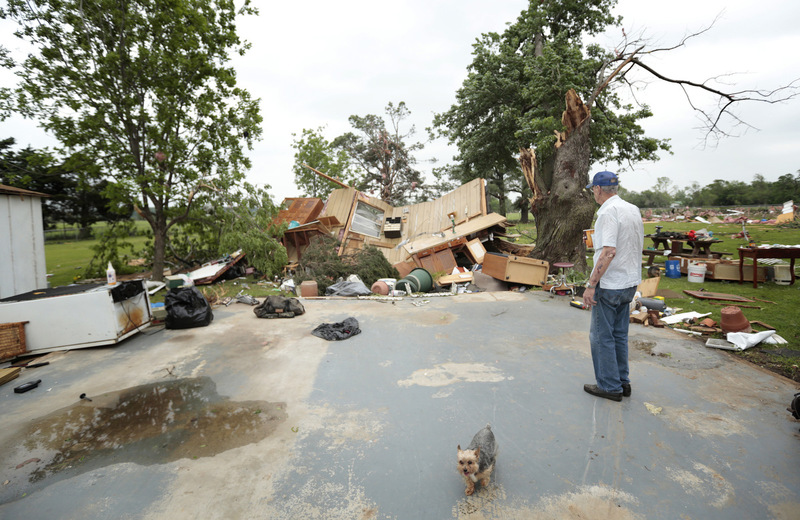 He and two other men had to hold down the door as the tornado blew out portions is his home. 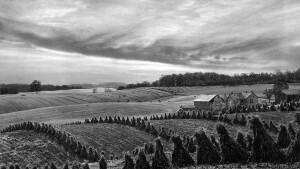 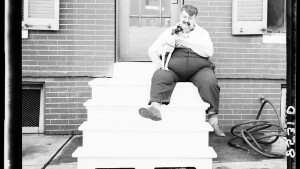 Photo courtesy of Dan Garland. 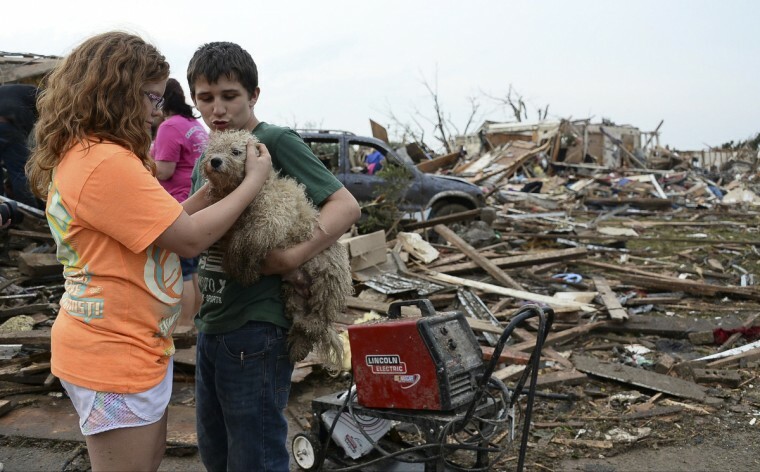 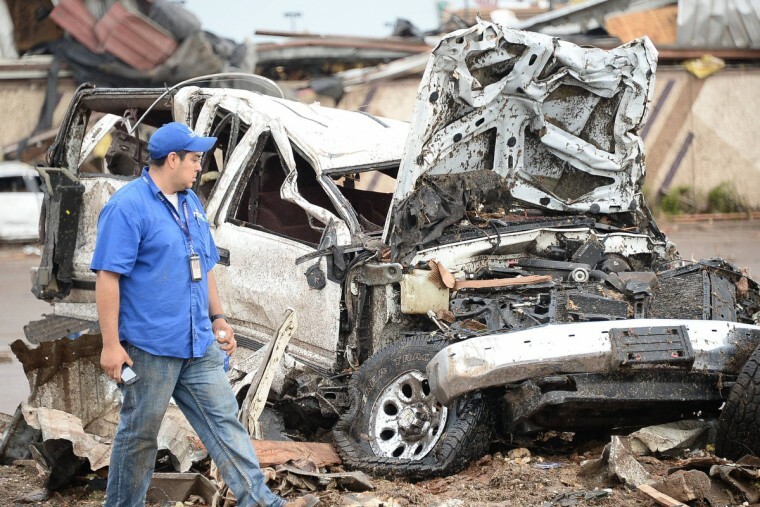 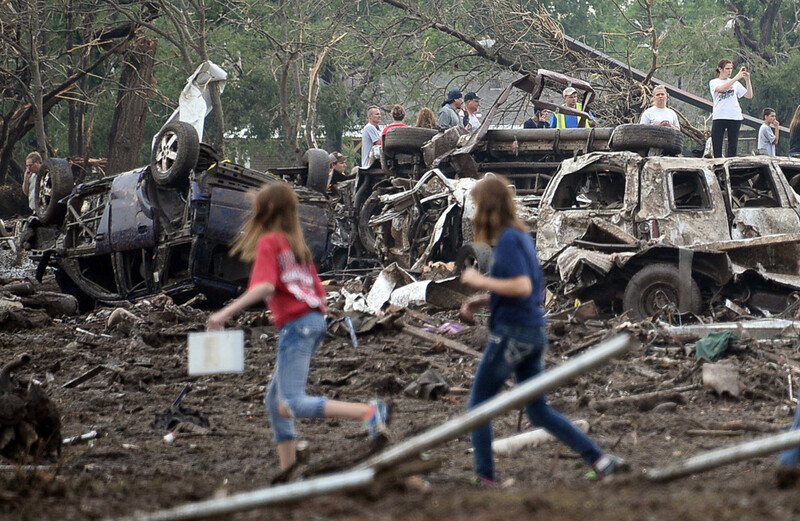 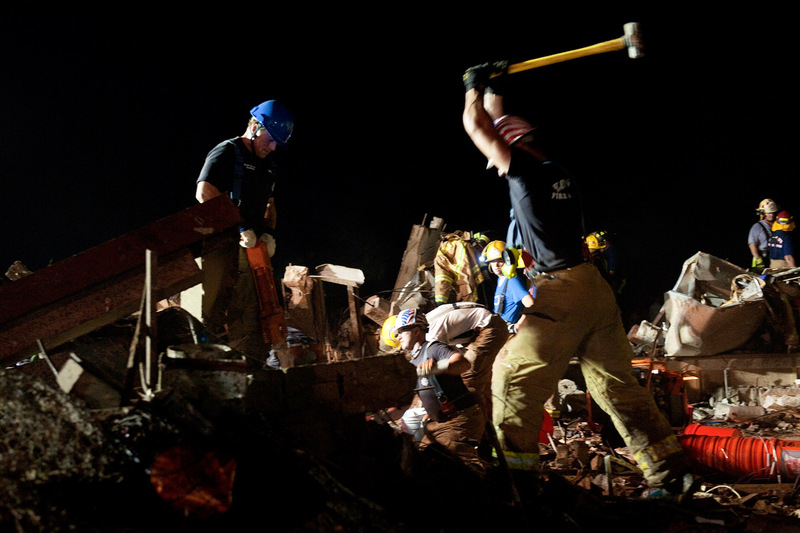 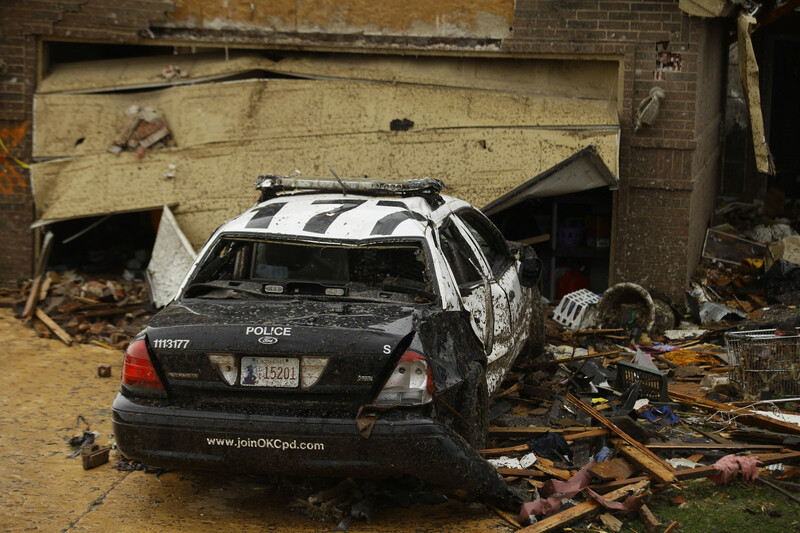 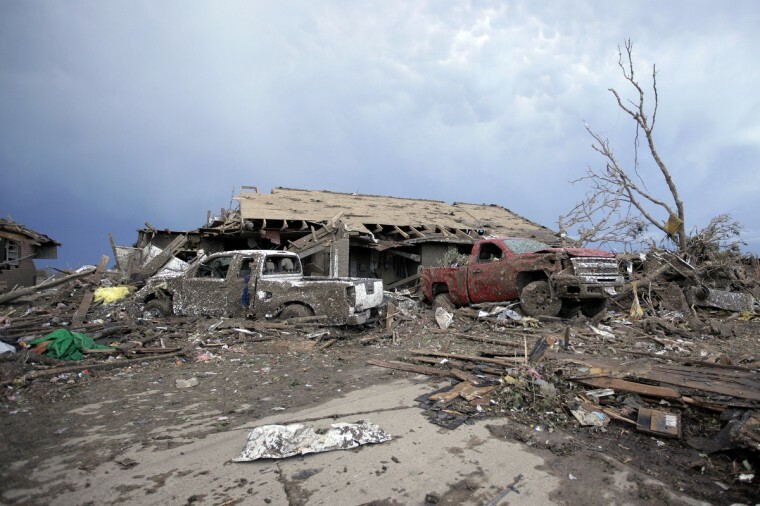 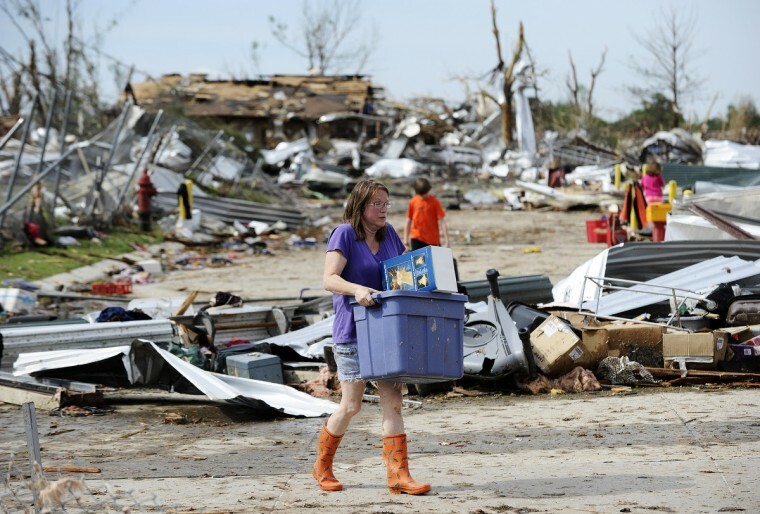 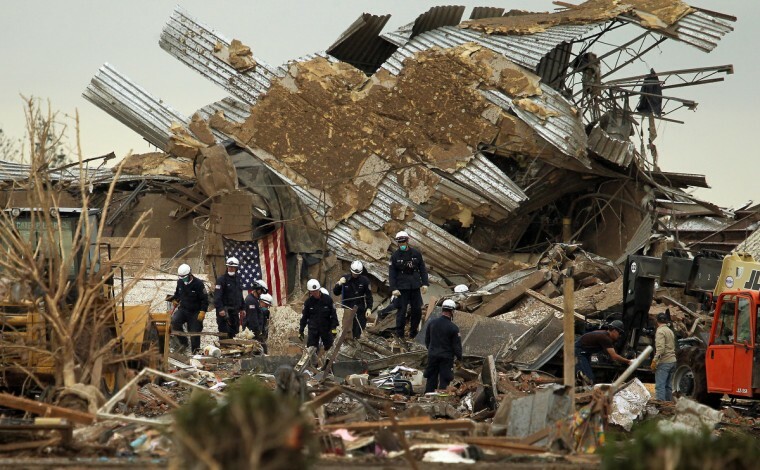 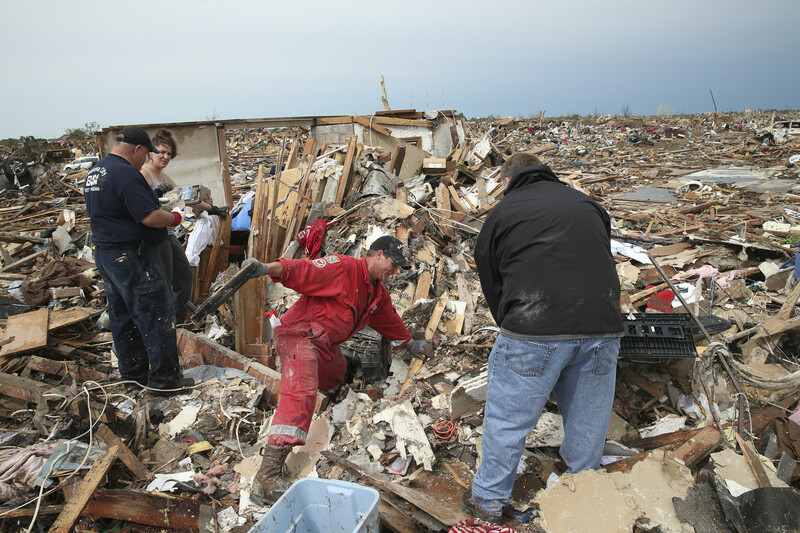 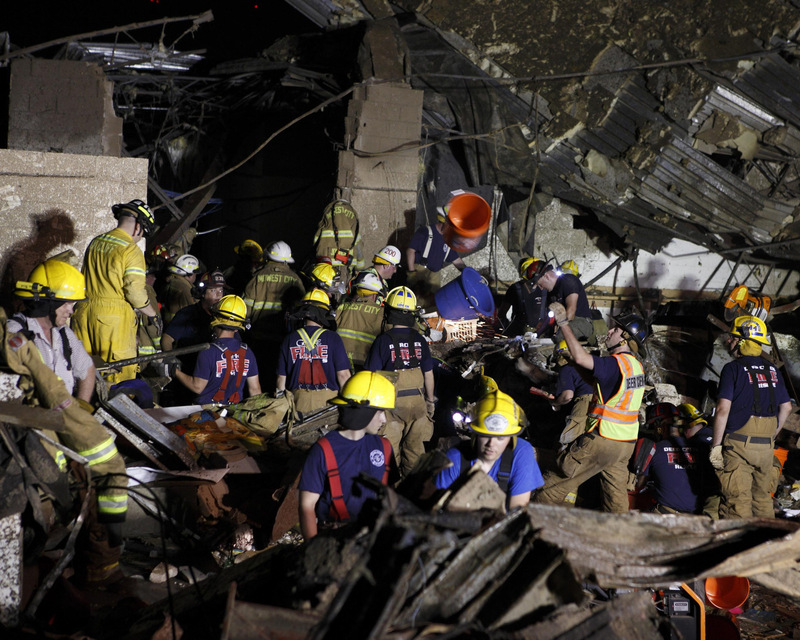 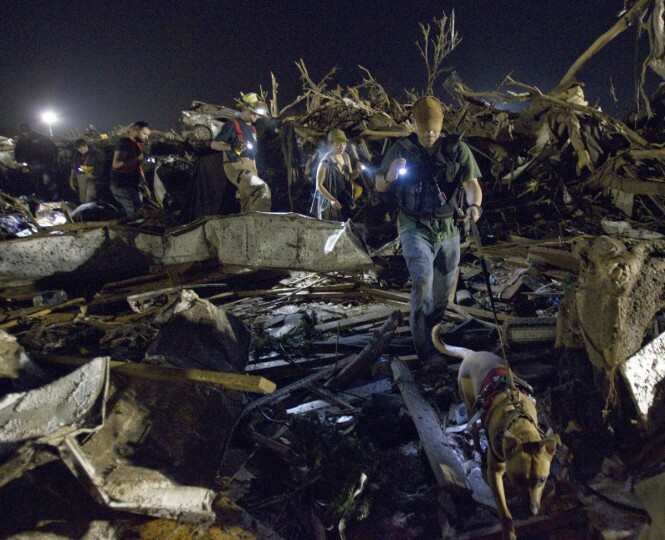 MOORE, Oklahoma (Reuters) – Rescue workers with sniffer dogs and searchlights combed through the wreckage of a massive tornado to ensure no survivors remained buried in the rubble of primary schools, homes and buildings in an Oklahoma City suburb. 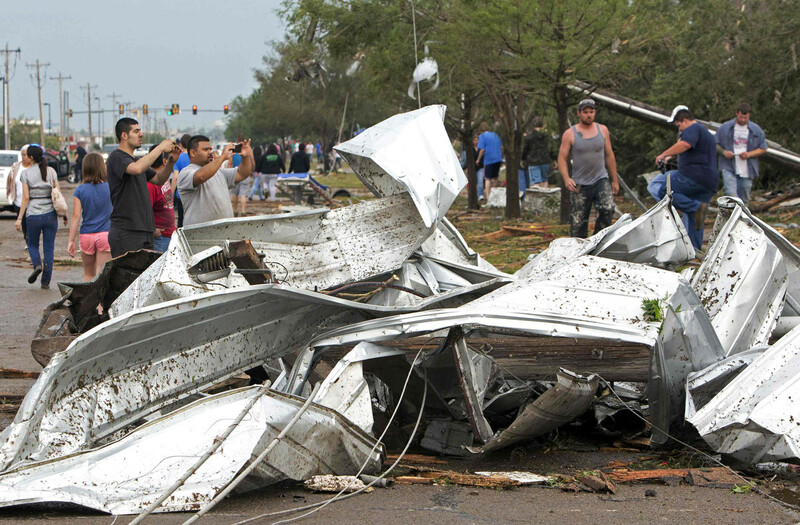 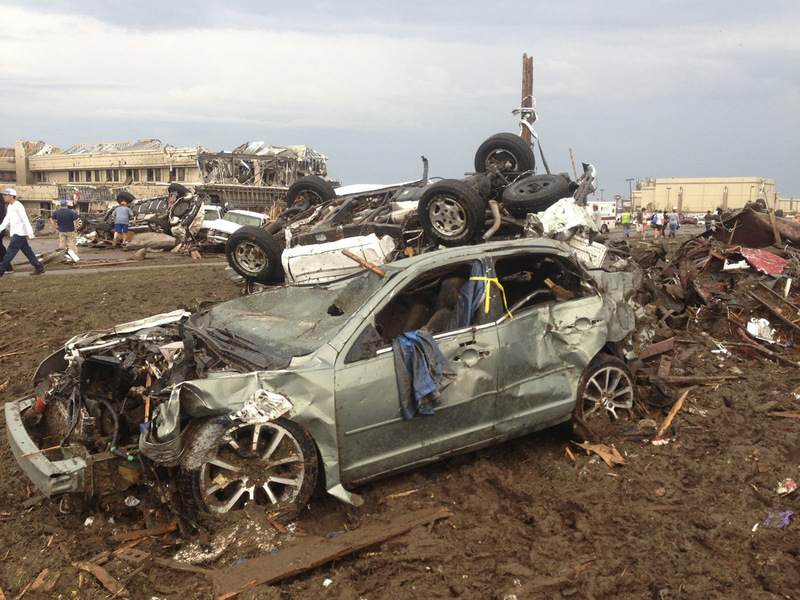 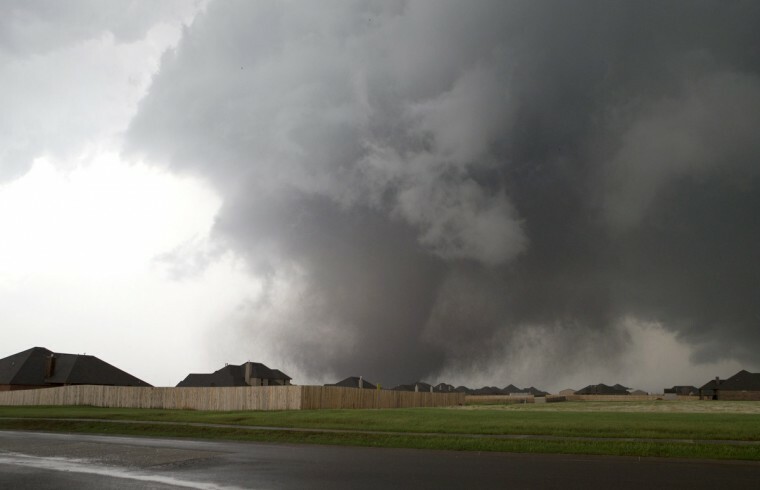 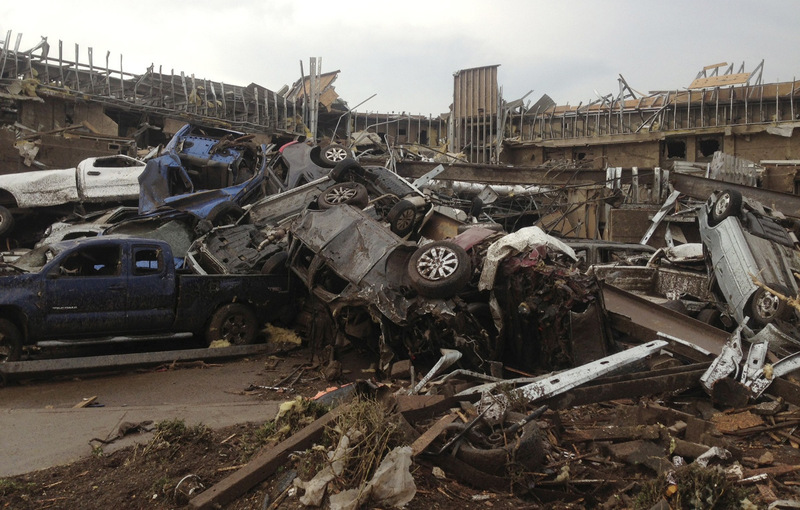 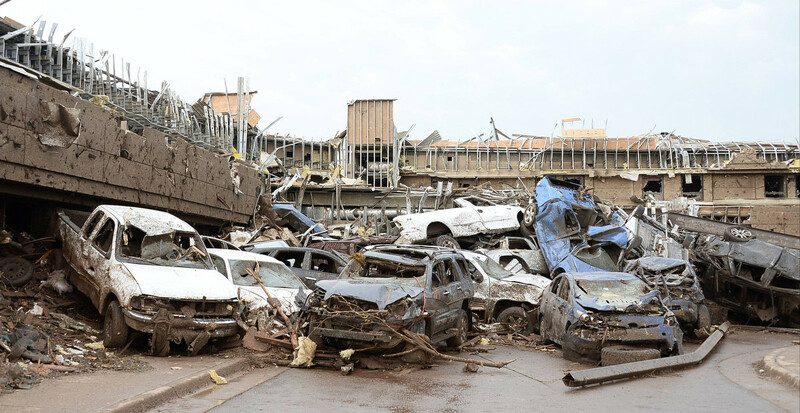 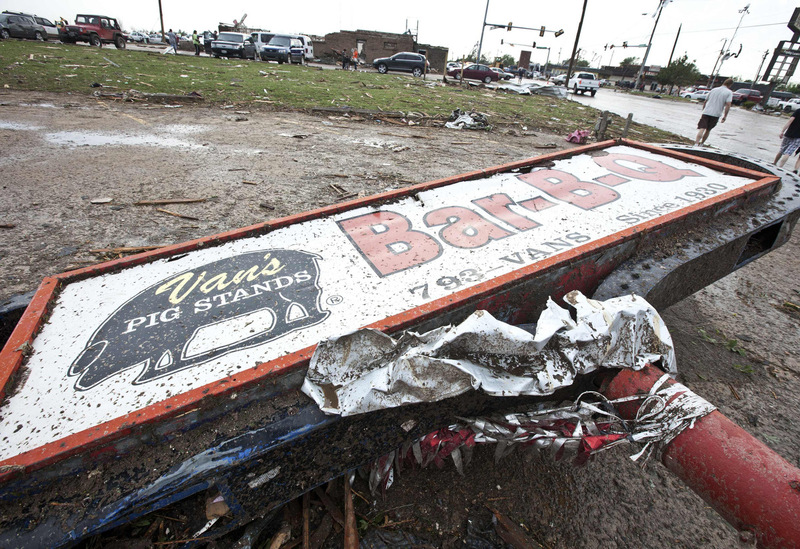 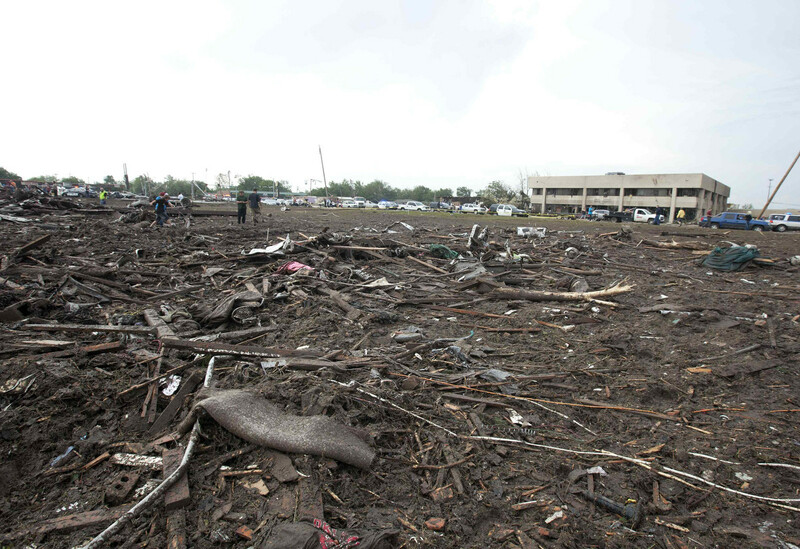 The massive tornado on Monday afternoon flattened blocks of the town, killed at least 24 people and injured about 240 in Moore, just outside Oklahoma City. 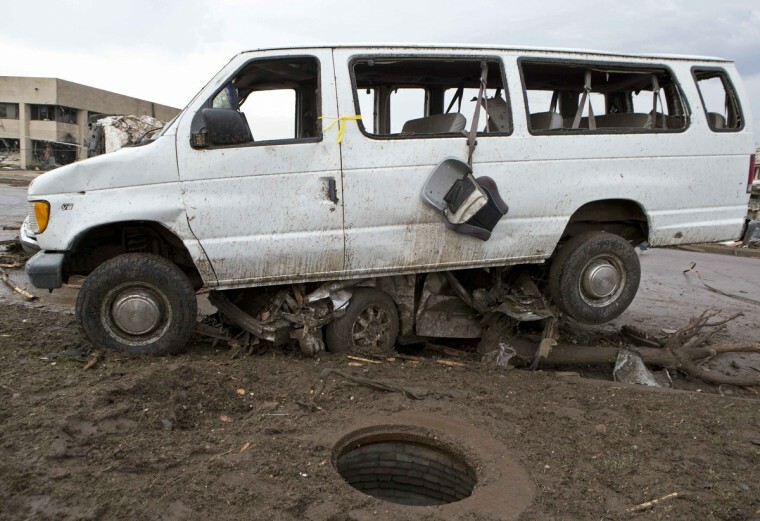 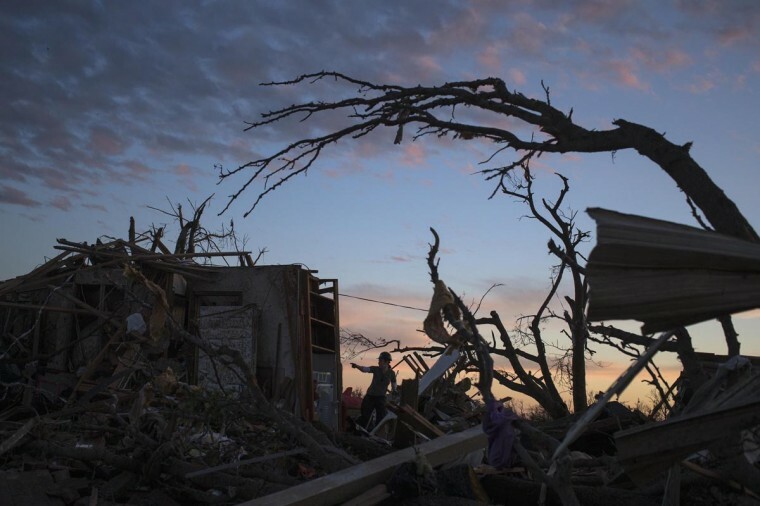 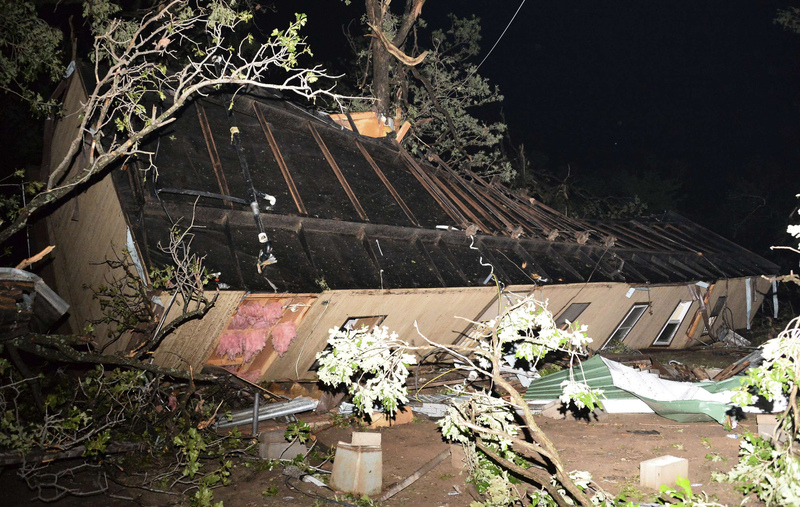 But as dawn approached on Wednesday, officials were increasingly confident that everyone caught in the disaster had been accounted for, despite initial fears that the twister had claimed the lives of more than 90 people. 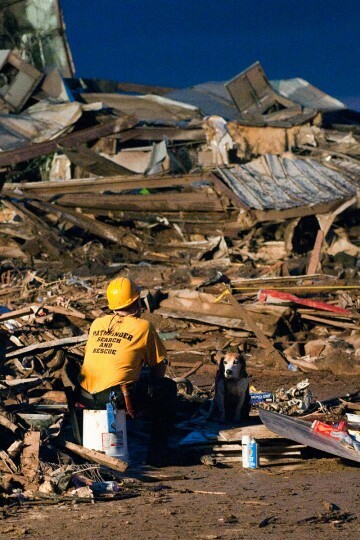 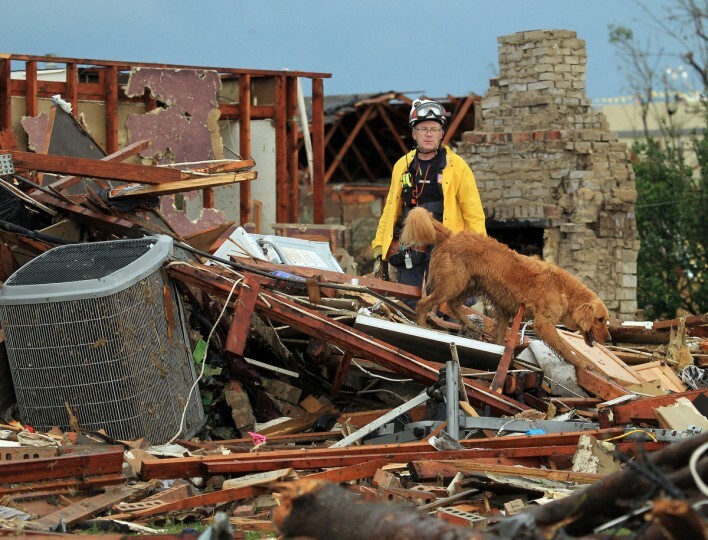 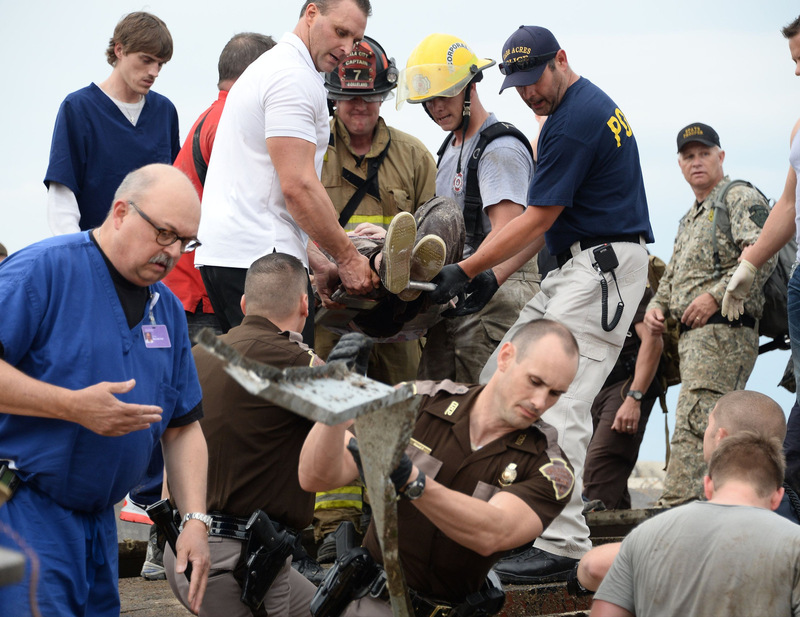 Jerry Lojka, spokesman for Oklahoma Emergency Management, said search-and-rescue dog teams would search on Wednesday for anybody trapped under the rubble, but that attention would also be focused on a huge cleanup job. 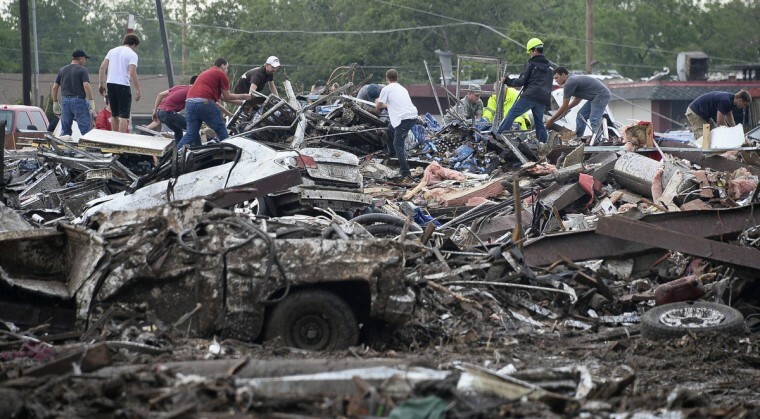 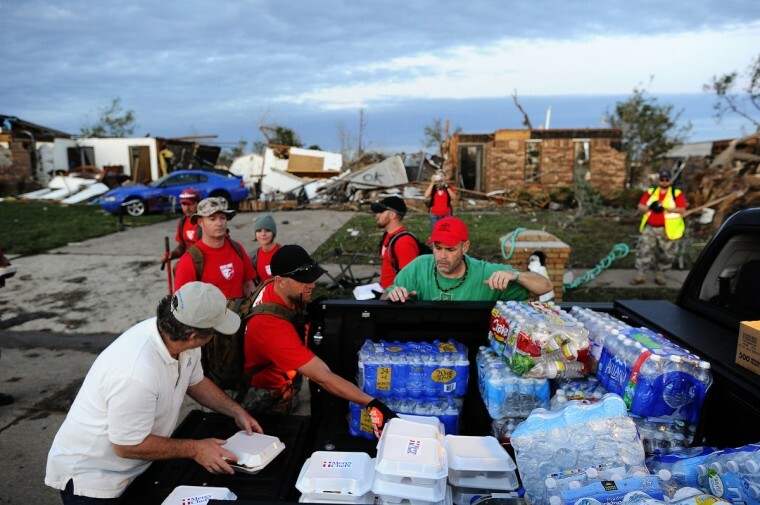 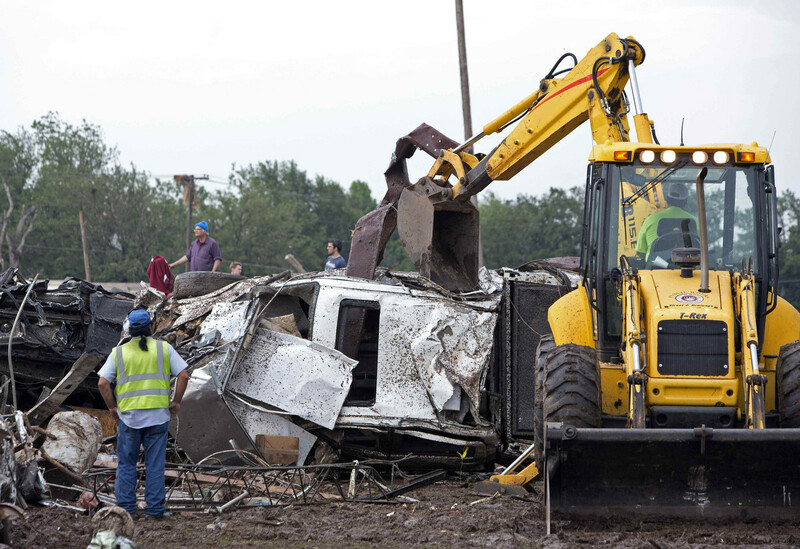 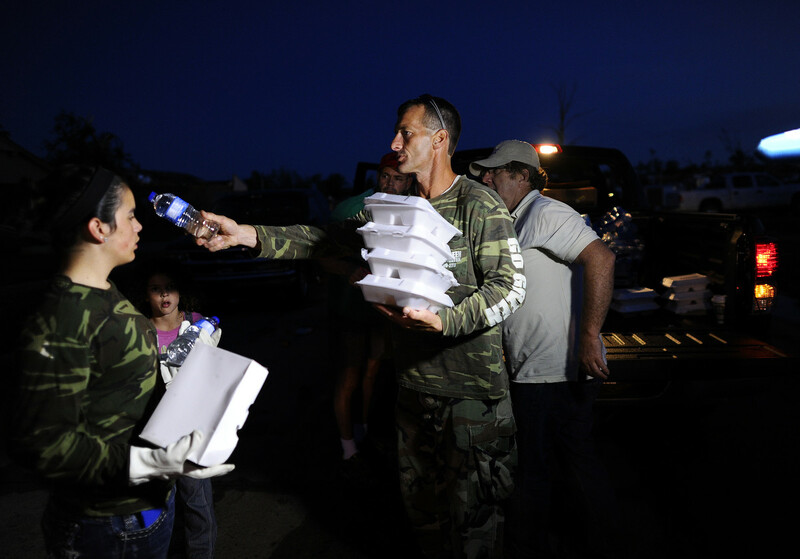 More than 1,000 people had already registered for assistance from the Federal Emergency Management Agency, which sent hundreds of workers to Oklahoma to help with the recovery, a White House official said on Wednesday. 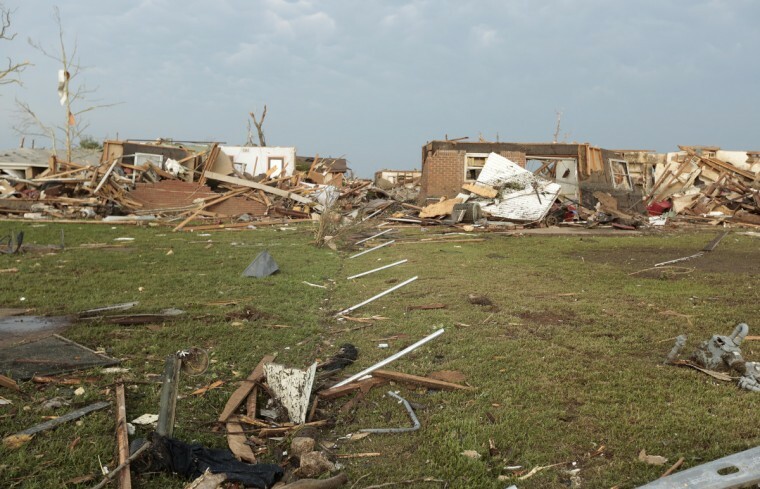 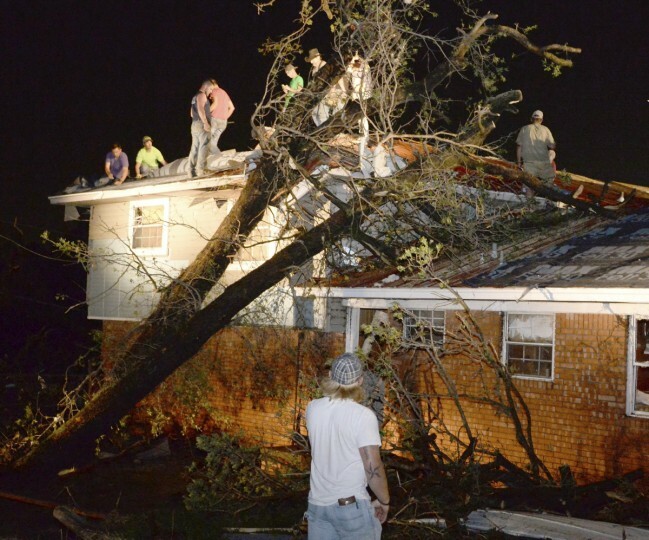 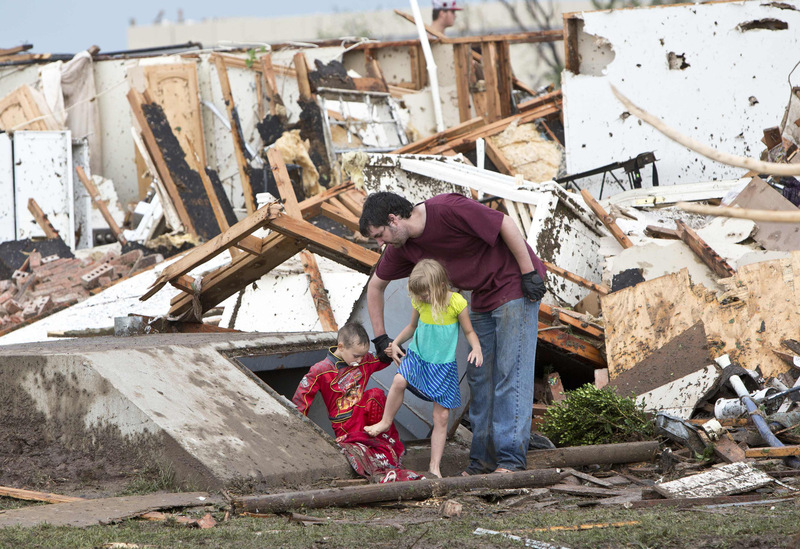 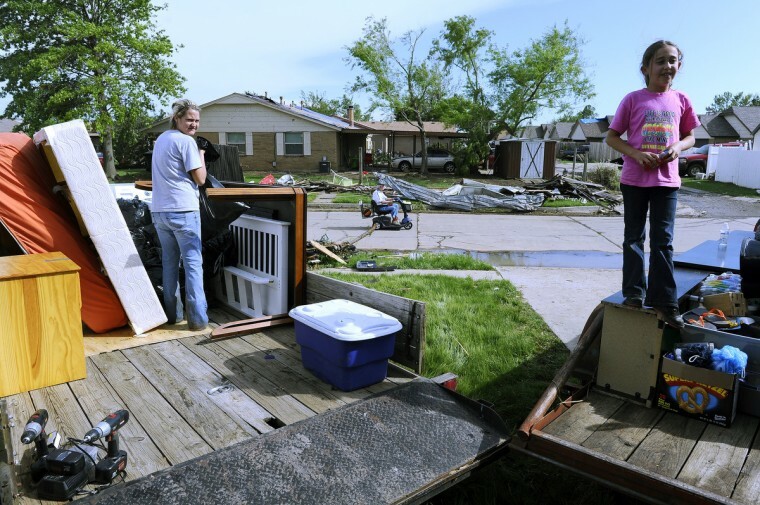 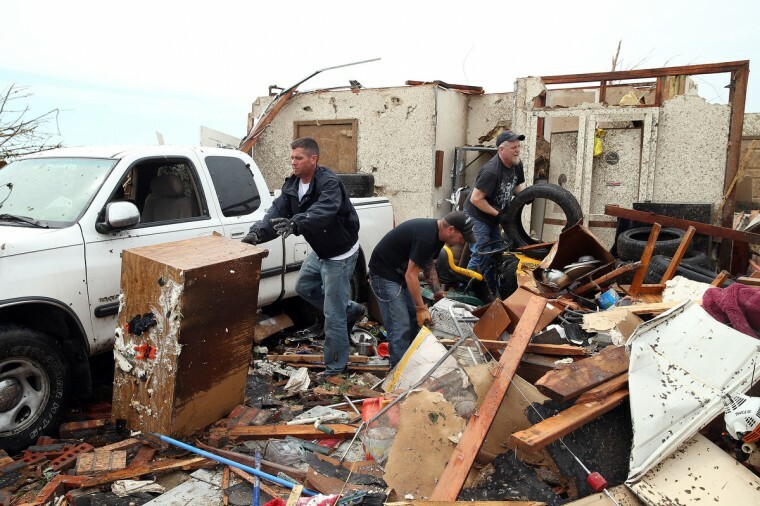 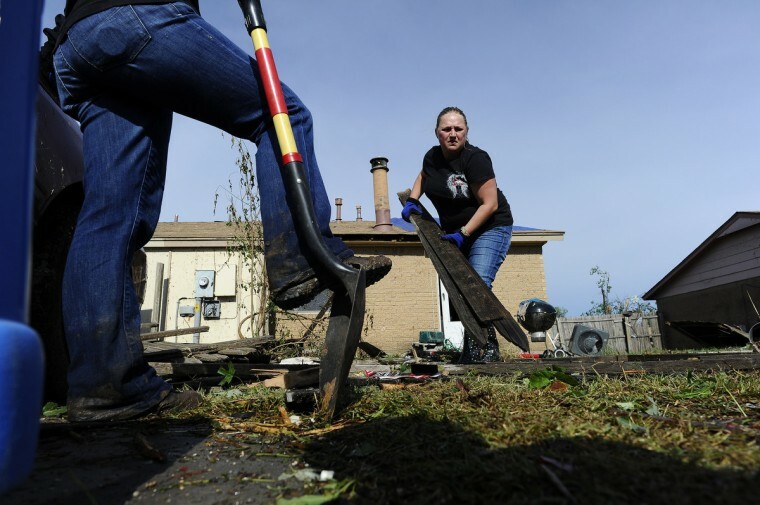 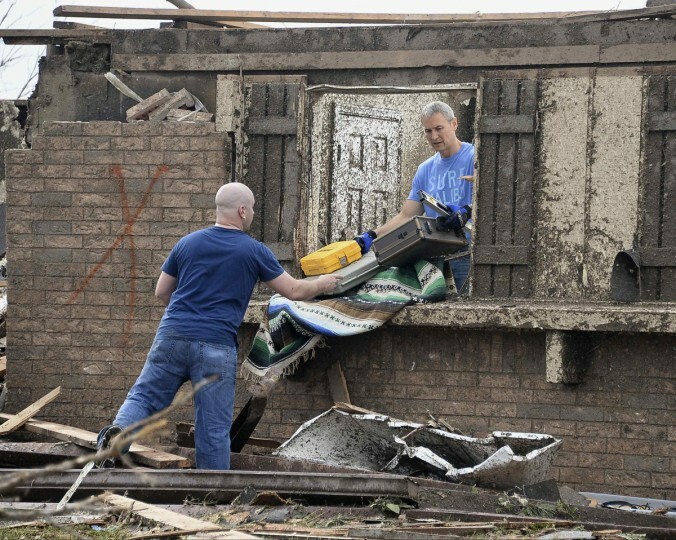 After a long day of searching through shattered homes that was slowed by rainy weather, Oklahoma County commissioner Brian Maughan said it seemed no one was missing. 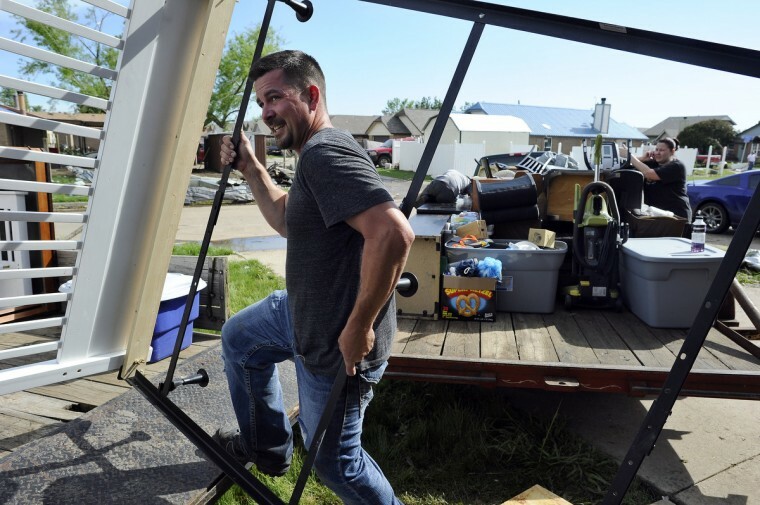 “As far as I know, of the list of people that we have had that they are all accounted for in one way or another,” he said. 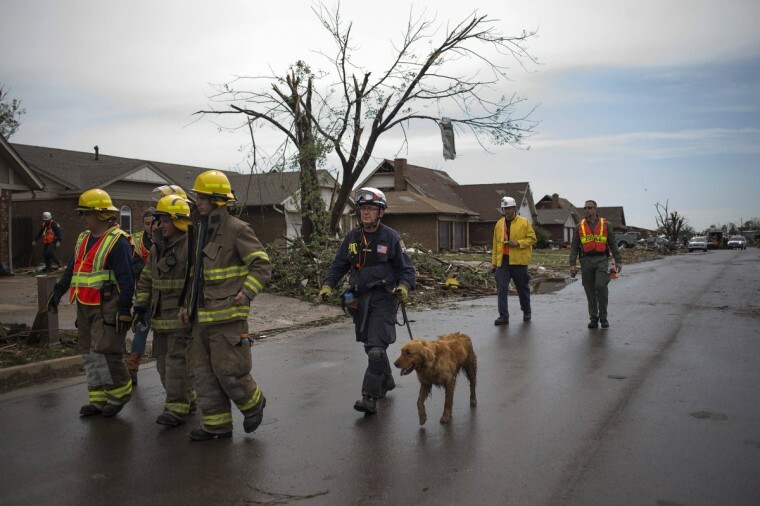 As he spoke on Tuesday evening, dog teams and members of the National Guard were changing shifts to work through the night. 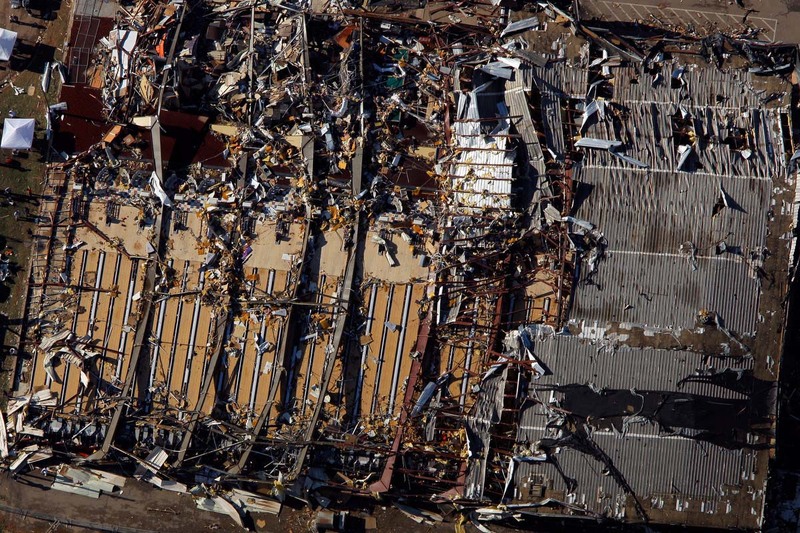 The death toll of 24 was lower than initially feared, but nine children were among the dead, including seven who died at Plaza Towers Elementary School which took a direct hit by the deadliest tornado to strike the United States in two years. 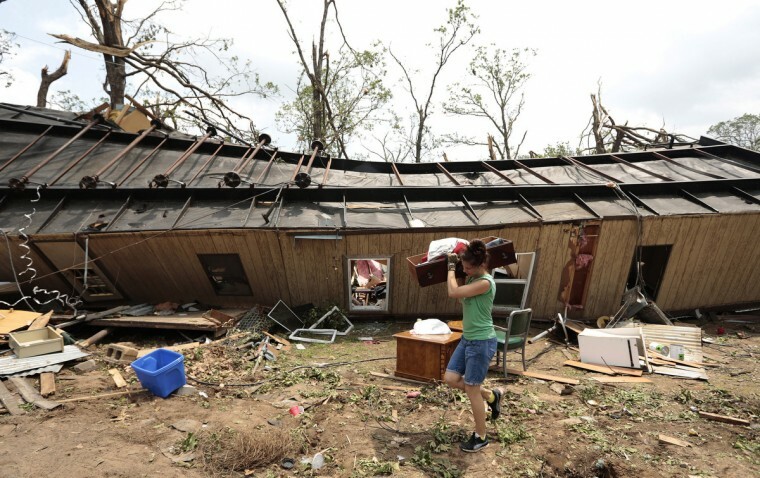 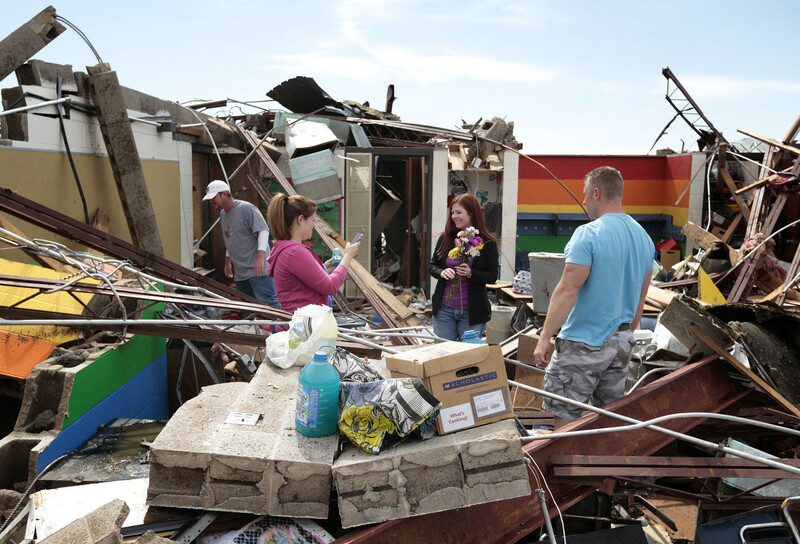 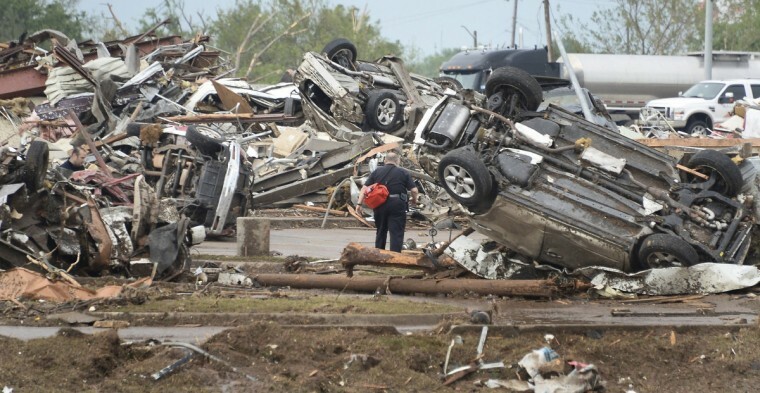 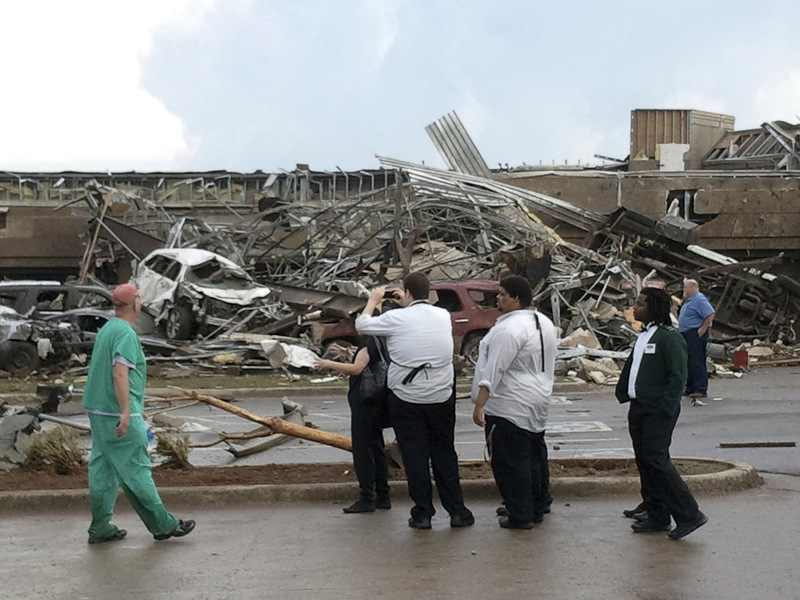 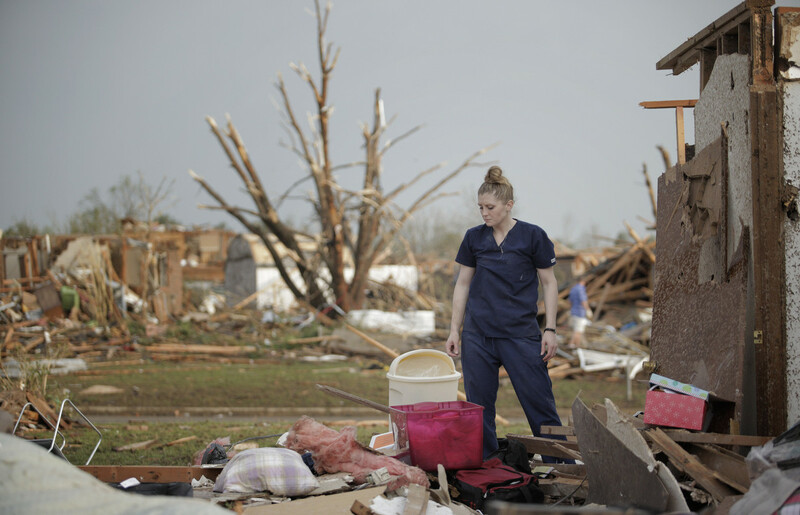 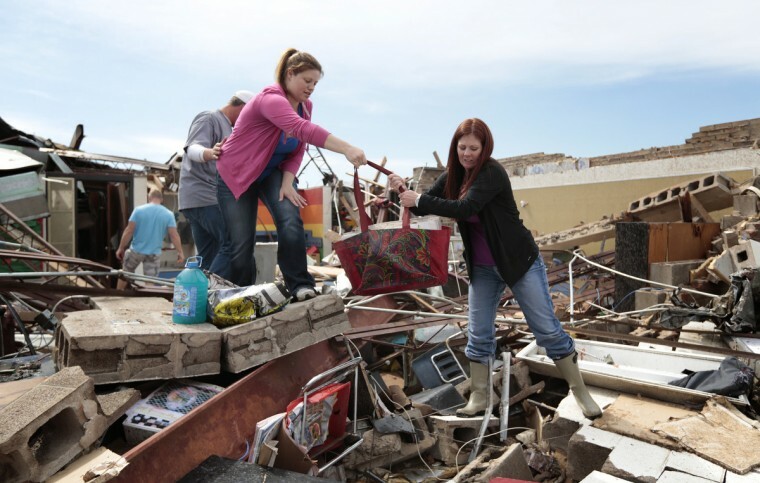 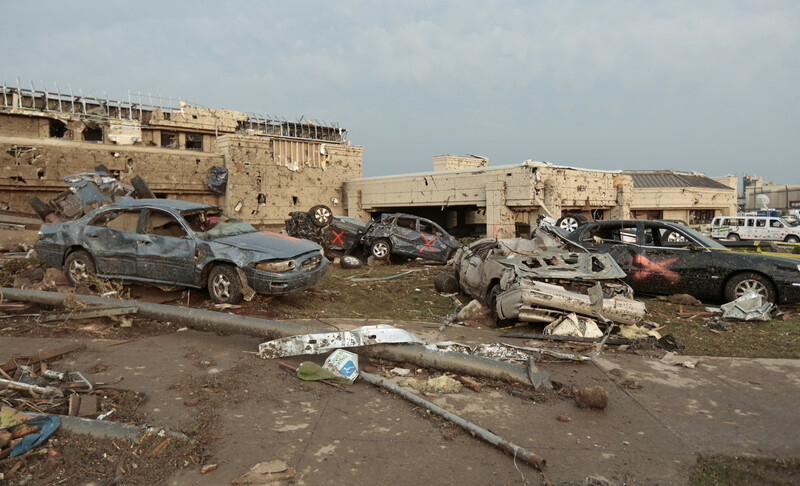 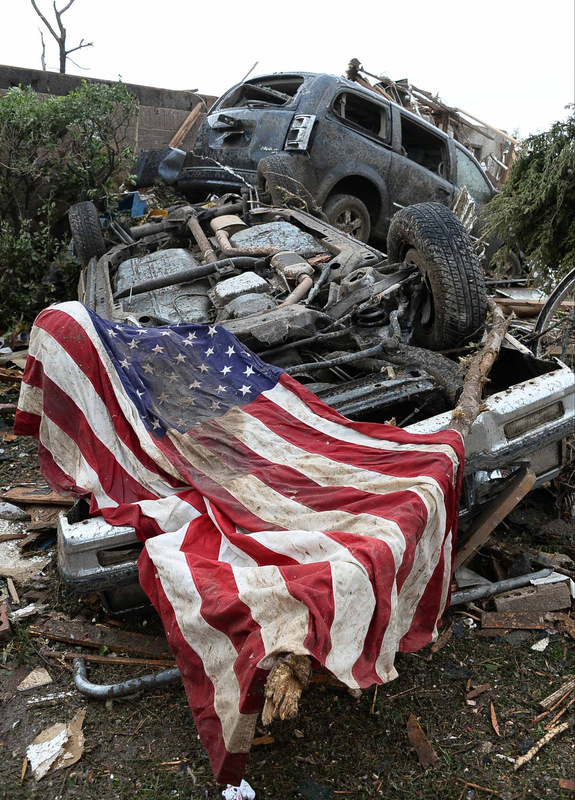 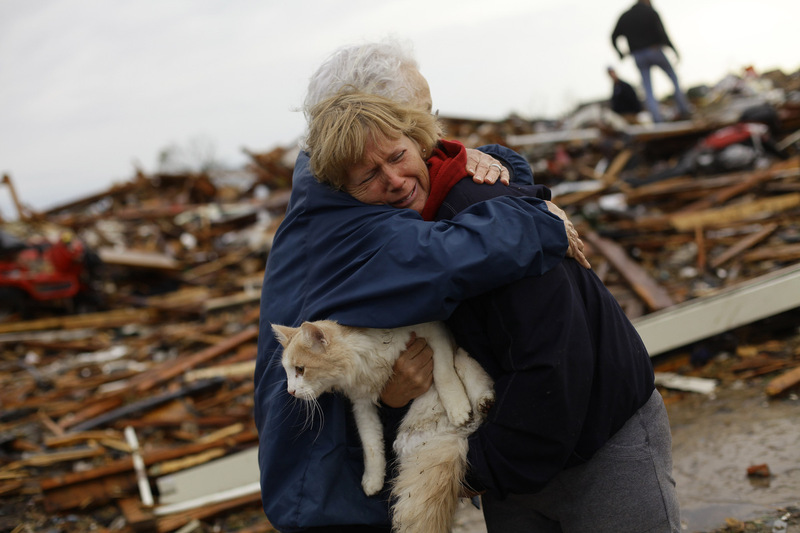 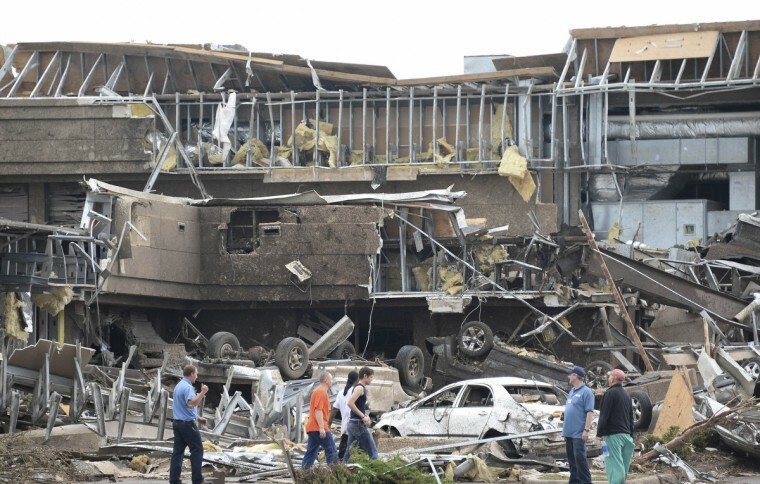 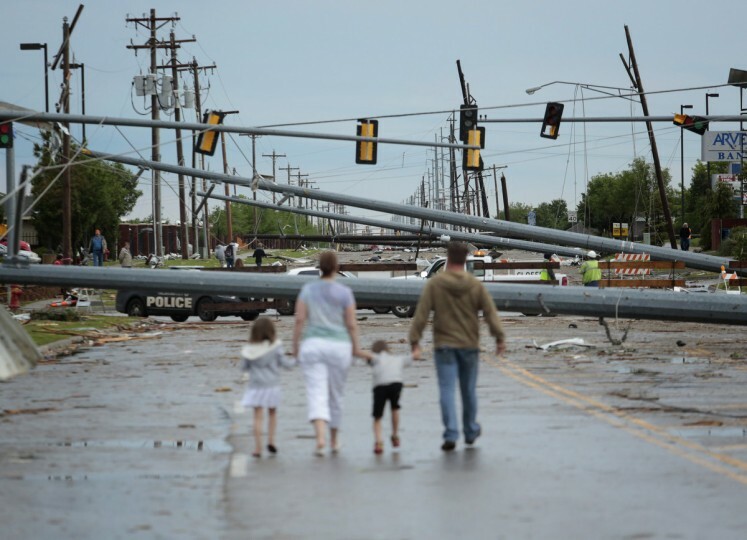 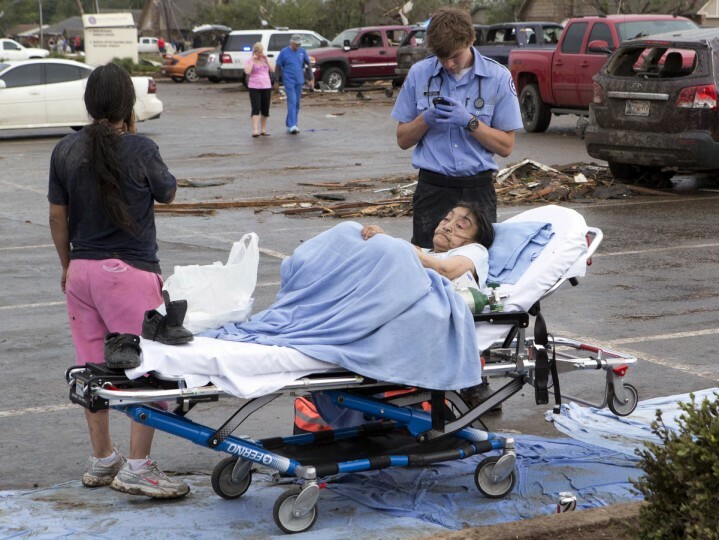 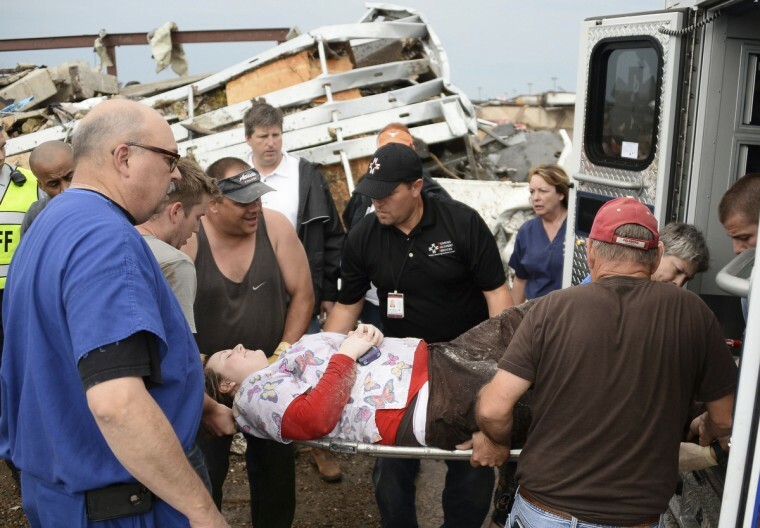 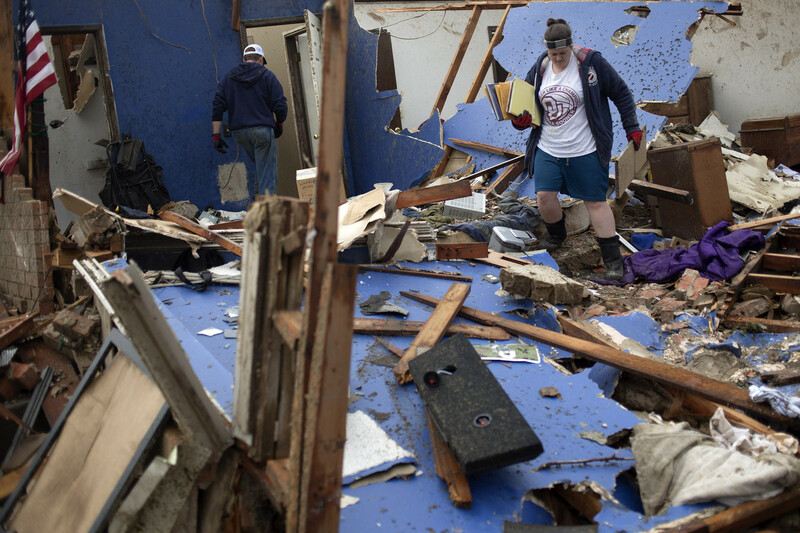 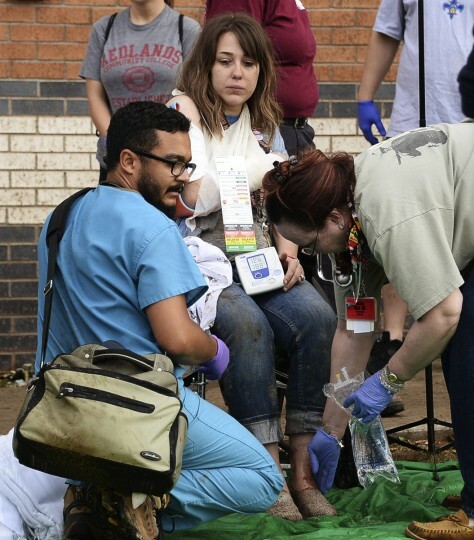 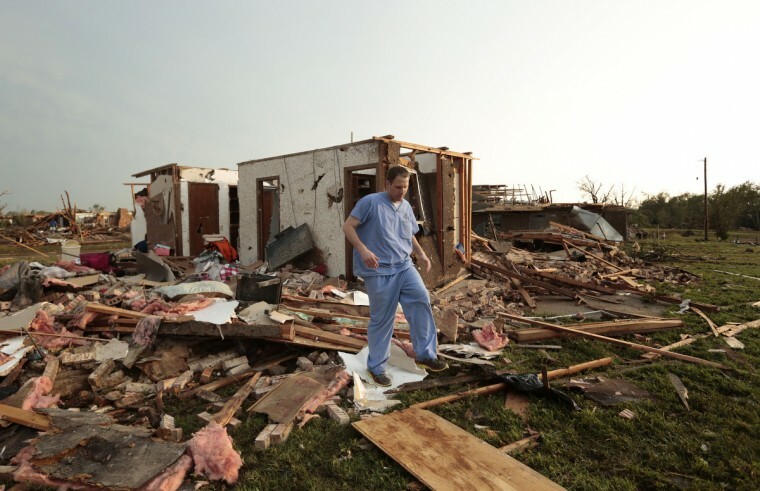 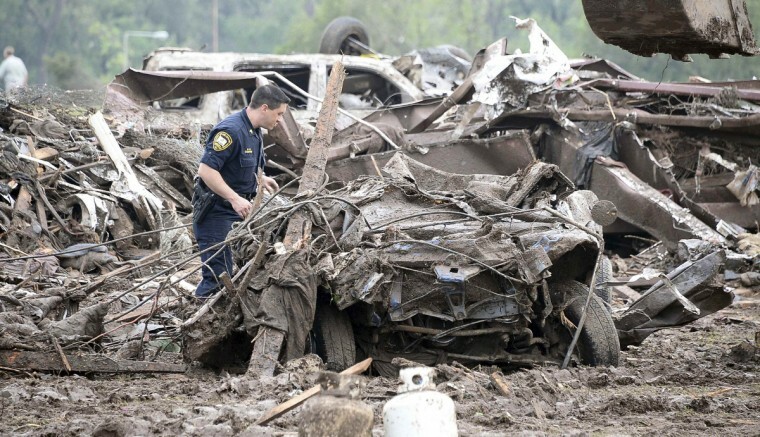 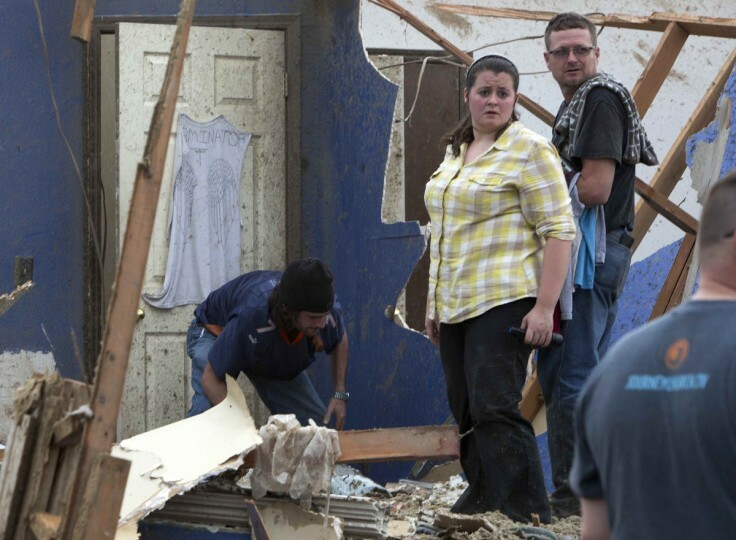 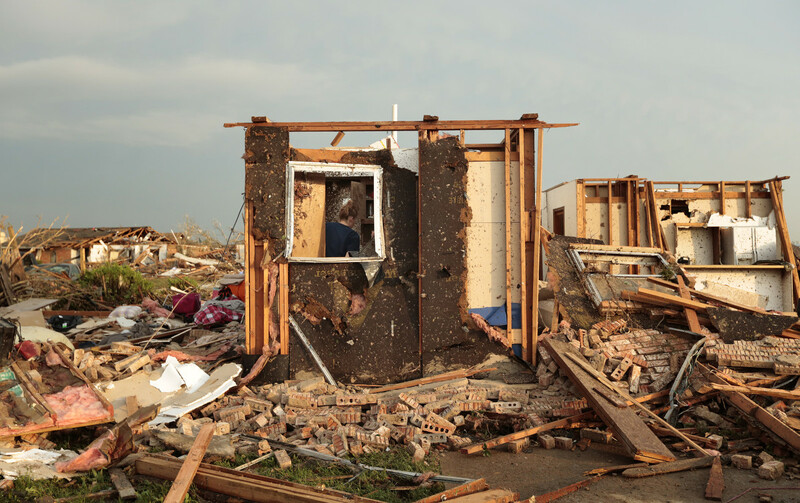 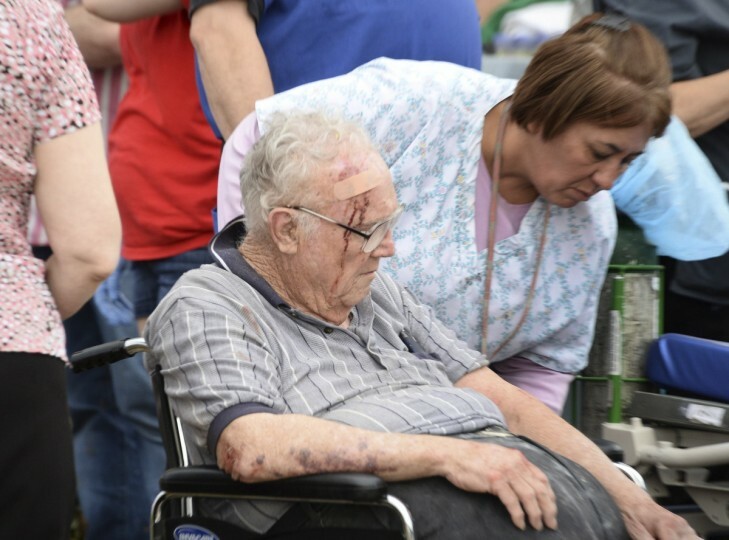 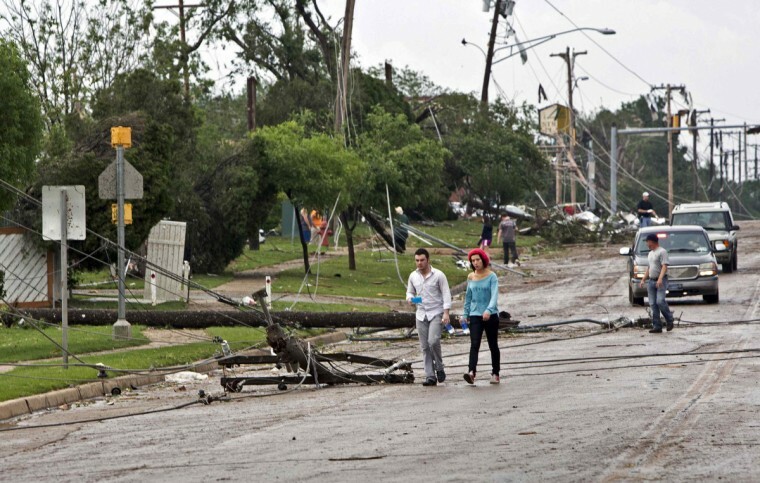 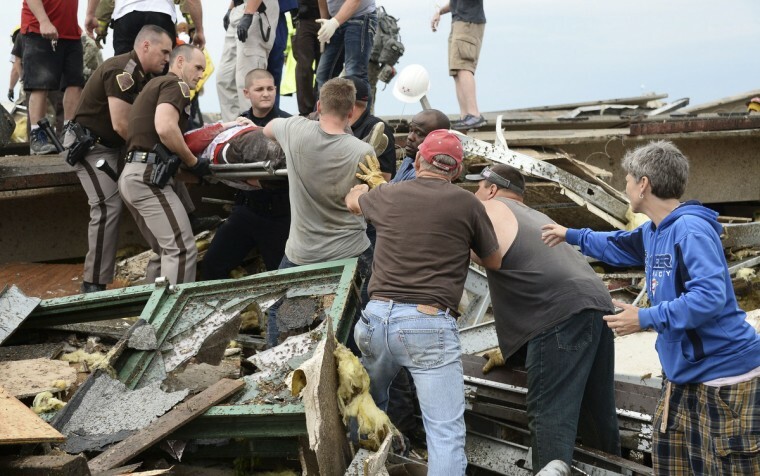 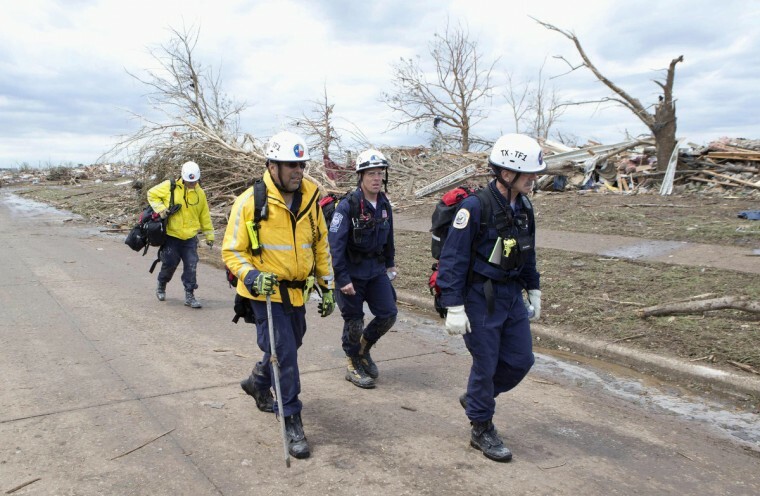 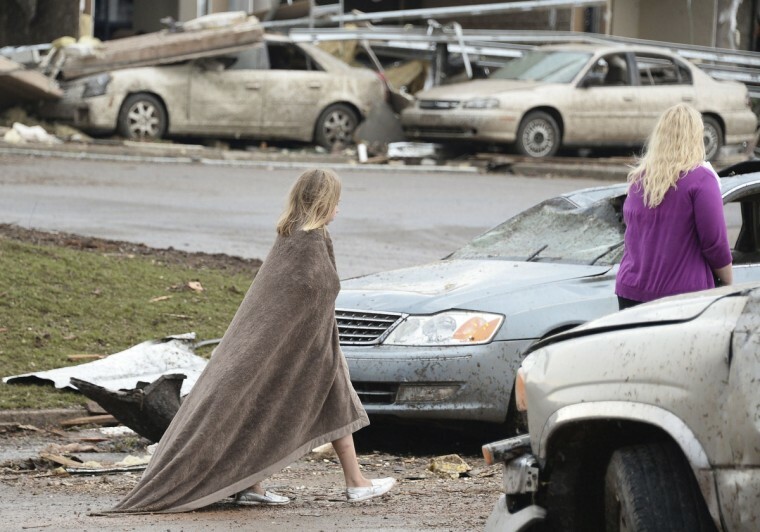 Emergency workers pulled more than 100 survivors from the debris of homes, schools and a hospital after the tornado ripped through the Oklahoma City region with winds exceeding 200 miles per hour, leaving a trail of destruction 17 miles long and 1.3 miles wide. 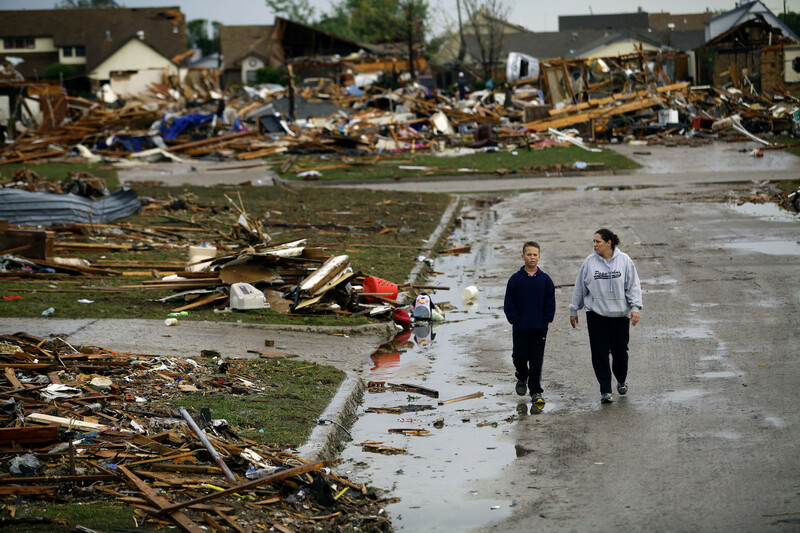 The last time a giant twister tore through the area, on May 3, 1999, it killed more than 40 people and destroyed thousands of homes. 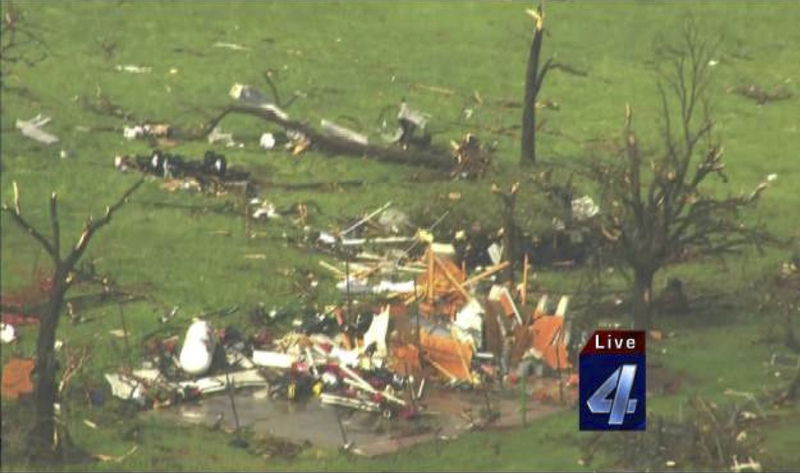 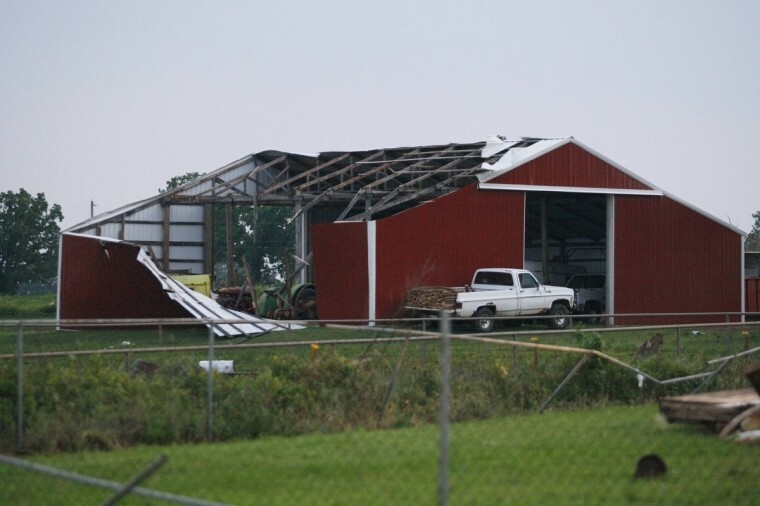 That tornado also ranked as an EF5. 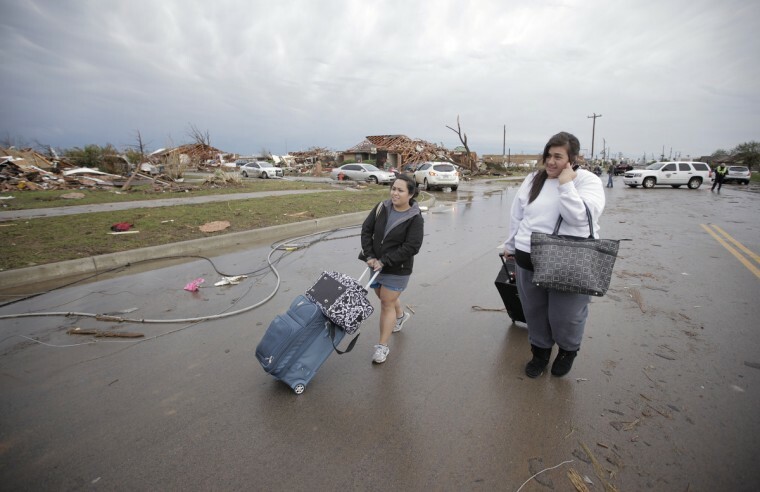 While Oklahoma Emergency Management’s Lojka said a flyover of the affected area on Tuesday showed 2,400 homes damaged or obliterated, with an estimated 10,000 people affected, the death toll was lower than might have been expected. 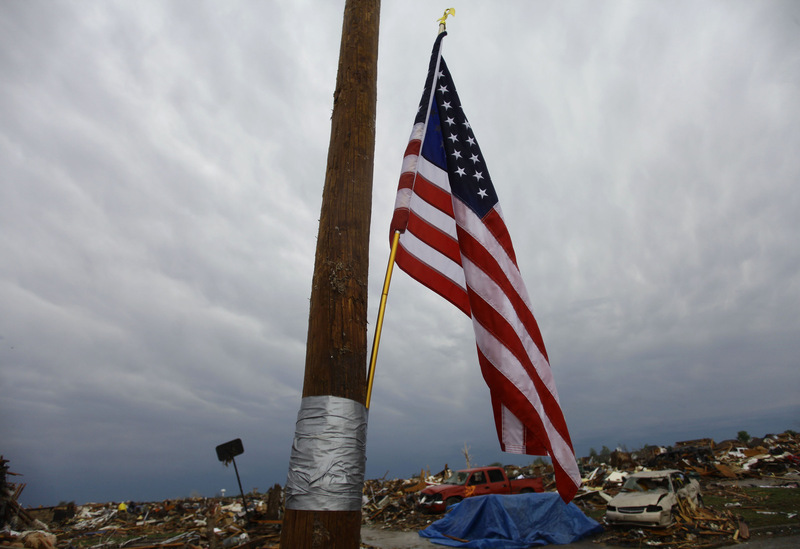 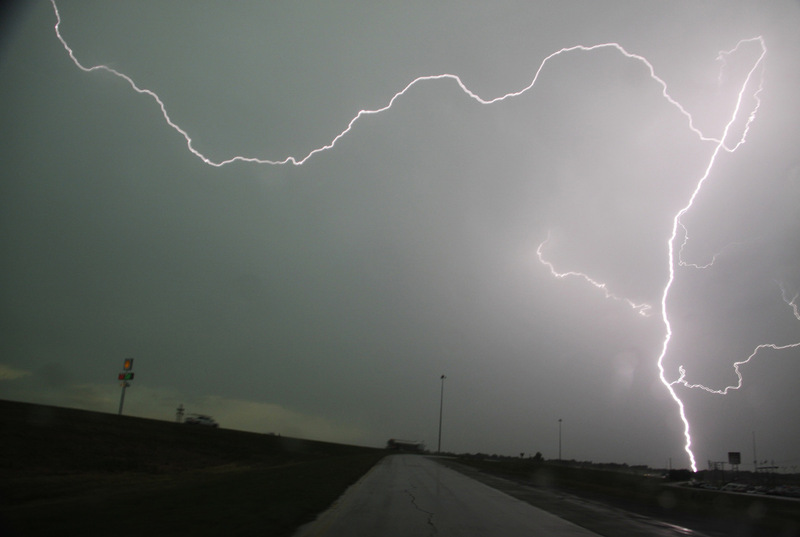 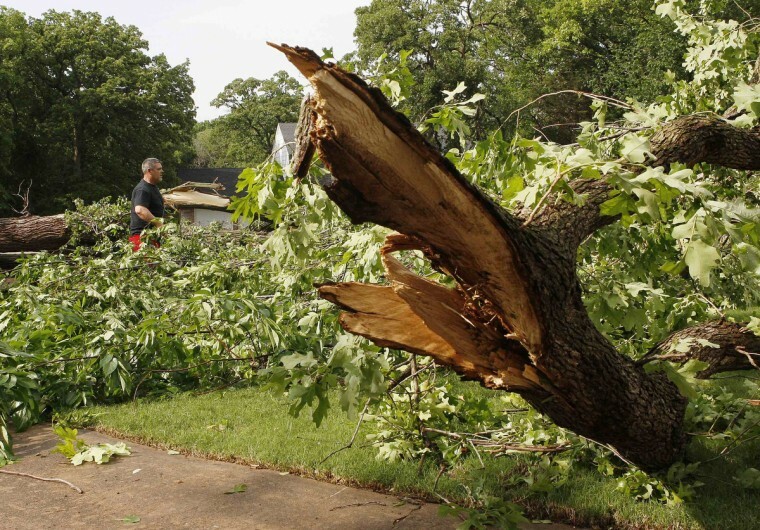 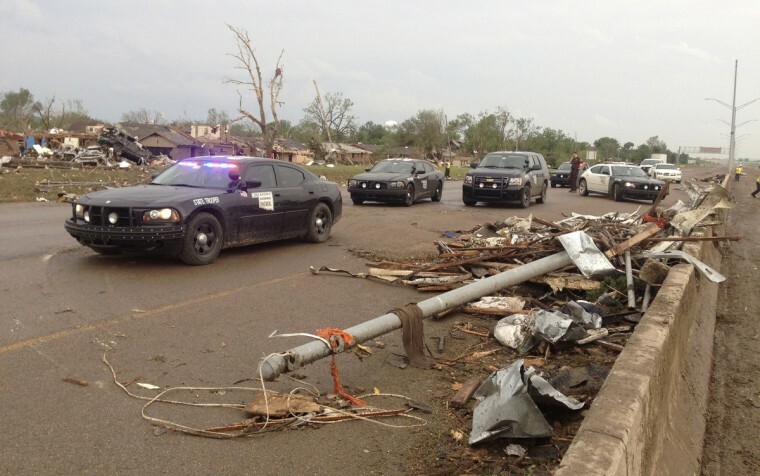 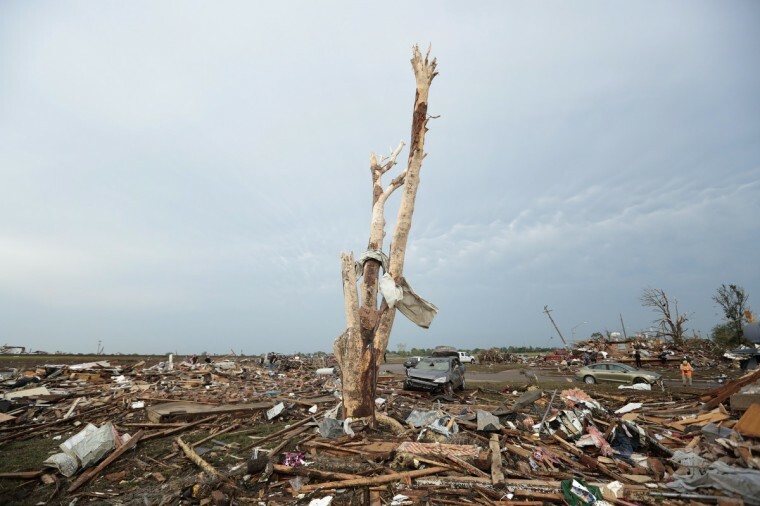 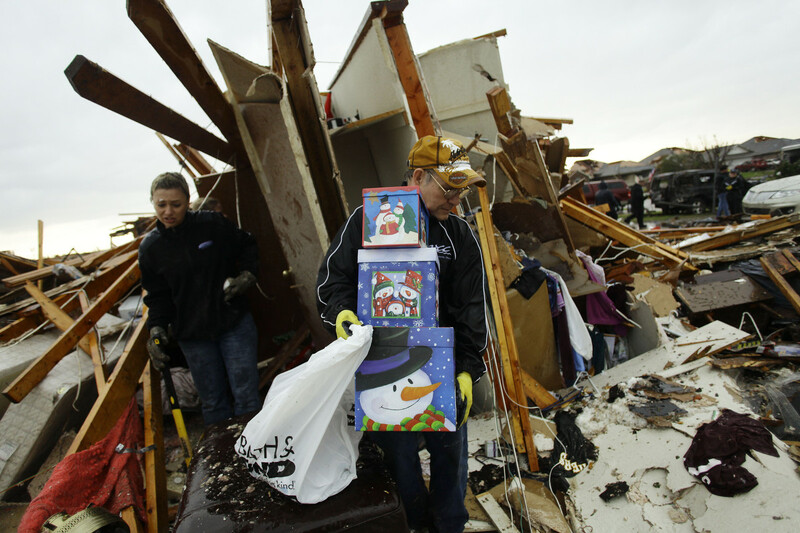 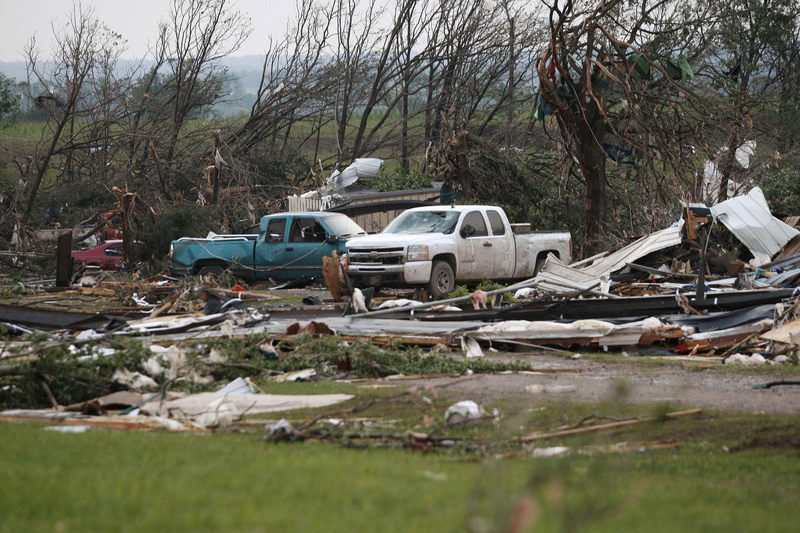 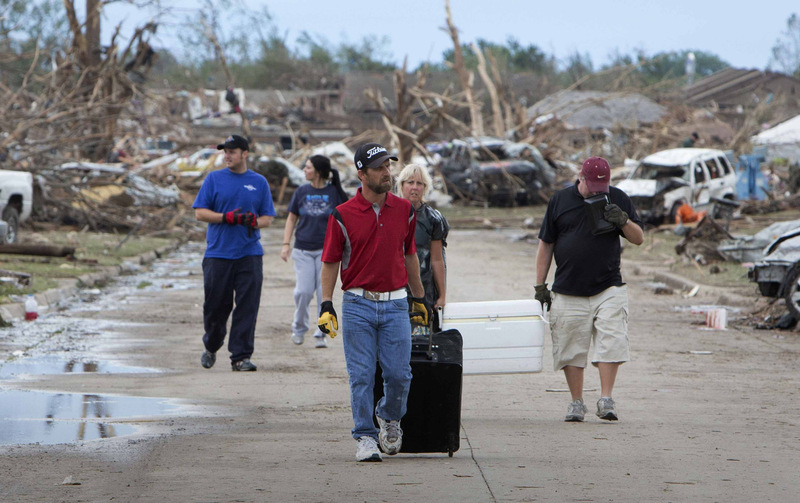 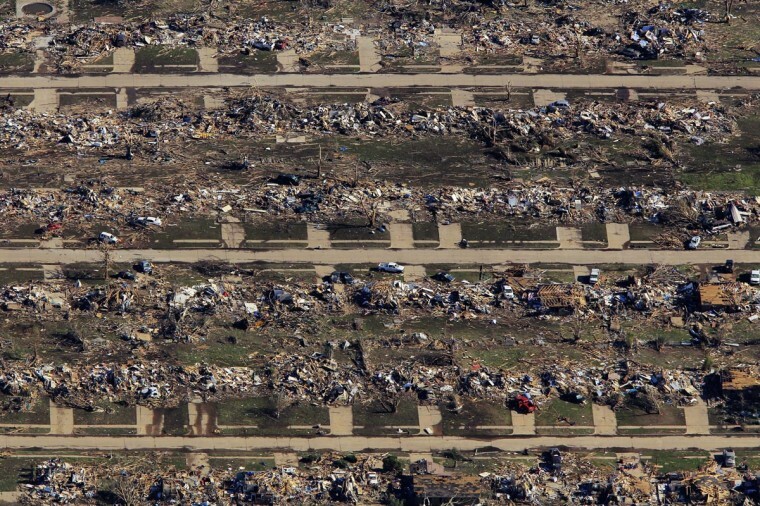 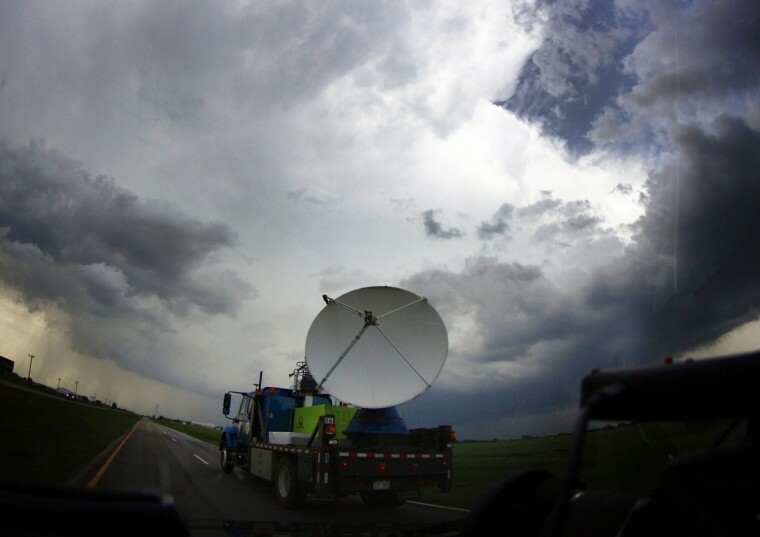 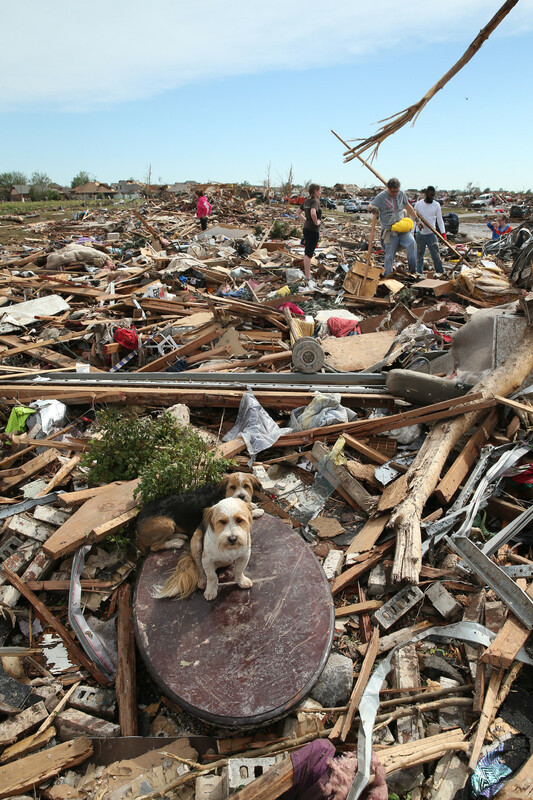 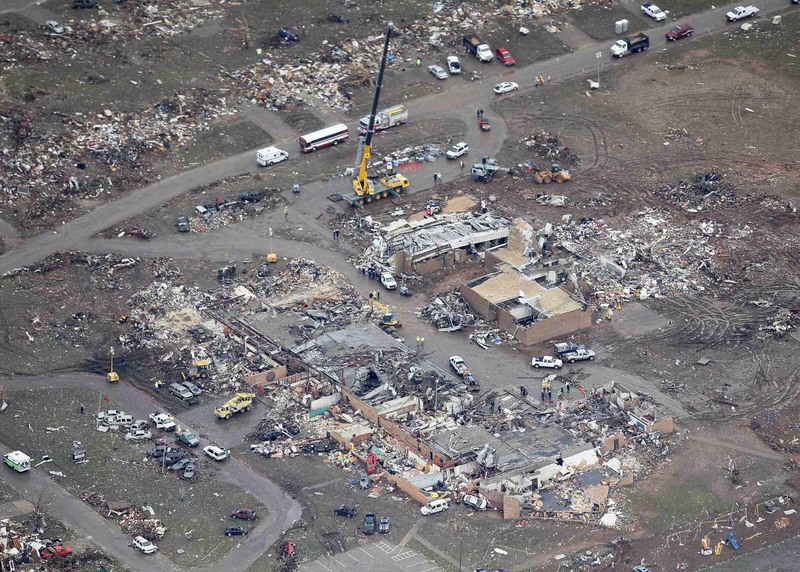 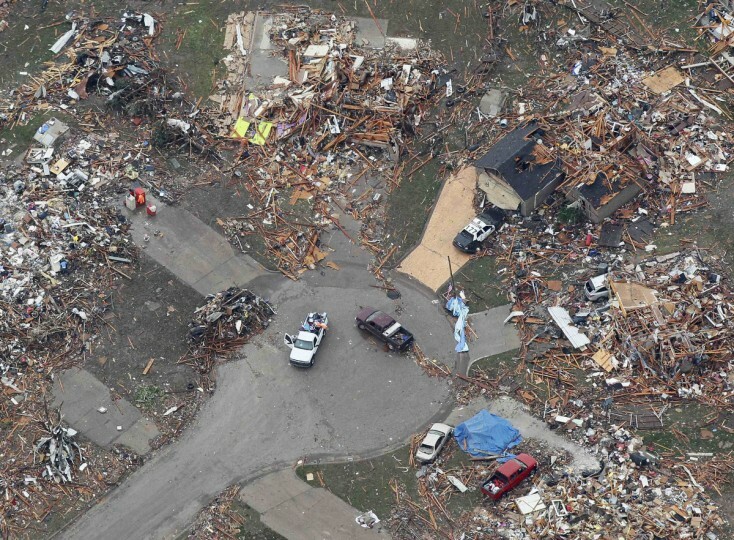 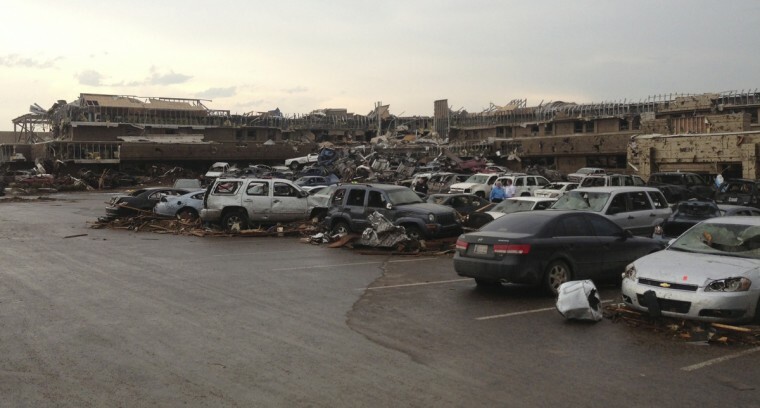 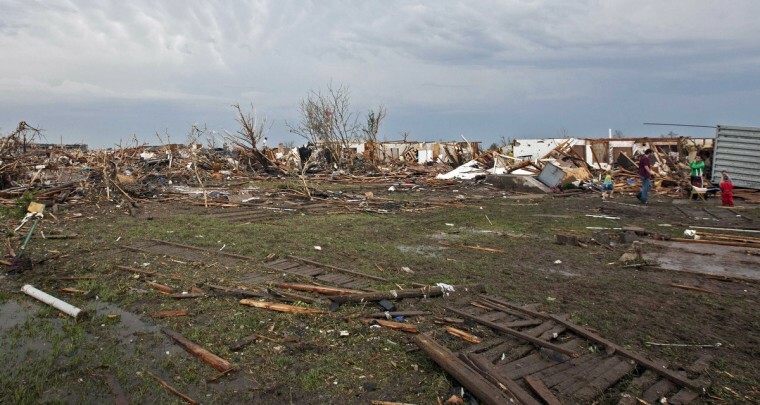 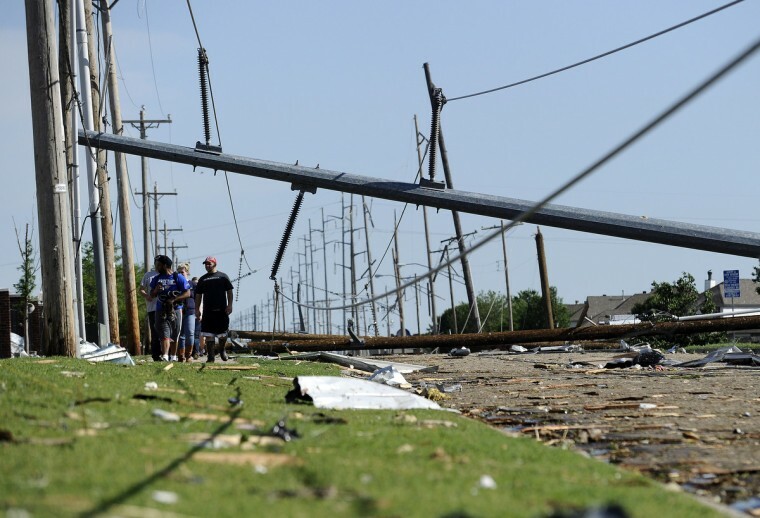 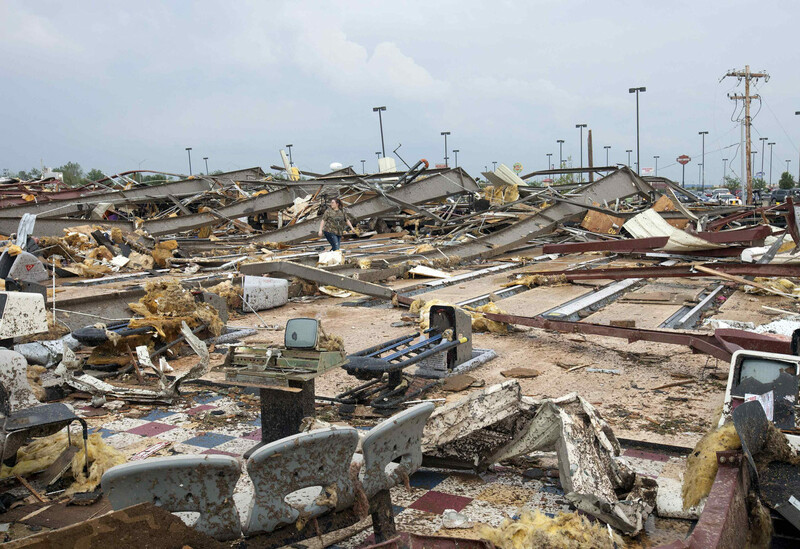 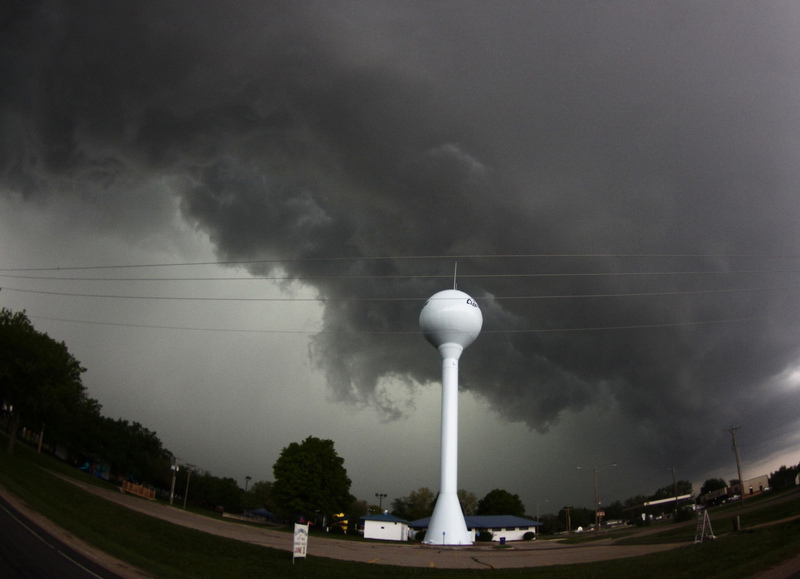 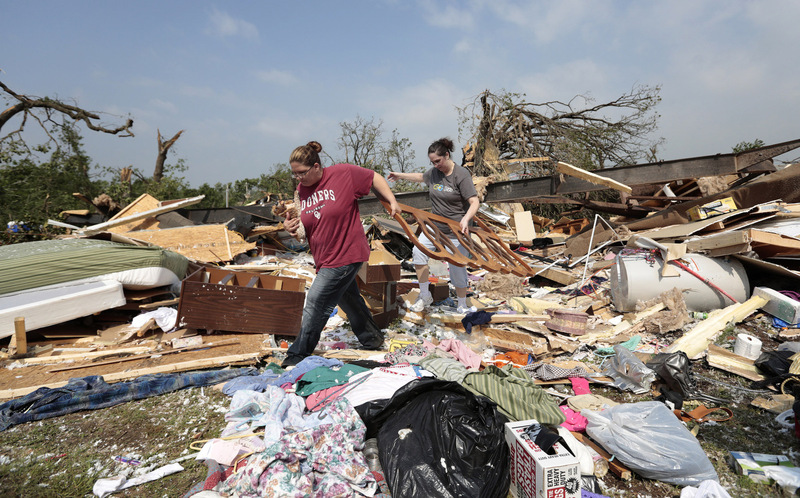 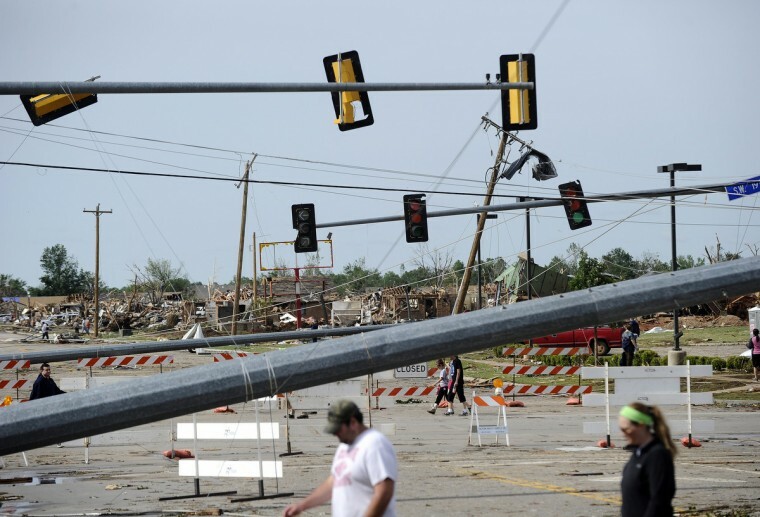 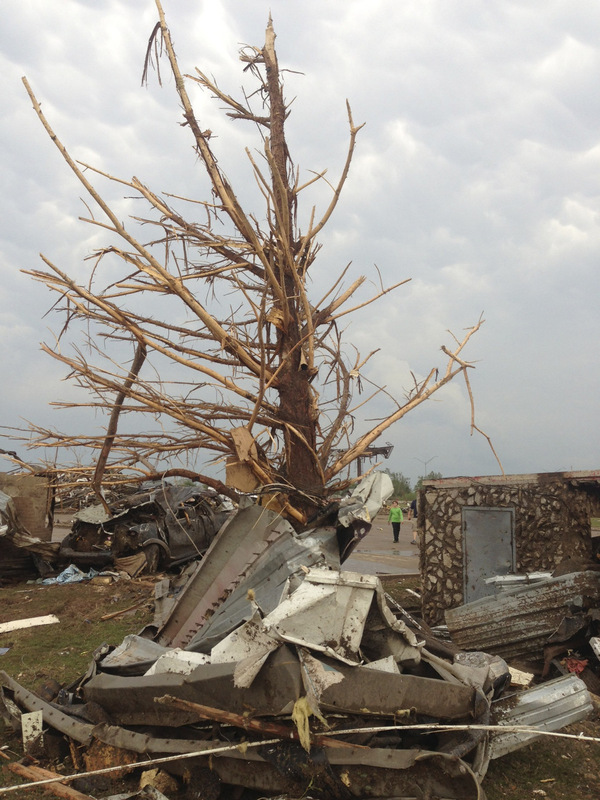 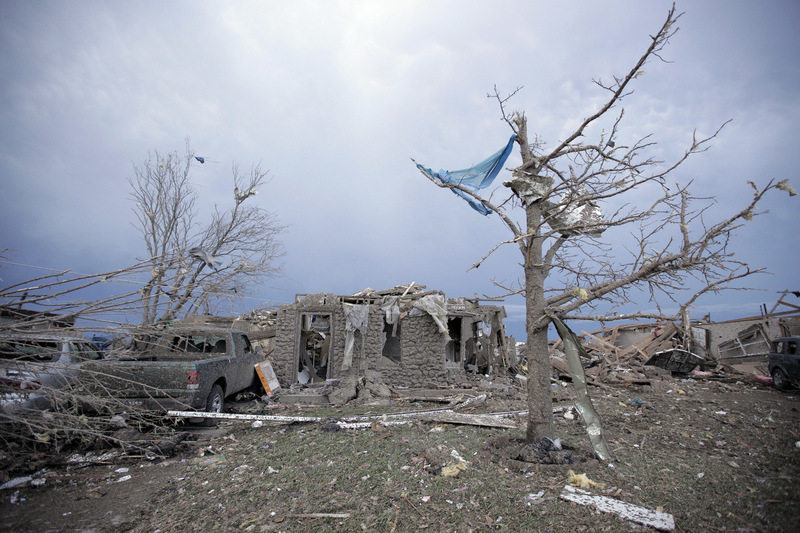 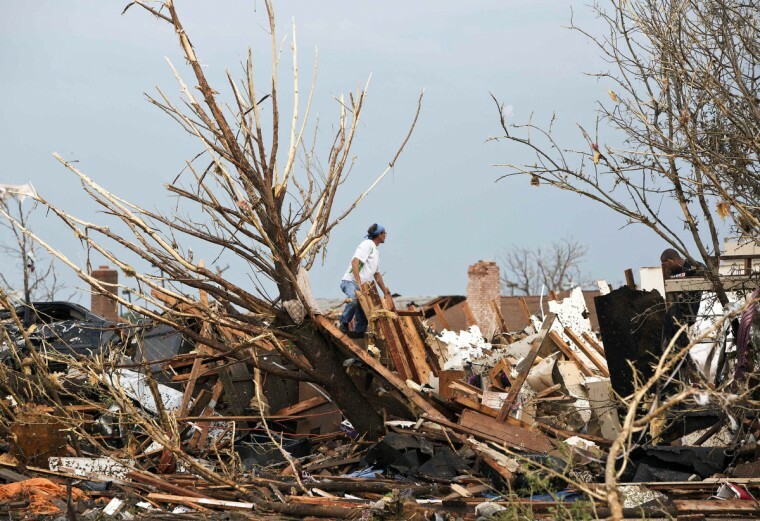 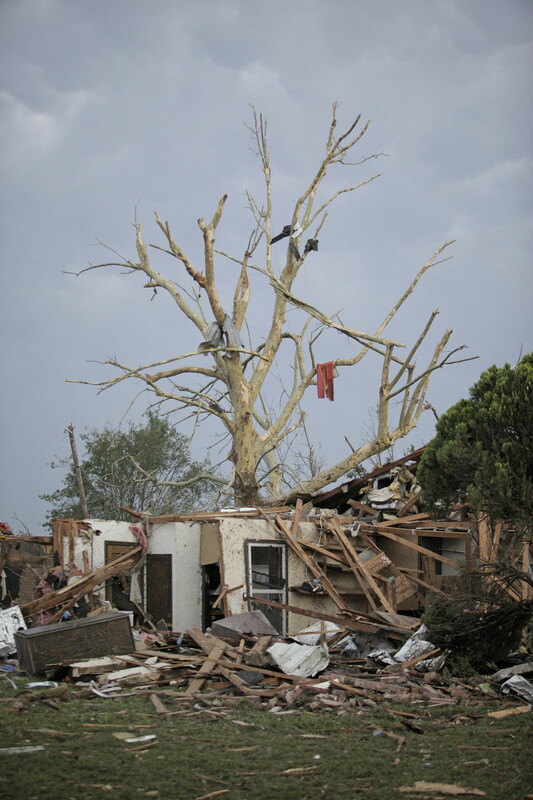 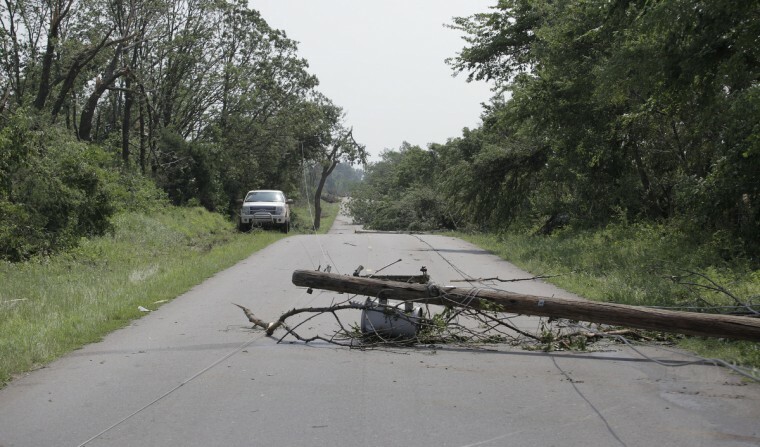 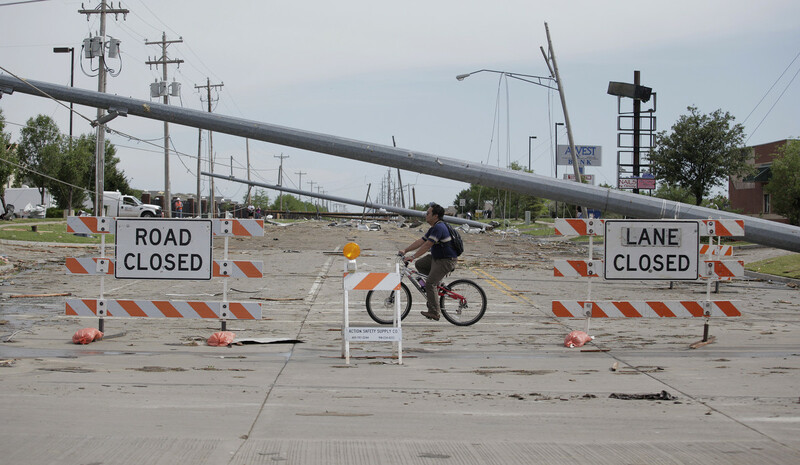 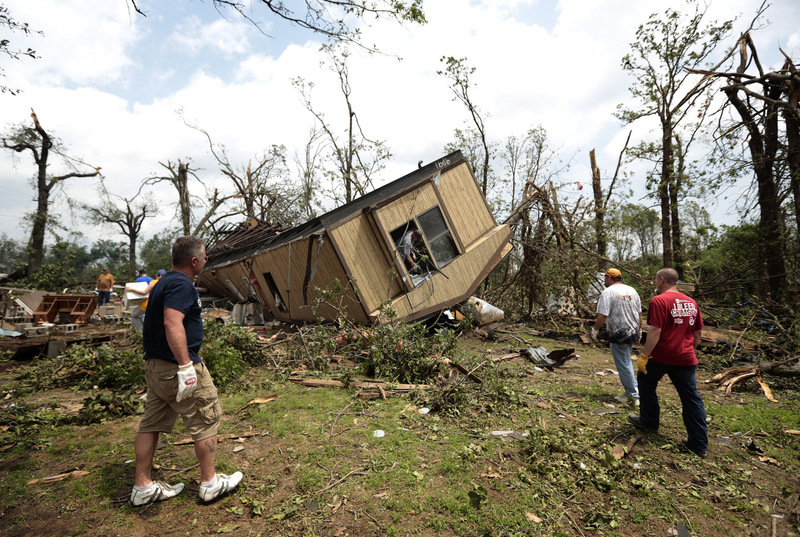 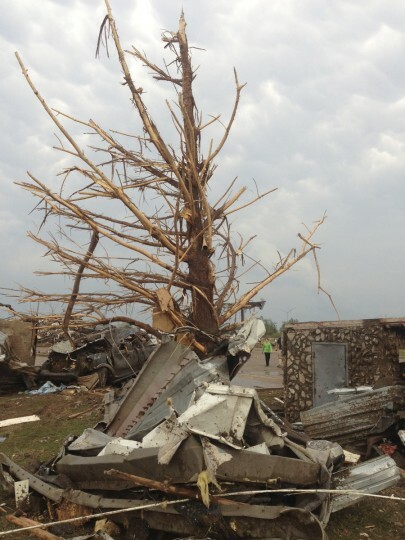 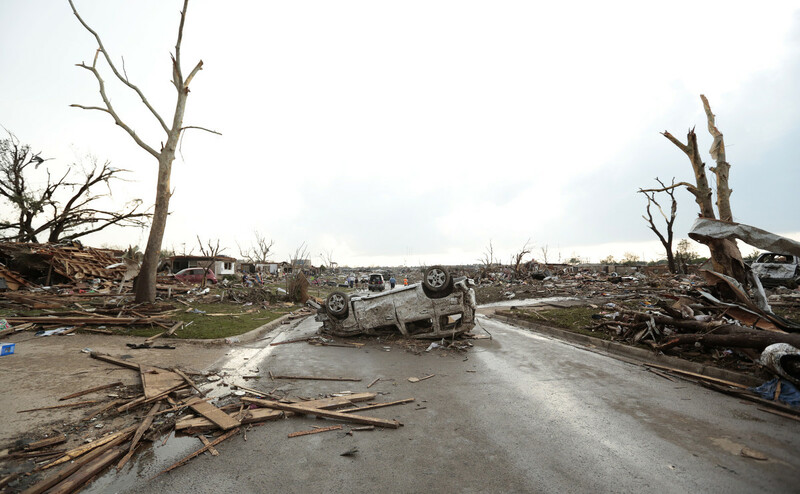 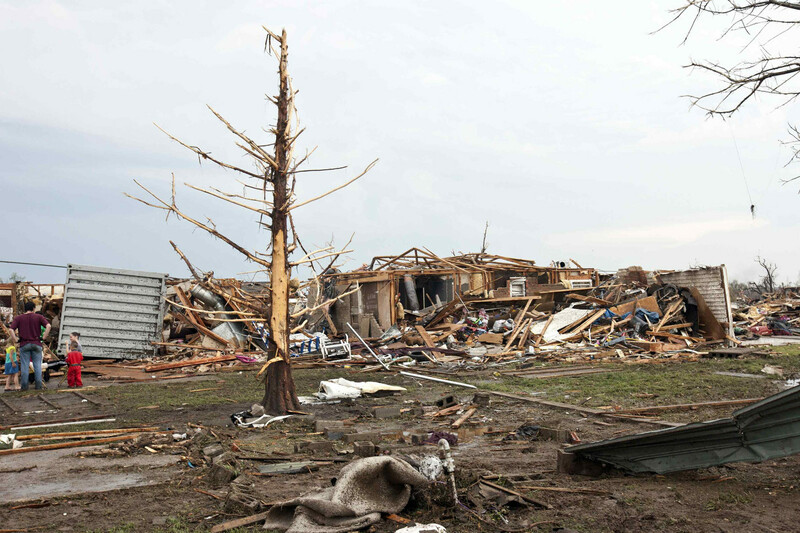 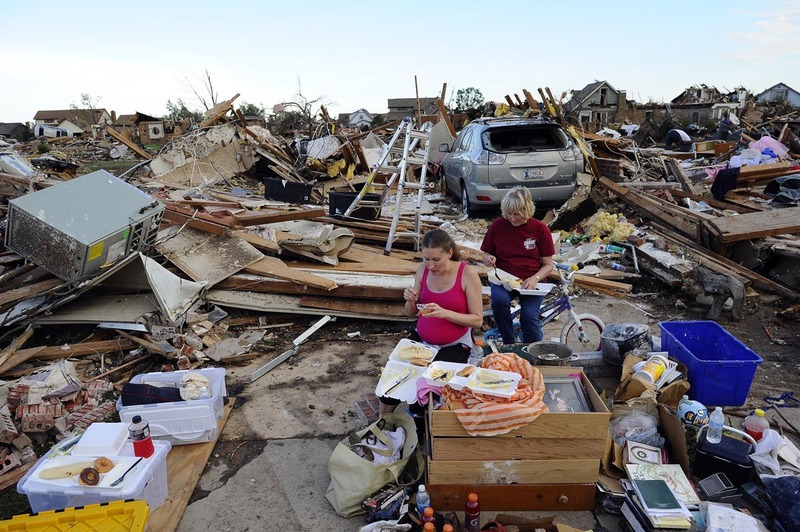 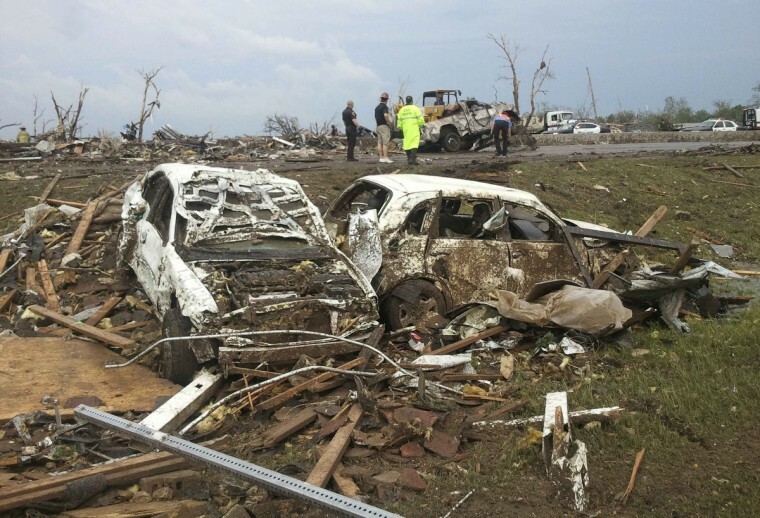 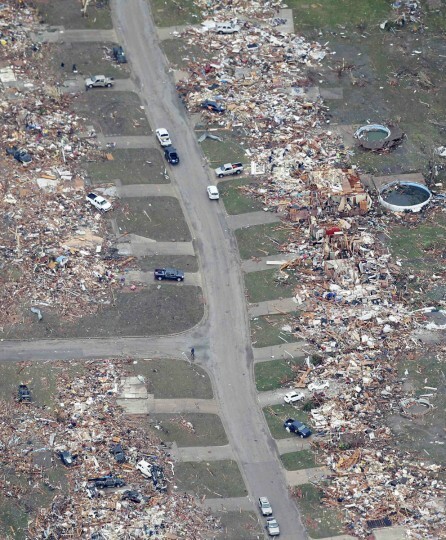 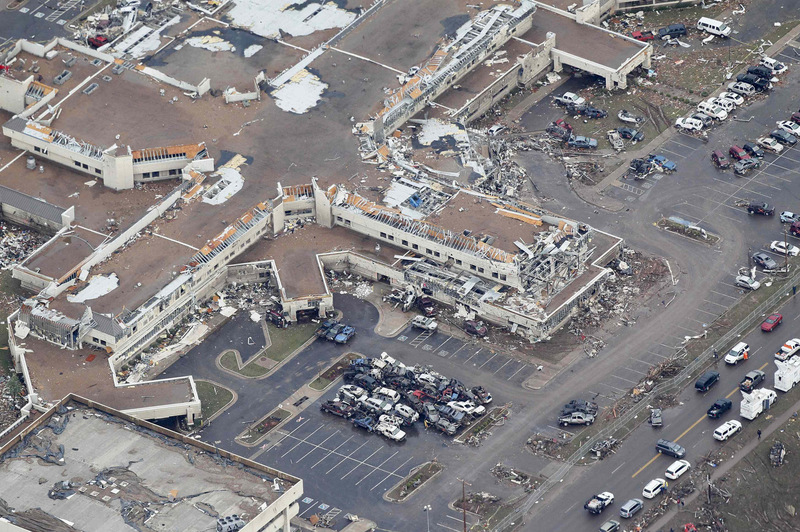 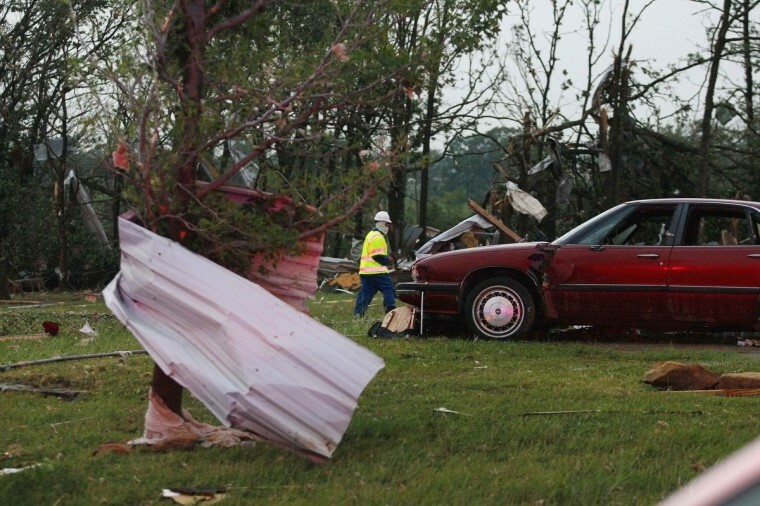 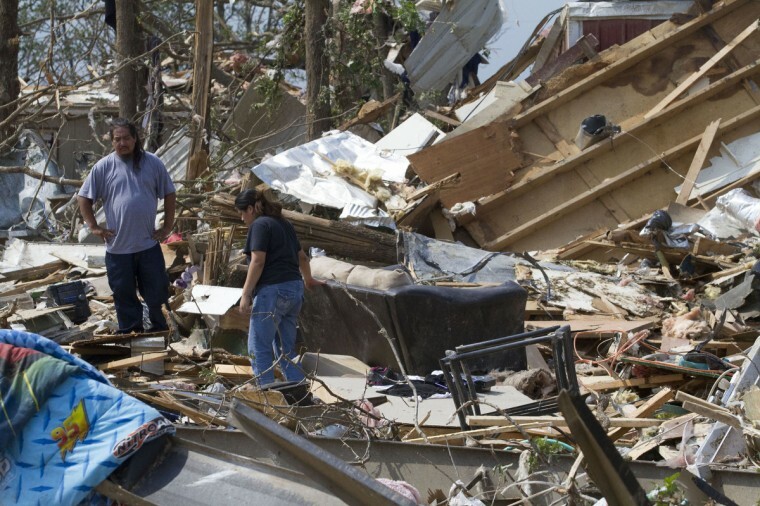 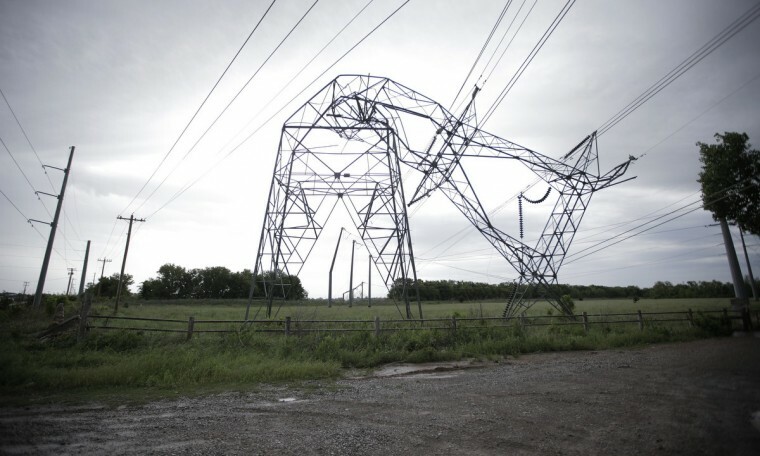 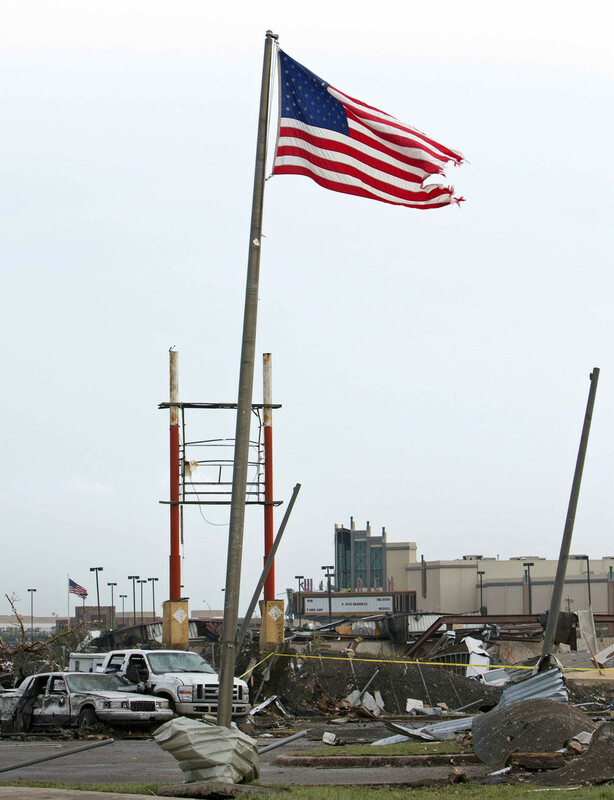 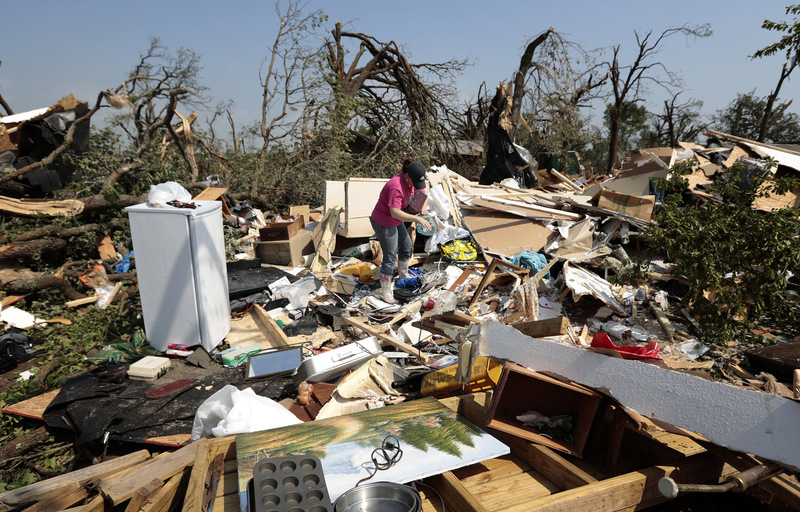 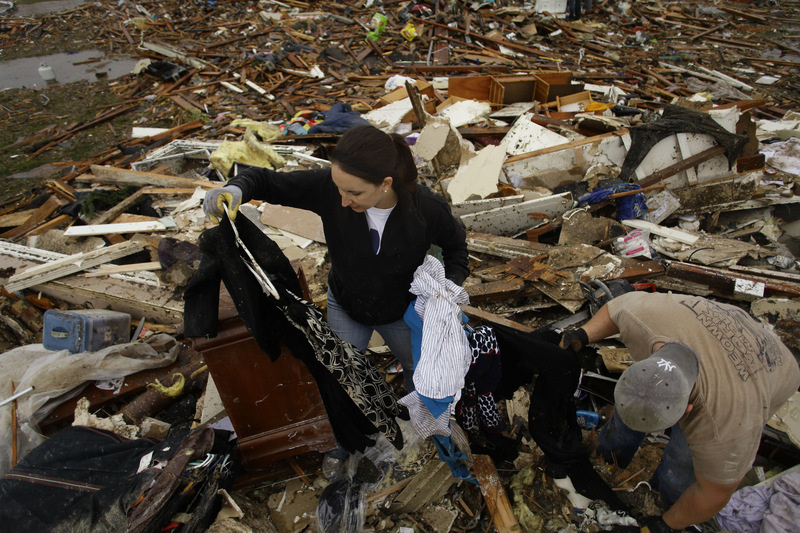 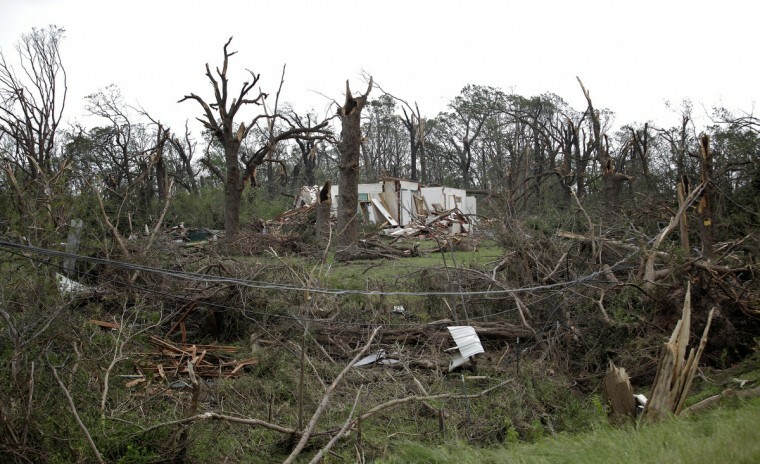 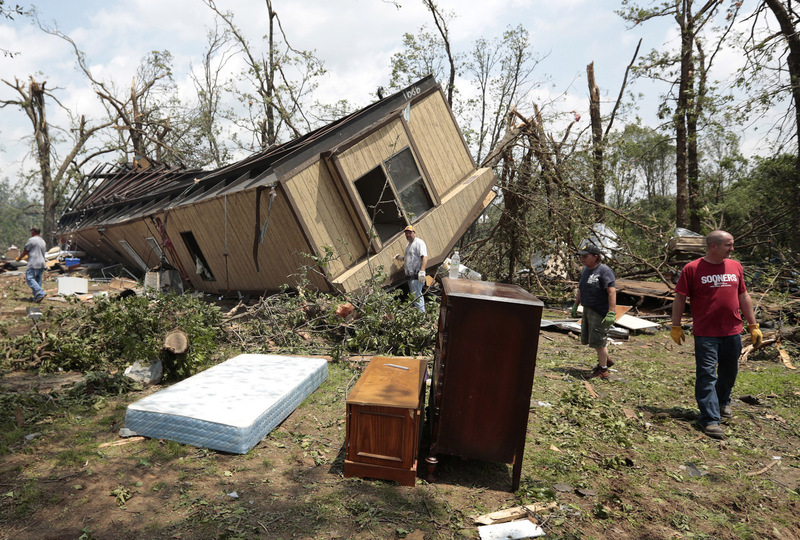 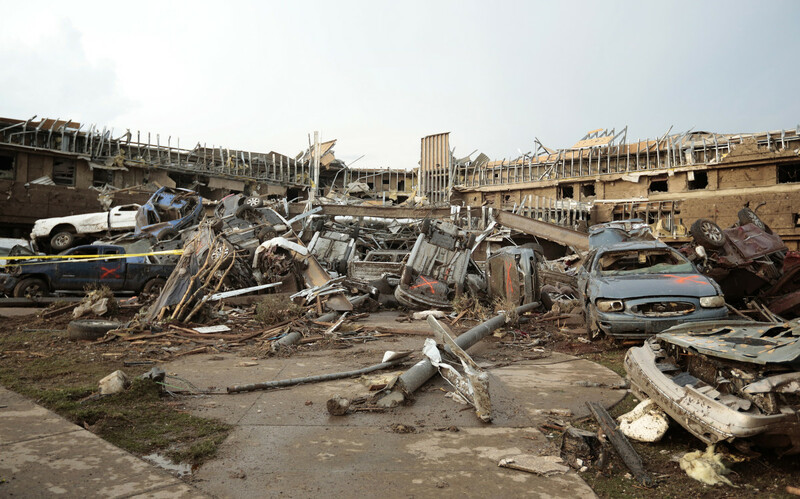 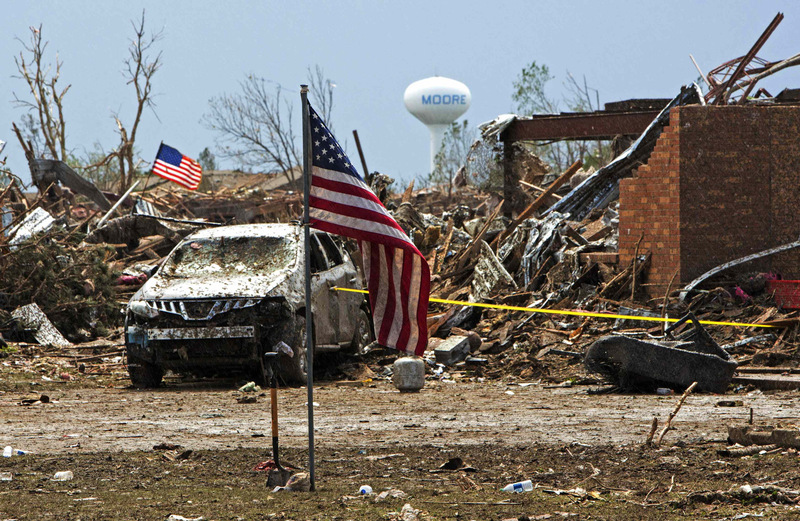 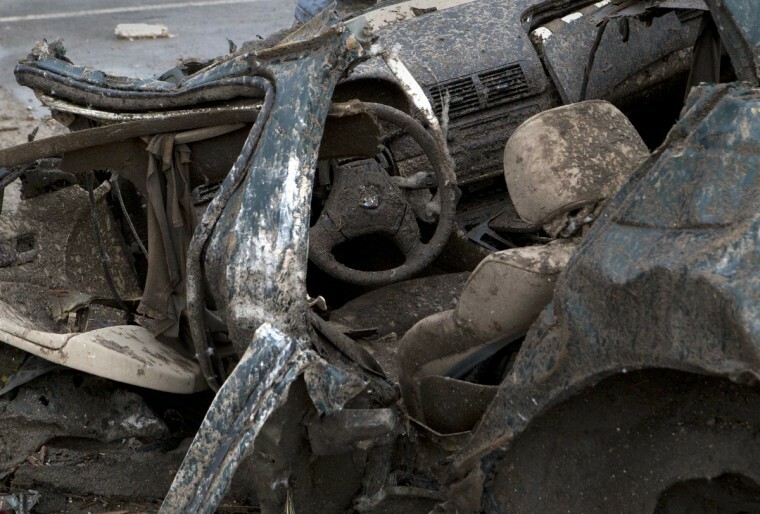 The toll was also a fraction of that of the 2011 twister in Joplin, Missouri, which killed 161 people. 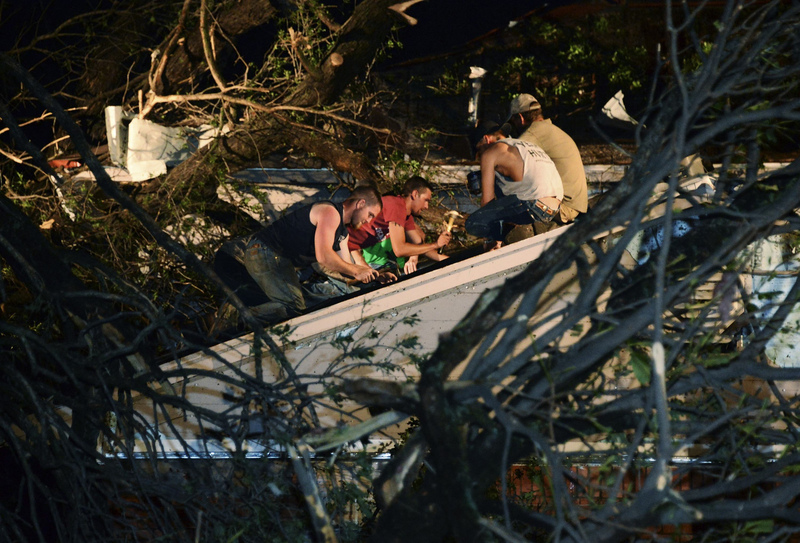 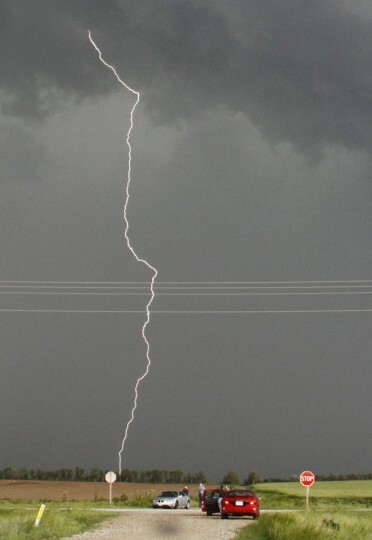 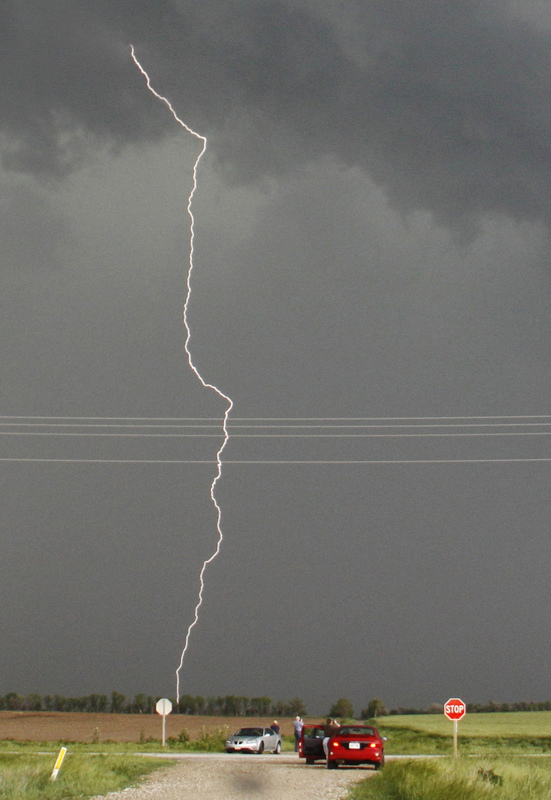 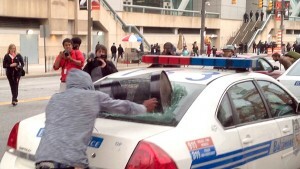 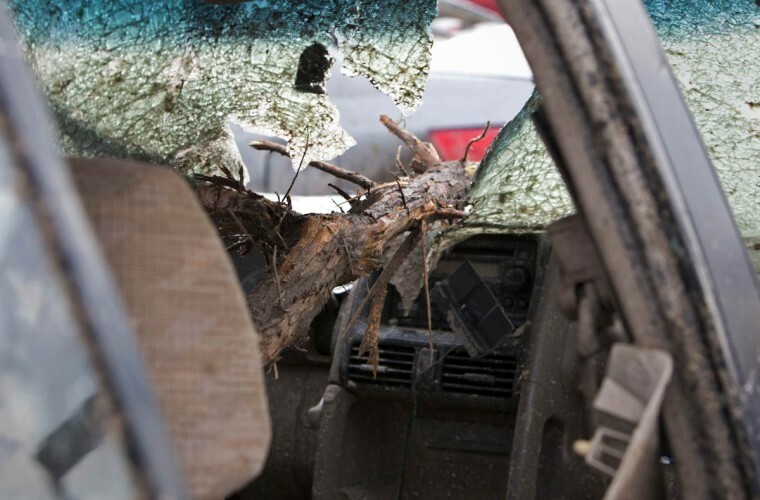 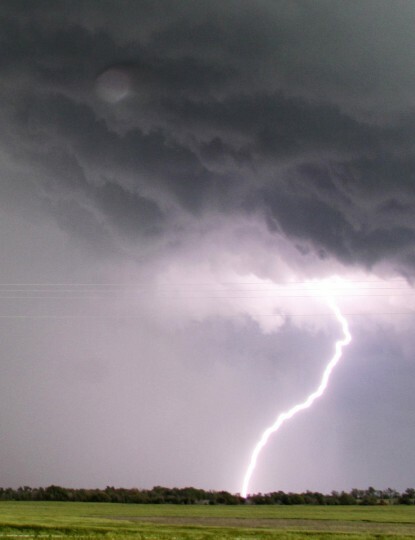 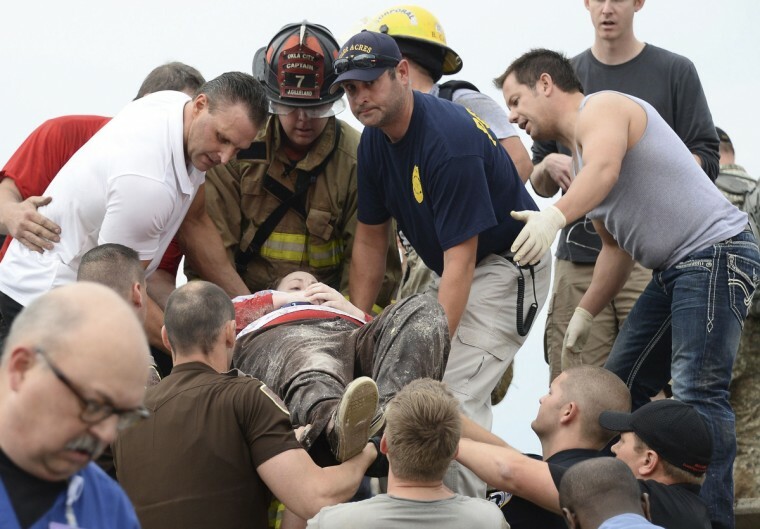 In the hours following the storm, many more people were feared dead. 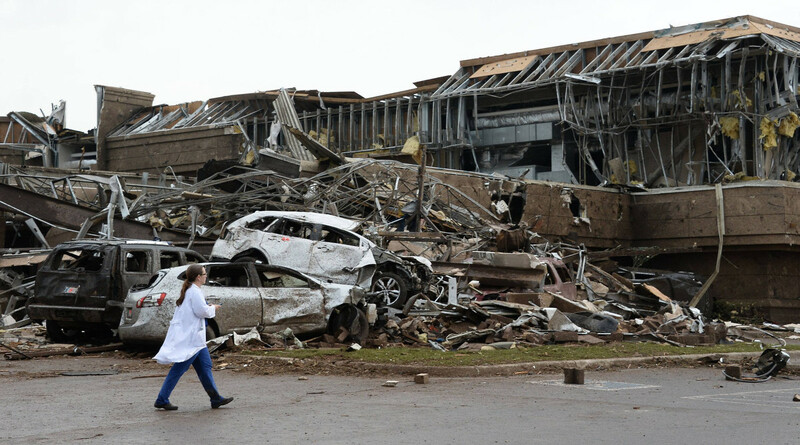 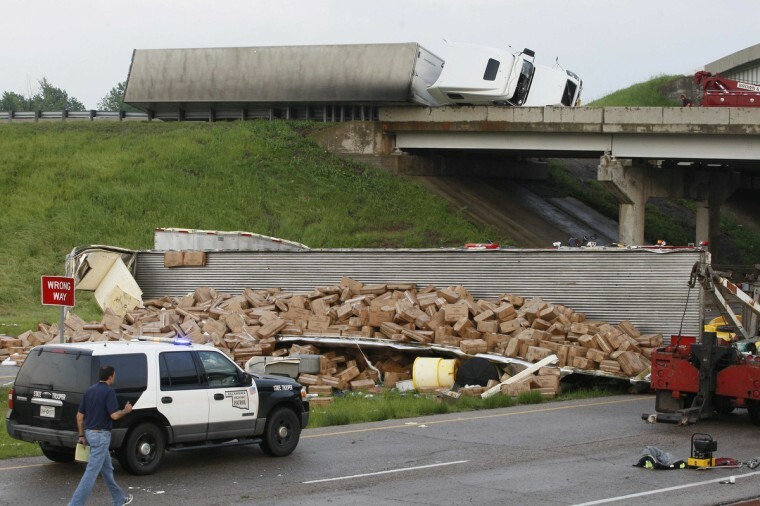 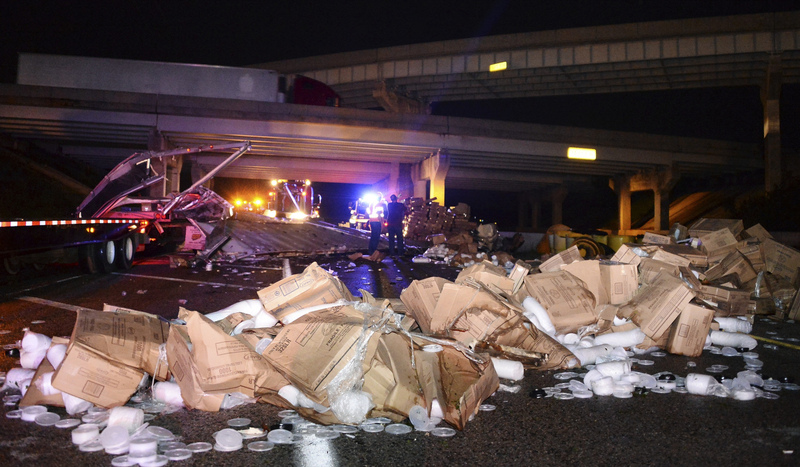 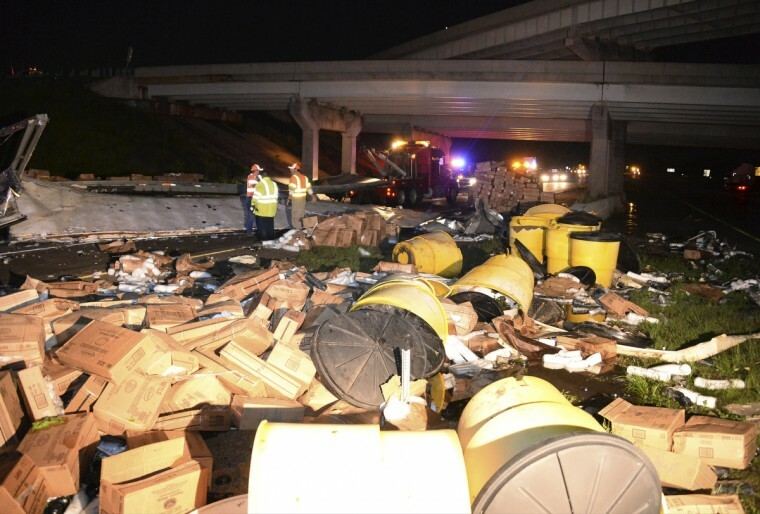 At one point, the Oklahoma state medical examiner’s office said the toll could rise as high as 91, but on Tuesday officials said 24 bodies had been recovered, down from a previous tally of 51. 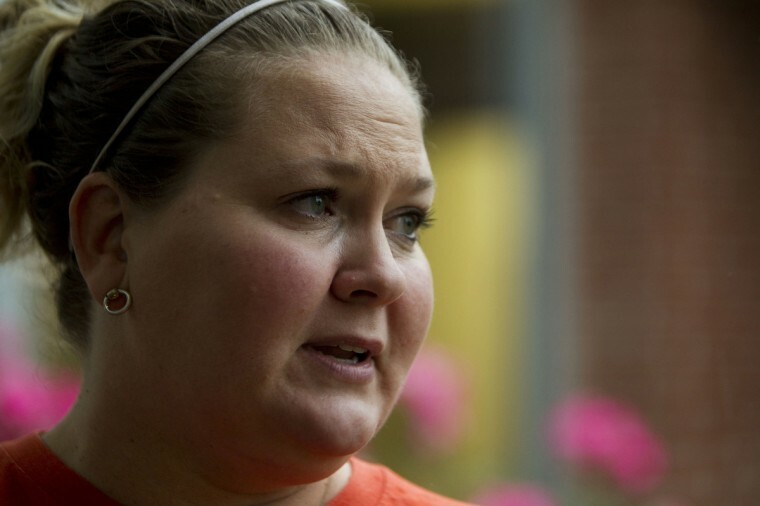 “There was a lot of chaos,” said Amy Elliott, chief administrative officer for the medical examiner. Some ascribe the relatively low number of dead residents discovered in Moore, home to 55,000 people, to the fact many locals have small “storm safe” shelters, basically a concrete hole in the garage floor with a sliding roof that locks. Billy McElrath, 50, of Oklahoma City, said his wife hid in a storm safe in their garage when the tornado hit. 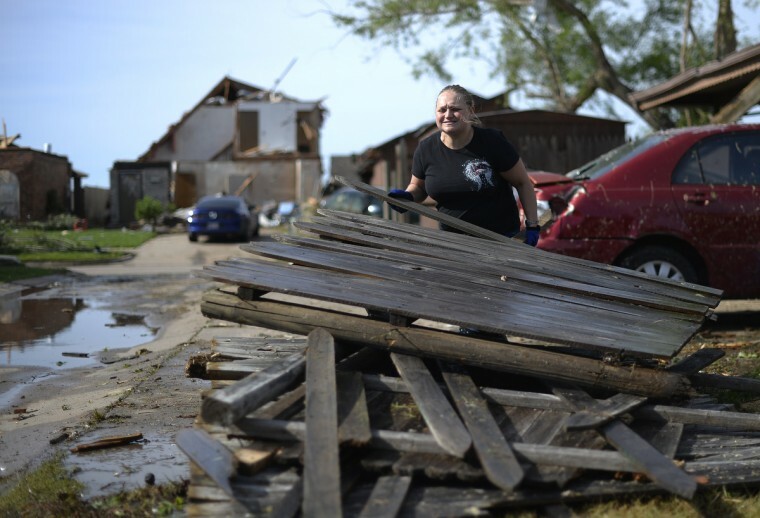 She emerged unhurt even though the storm destroyed the 1968 Corvette convertible she had bought him as a birthday present, and crushed a motorcycle. “Everything else is just trashed,” he said as he loaded a pickup with salvaged goods. 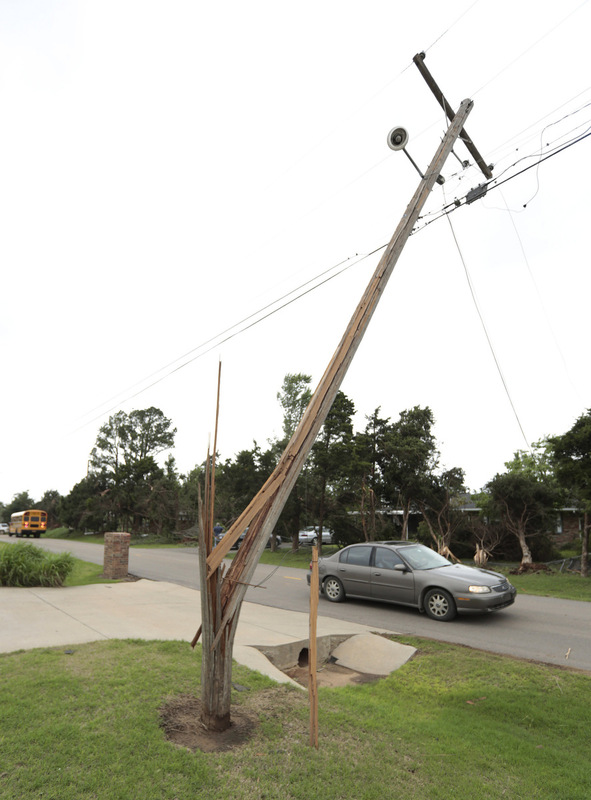 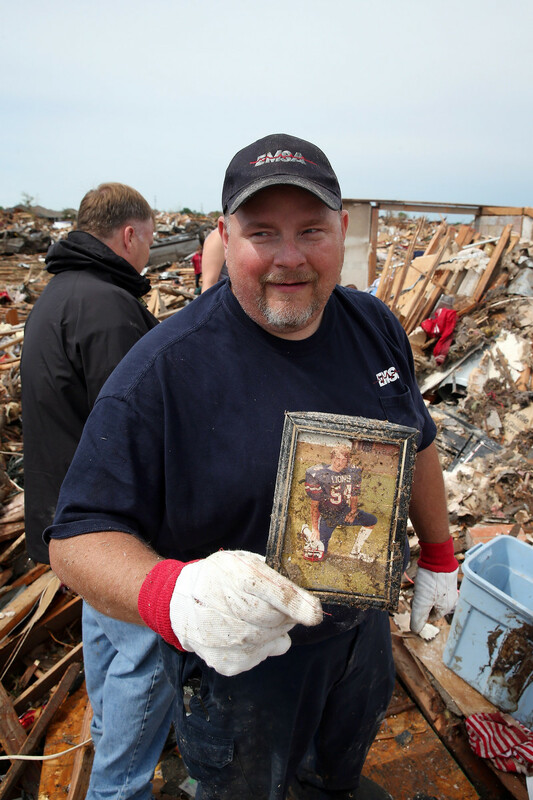 Kraig Boozier, 47, took to his own small shelter in the Westmoor subdivision of Oklahoma City and watched in shock as a fan in the wall was ripped out. 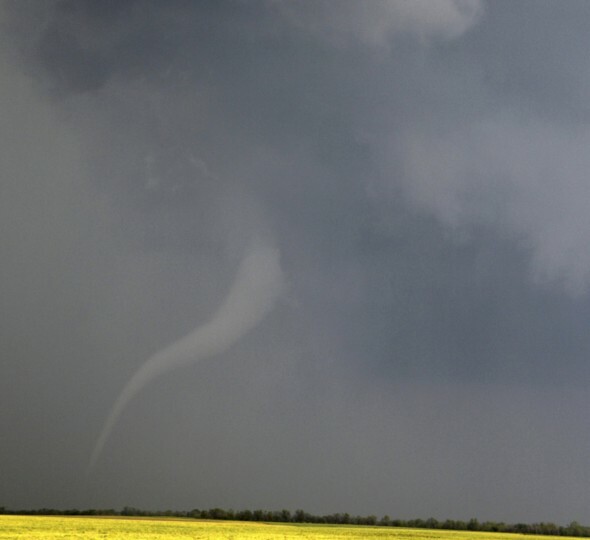 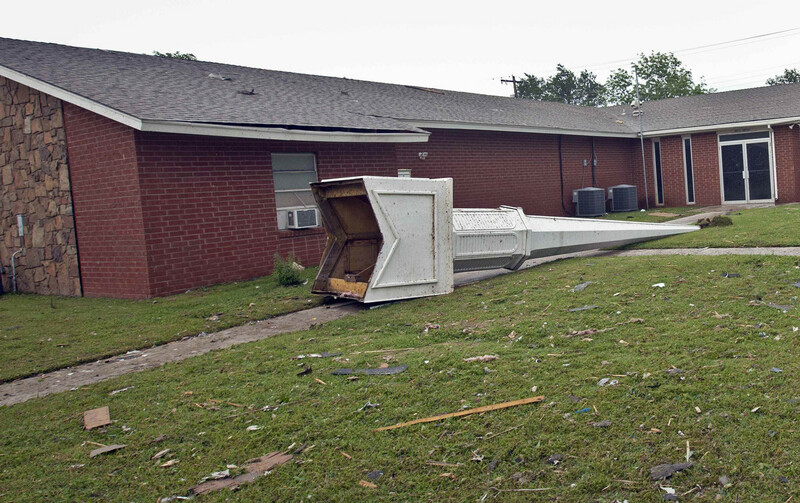 “I looked up and saw the tornado above me,” he said. When he came out after the storm, he helped a neighbor who had emerged from her own shelter move a car that was blocking the entrance to another neighbor’s shelter. 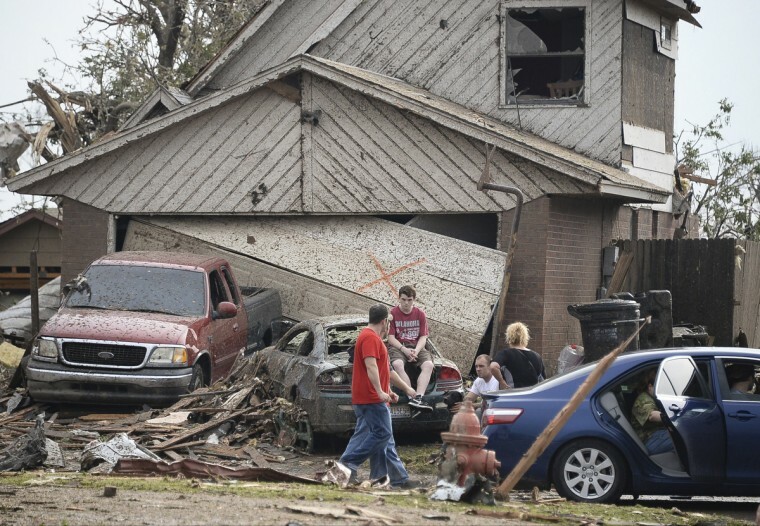 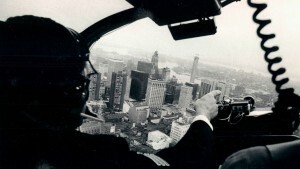 Officials said another factor behind the surprisingly low death toll was the early warning, with meteorologists saying days in advance that a storm system was forming. Once a tornado was forming, people had 15 to 20 minutes of warning, which meant they could take shelter or flee the projected path. 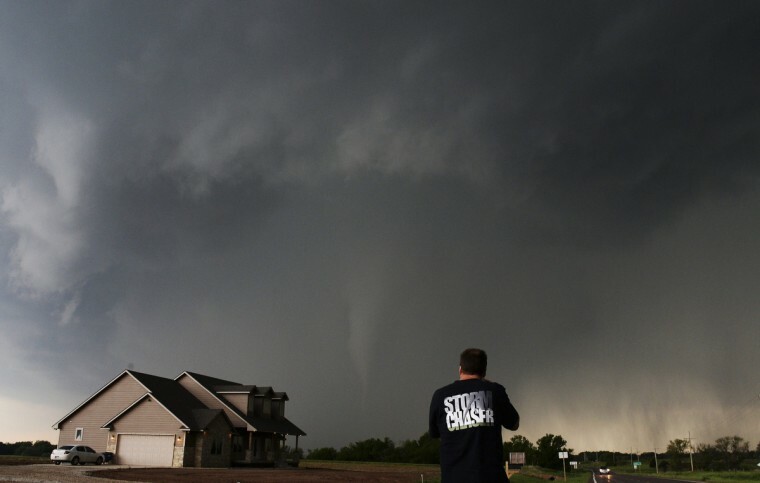 The weather service also has new, sterner warnings about deadly tornadoes to get people’s attention. 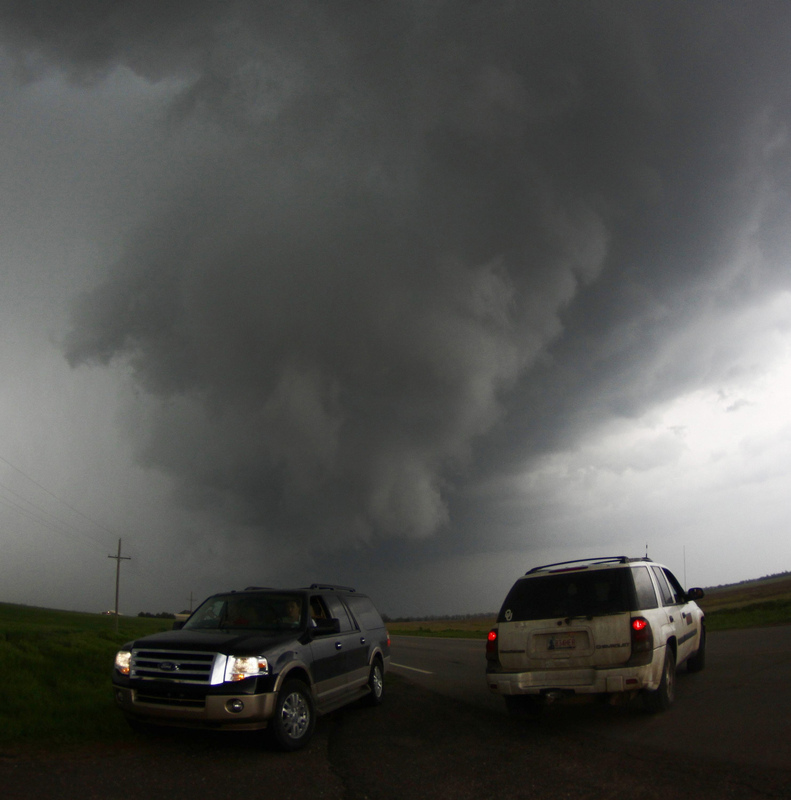 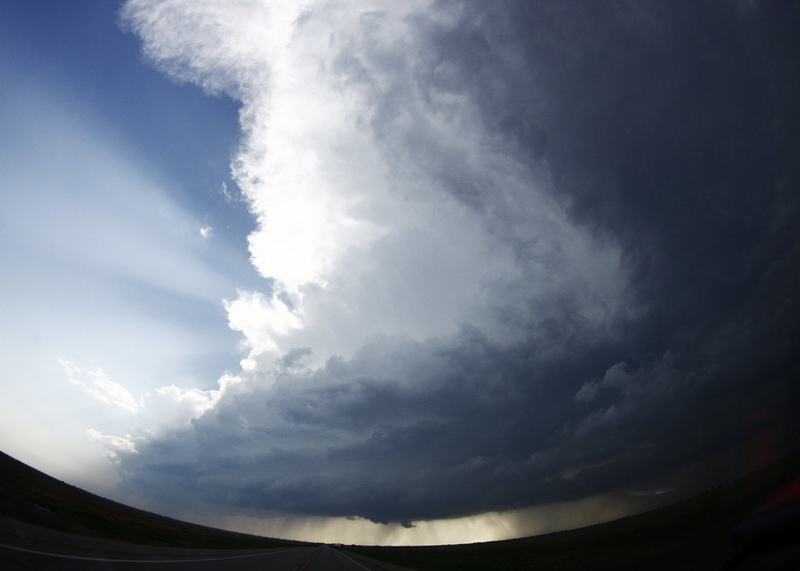 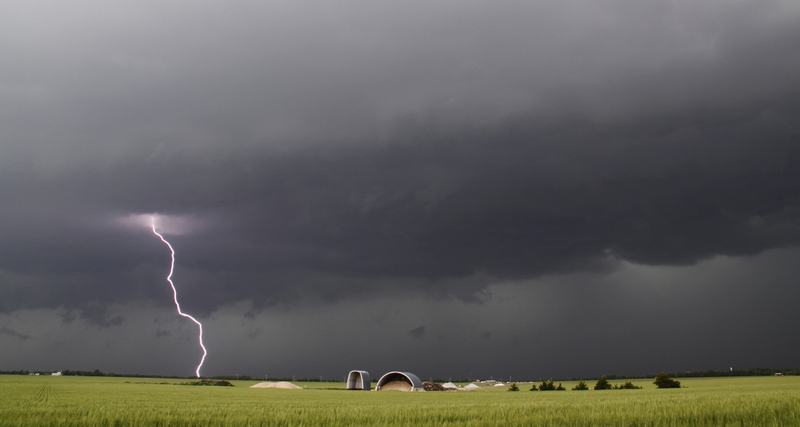 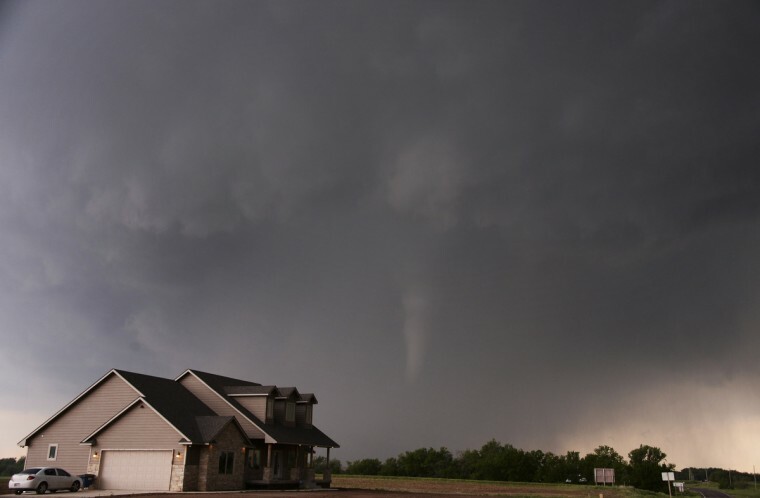 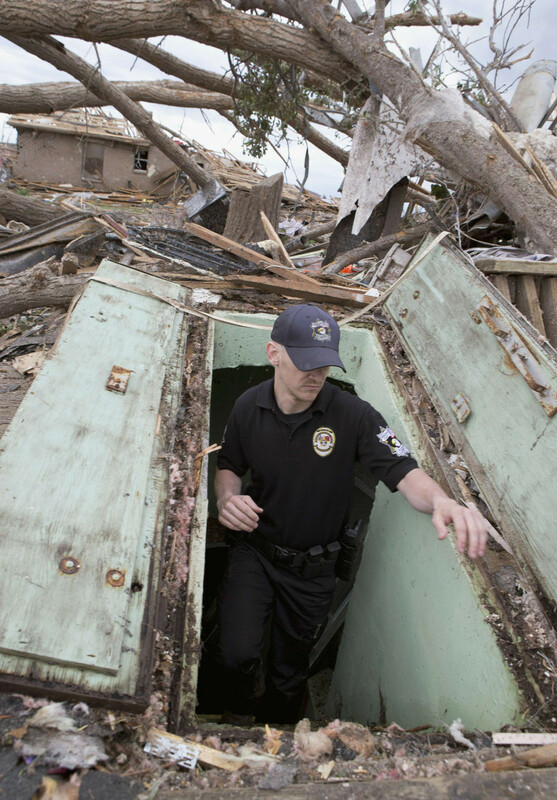 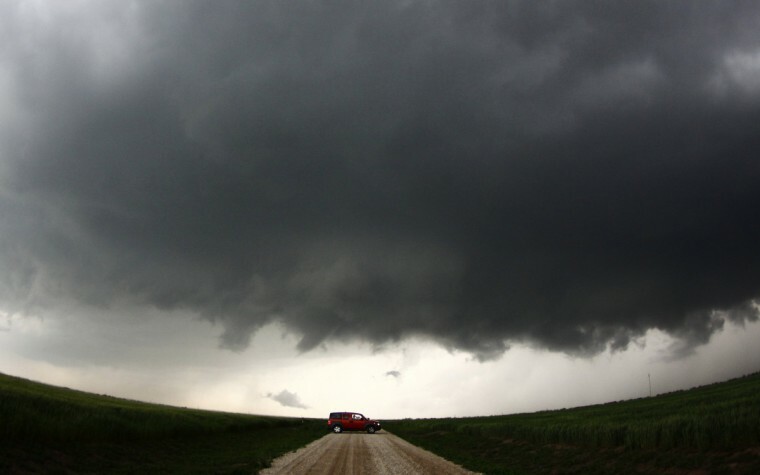 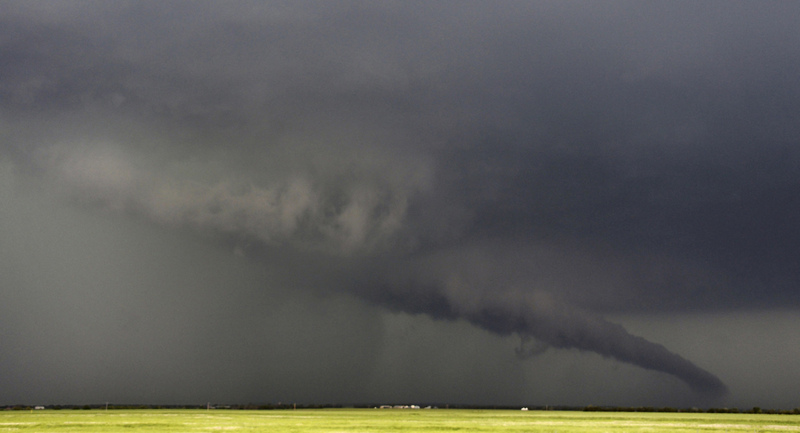 Many of those who do not have a basic storm shelter at home, which can cost $2,500 to $5,000, have learned from warnings over the year to seek hiding places at home during a tornado. 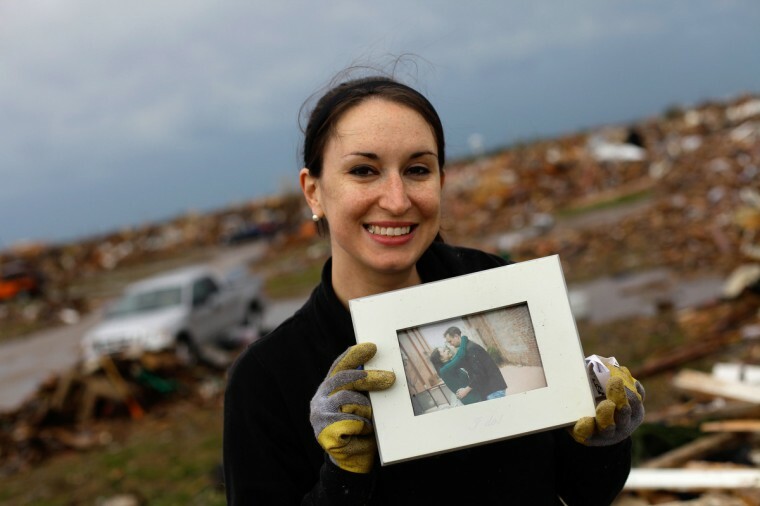 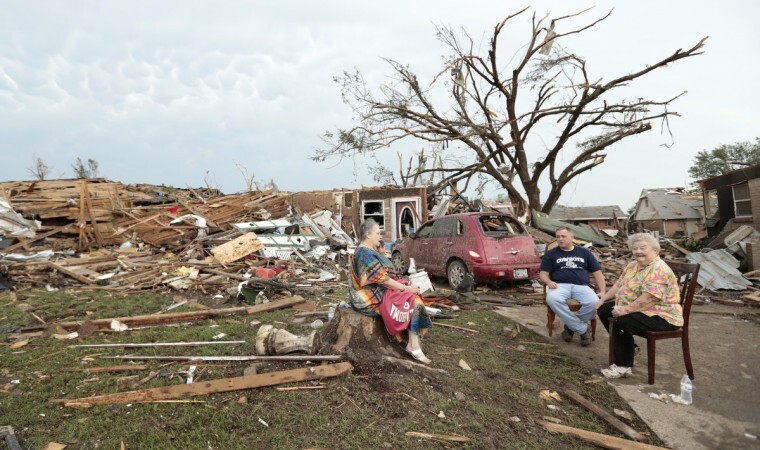 Jackie Raper, 73, and her daughter, for instance, sought shelter in the bathtub in her house in Oklahoma City to survive the tornado. 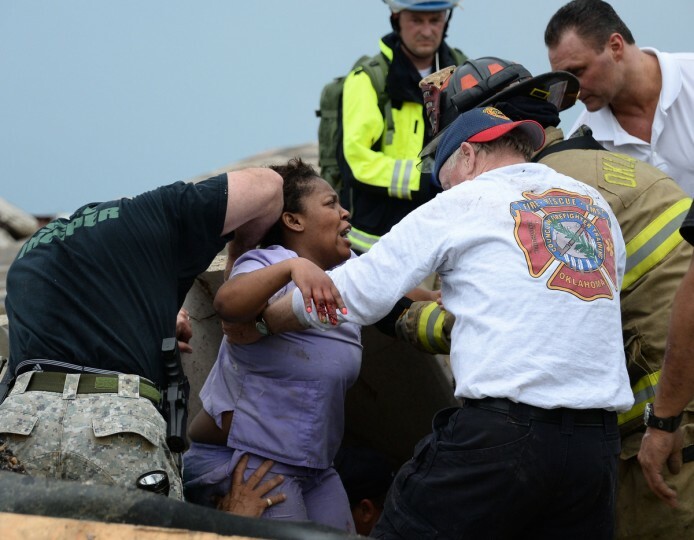 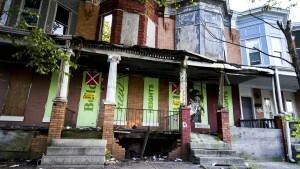 “The house fell on top of her,” said Caylin Burgett, 16, who says Raper is like a grandmother to her. 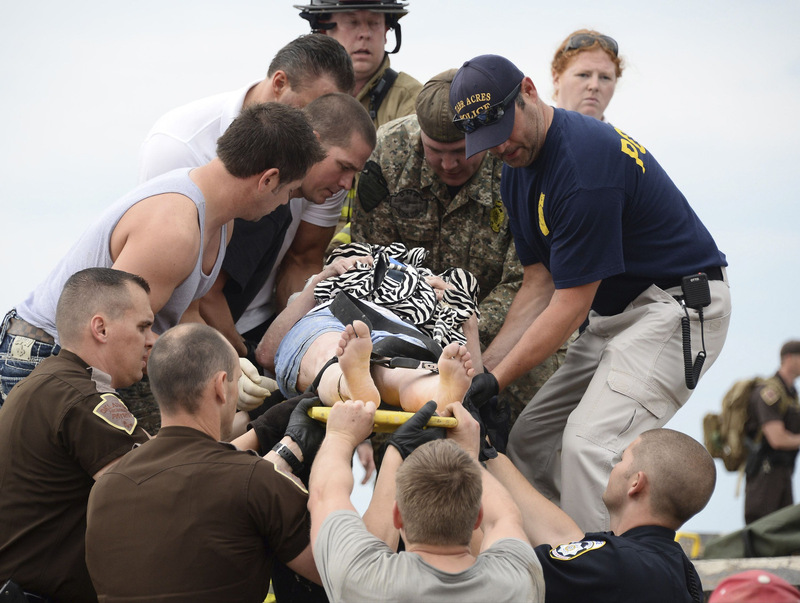 Raper broke her arm and femur, and bruised her lungs, Burgett said. 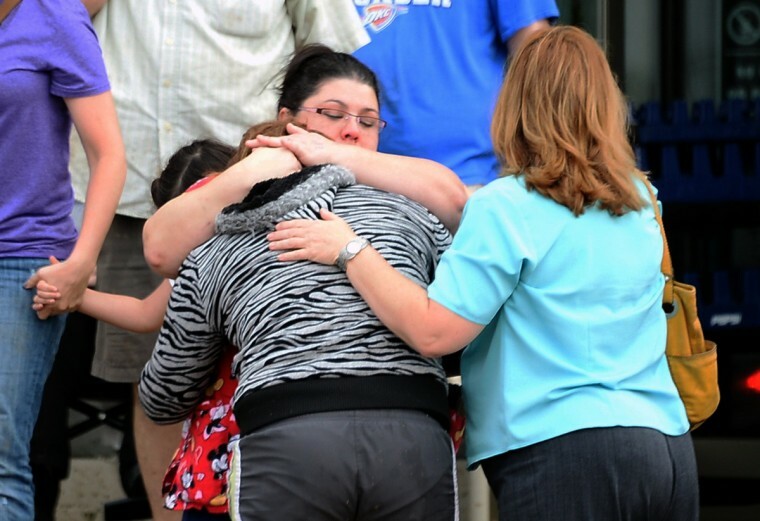 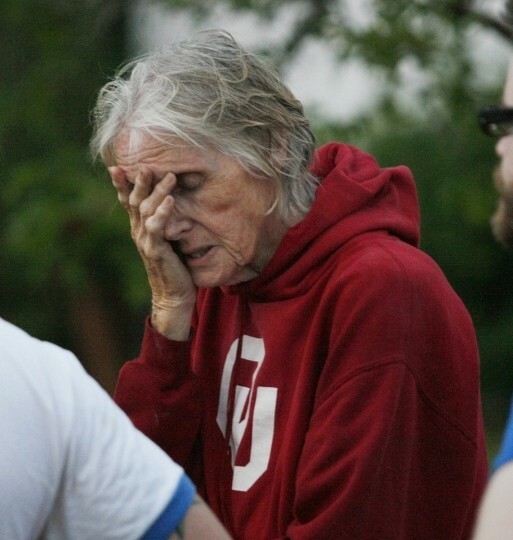 Jackie Raper, 73, and her daughter, for instance, sought shelter in the bathtub in her house in Oklahoma City. 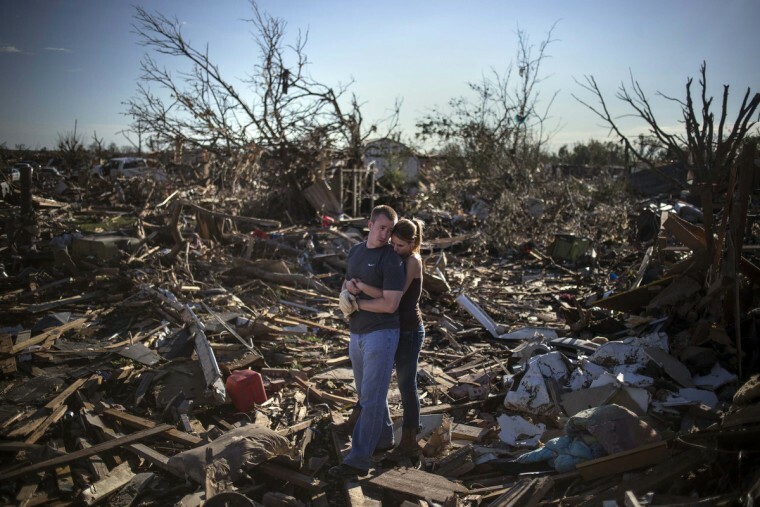 @ Dolph’s comment – I lived in Oklahoma in 1999 when the last huge tornado devastated OKC , and saw the devastation firsthand…it was horrible & heartbreaking. This one they say the devastation is even worse. 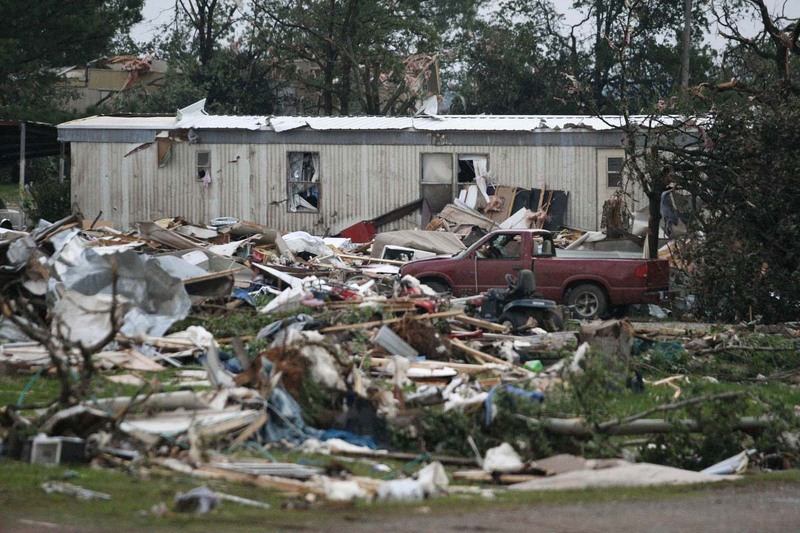 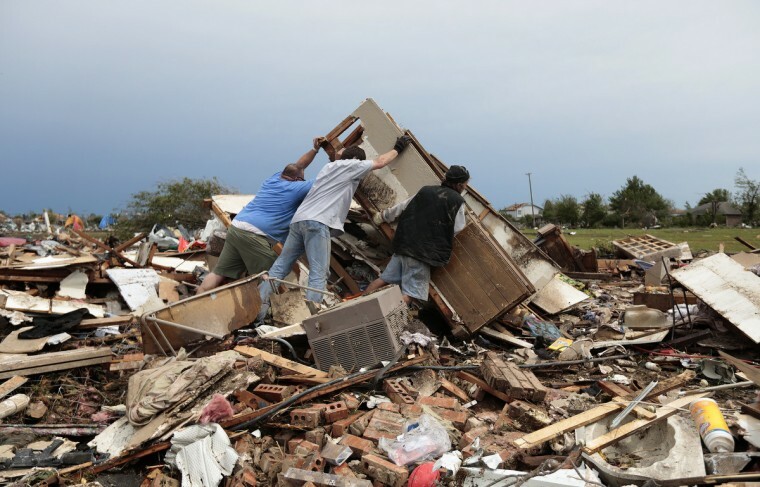 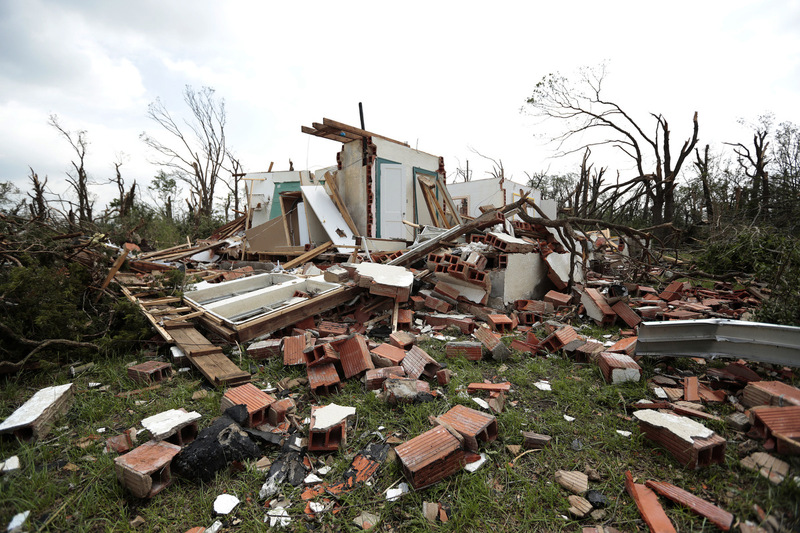 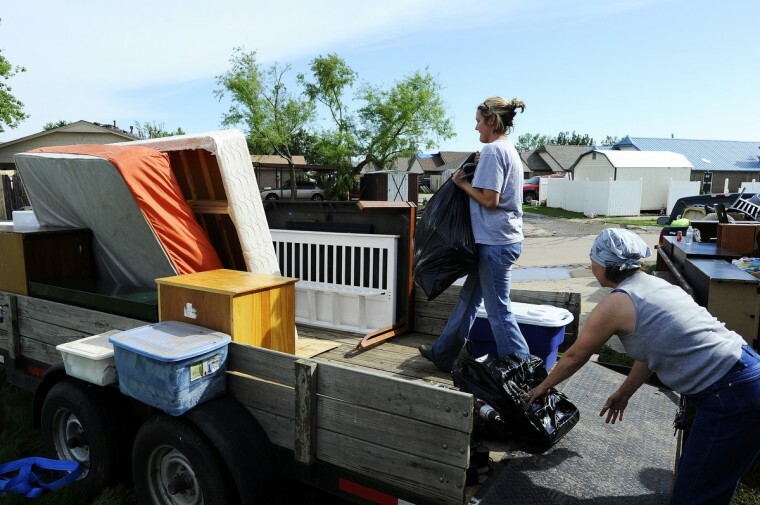 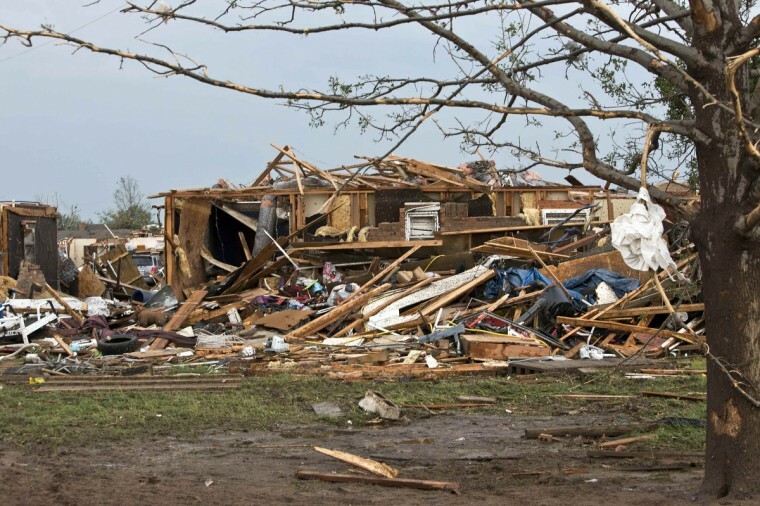 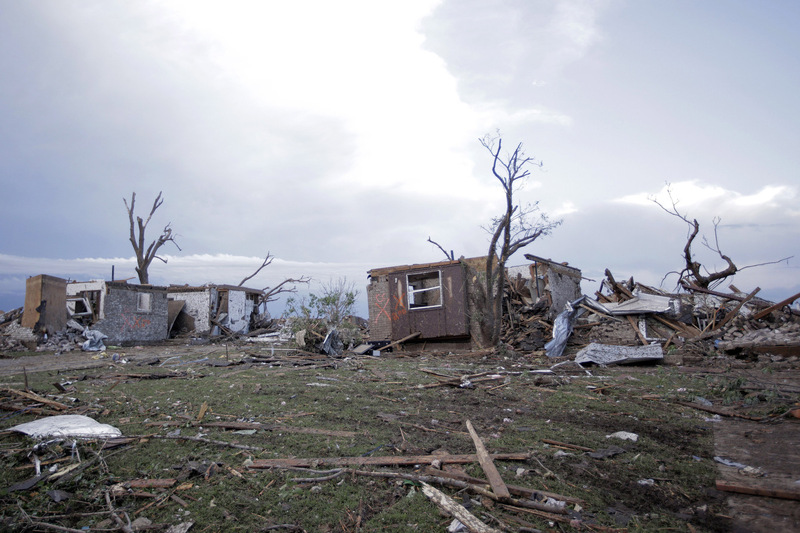 A great majority of people in OKC do not live in mobile homes, but their homes were destroyed. 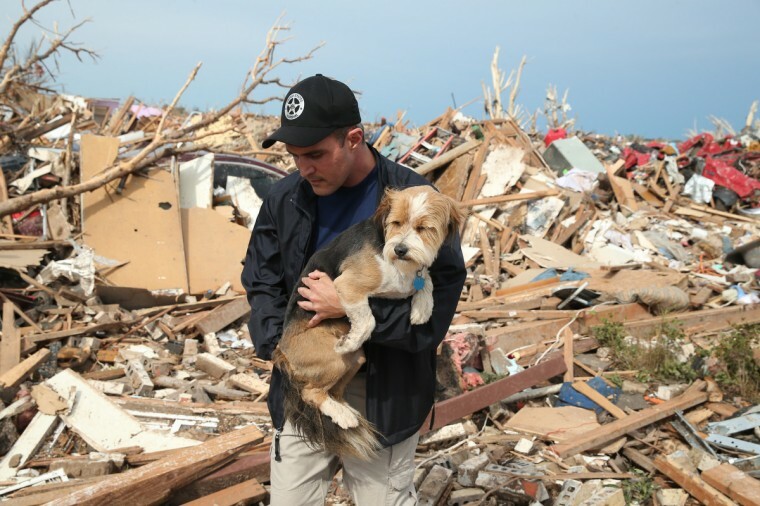 It’s ignorant & heartless to want to turn away and ignore their pain in such a way. 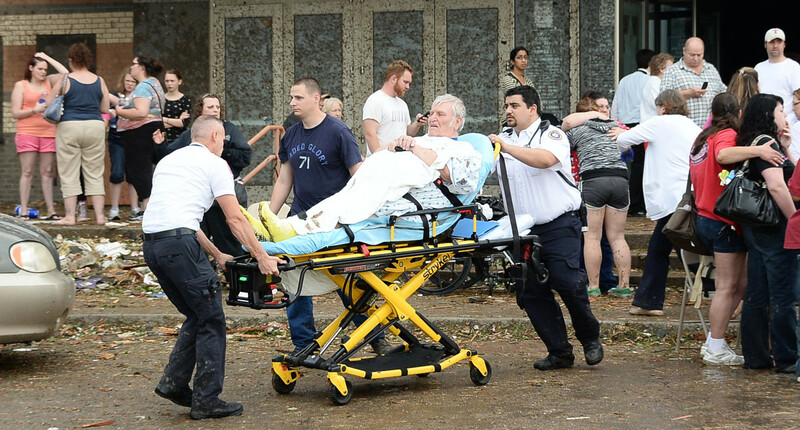 Not only ignorant to assume these people put themselves in danger by living in mobile homes ( as if the entire city is nothing but), but also to assume that the majority of Oklahoman’s laughed at the tragedy of Hurricaine Sandy. 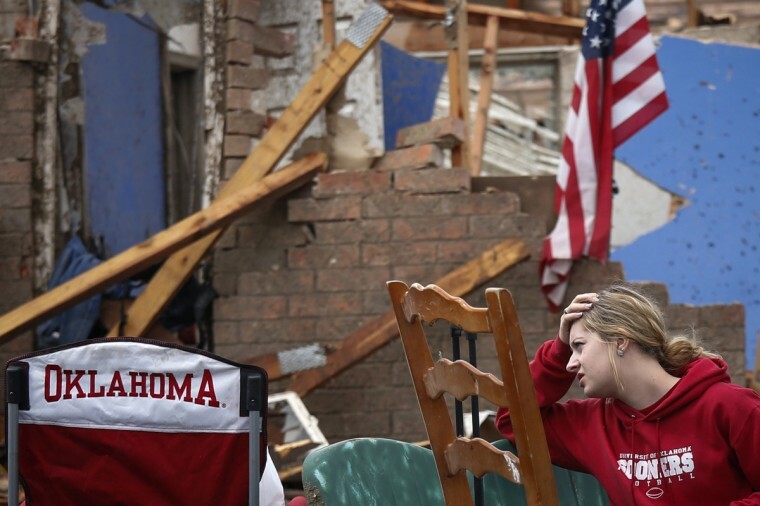 There are a lot of good people in Oklahoma who share the heartache of others throughout the nation when they are hit by natural & other disasters, who pray for them, and who try to help by donating time, rescue efforts & Red Cross Donations. 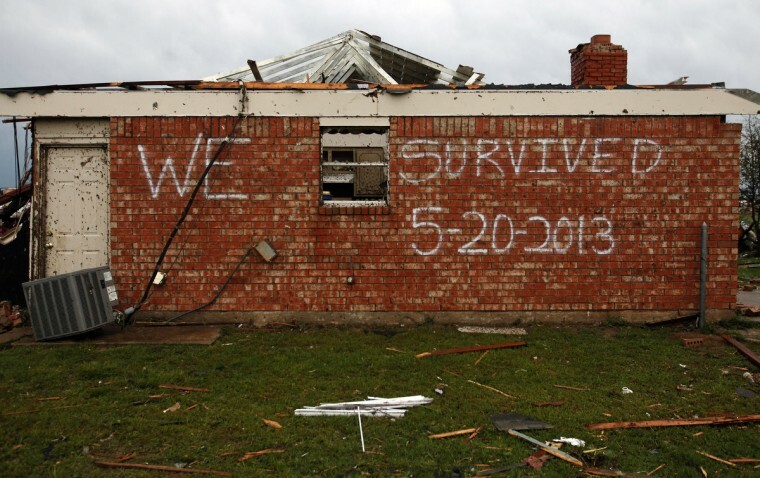 You ought to be ashamed of yourself for making such a comment. 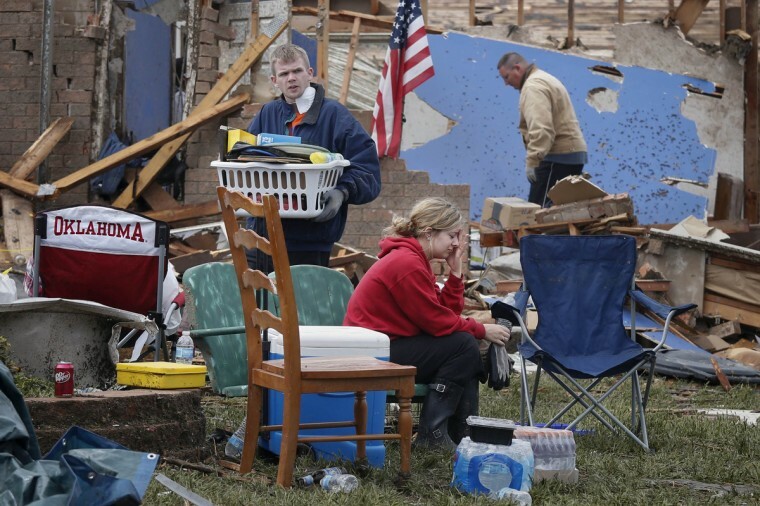 God forbid that you ever suffer a tragedy & people turn away from your pain & suffering & refuse to help. 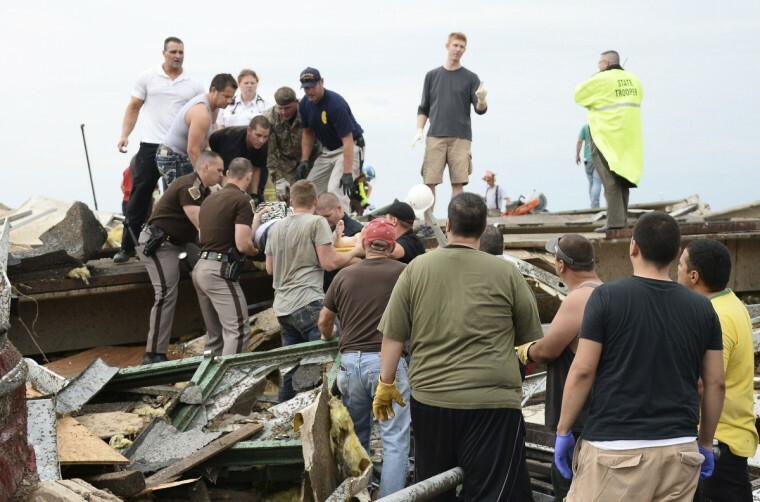 Weren’t these the same red-state fools who laughed when Sandy hit NY/NJ and wished their tax dollars wouldn’t go to support people’s homes being built in obviously unsafe areas? I wish my tax dollars didn’t go to support people living in mobile homes in obviously unsafe areas where tornadoes happen more often than black-on-black crime in the projects. Let them sell their guns to pay for their new lives instead! 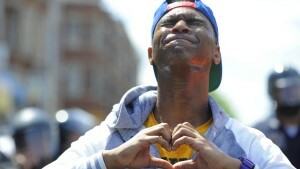 How could you say something like that? 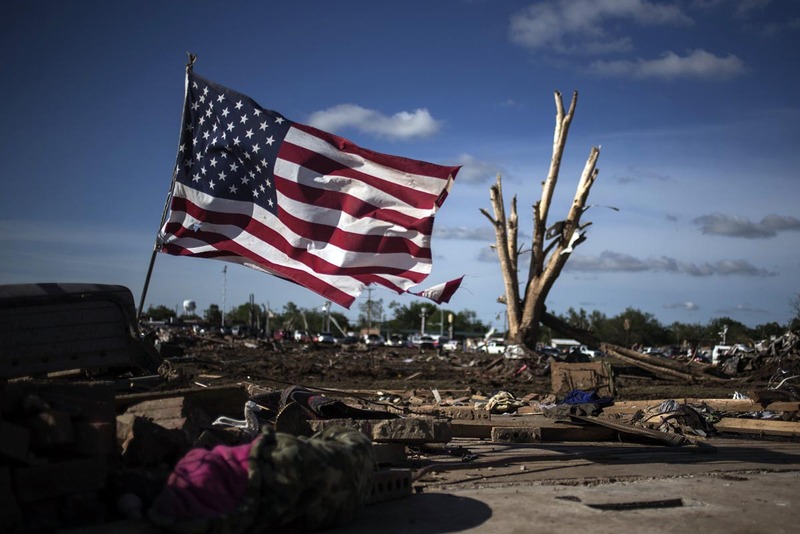 I honestly hope you do not mean what you said and that you are just venting from a tramatic life experience that your embarassed to talk about. 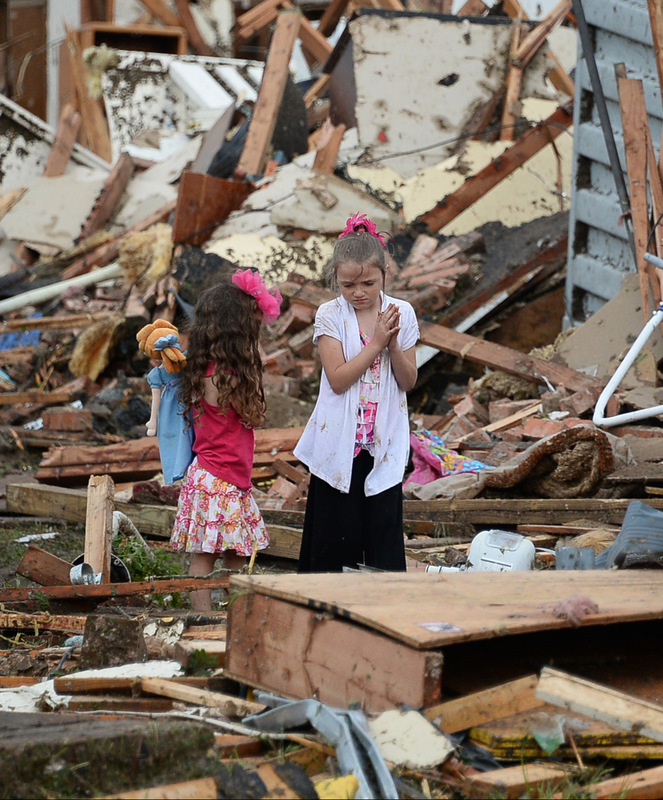 we are need to get down on our knees and ask god for help . I think god has already done enough. 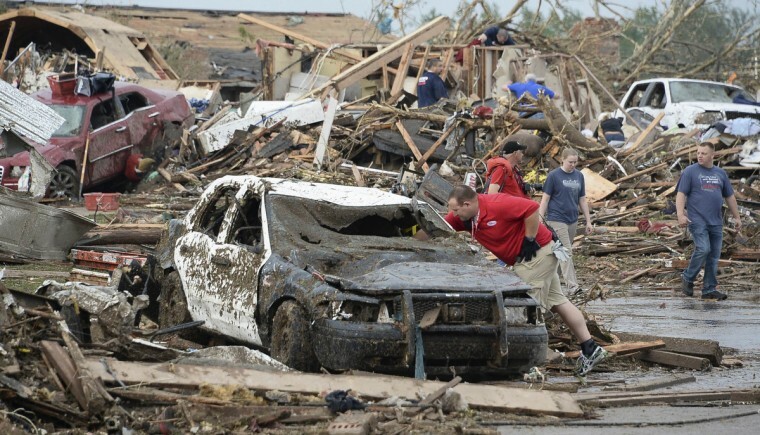 You need to quit blaming God for this and face that you need to get on your knees and pray to him. 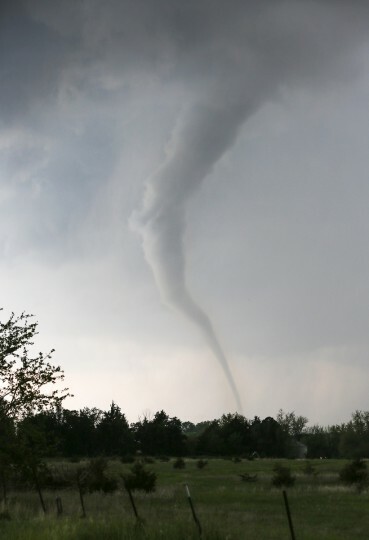 Dont you think them getting hit by this tornado is enough? 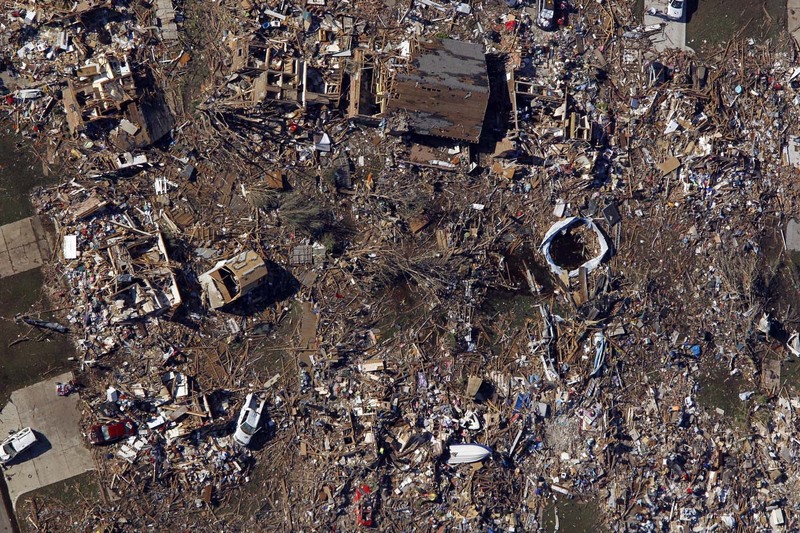 And now blaming God for it too?